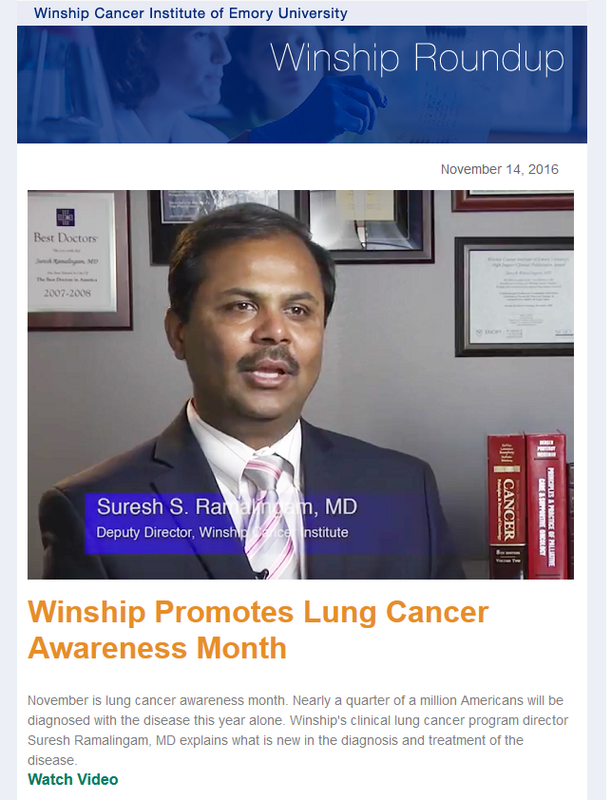 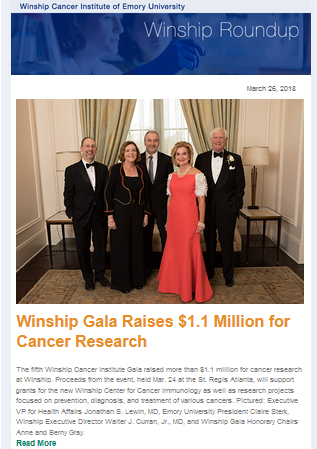 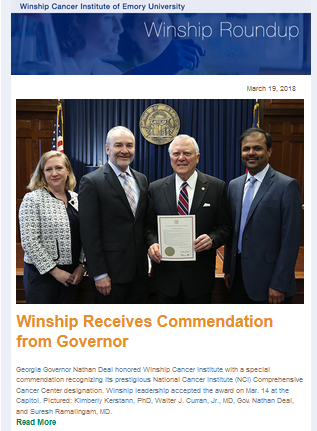 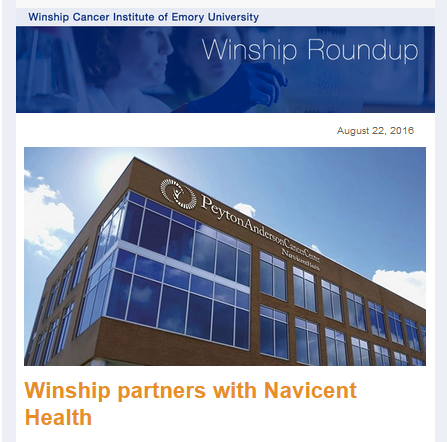 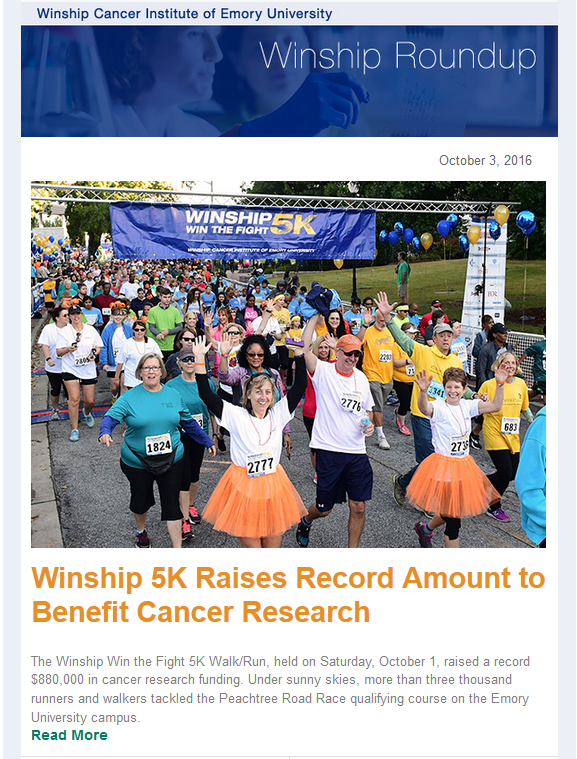 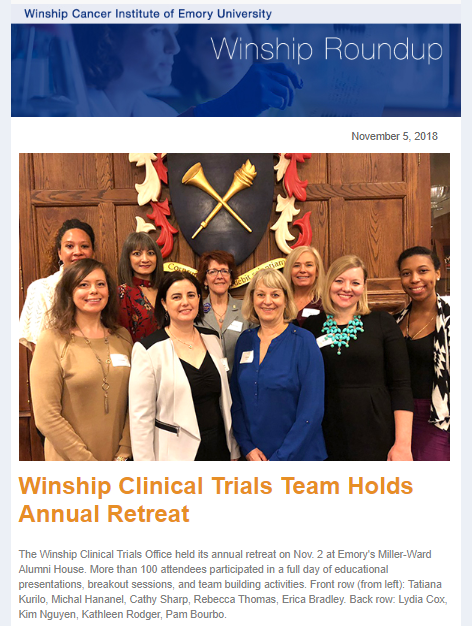 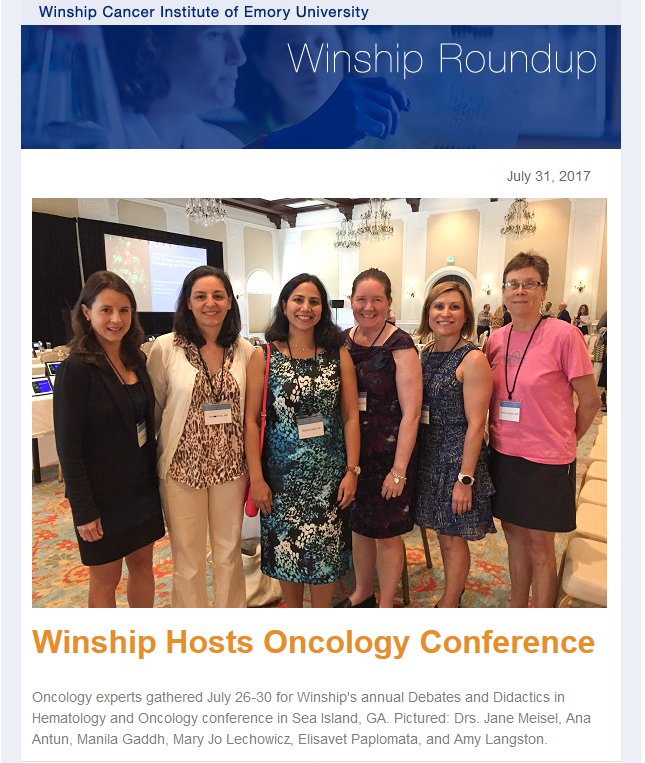 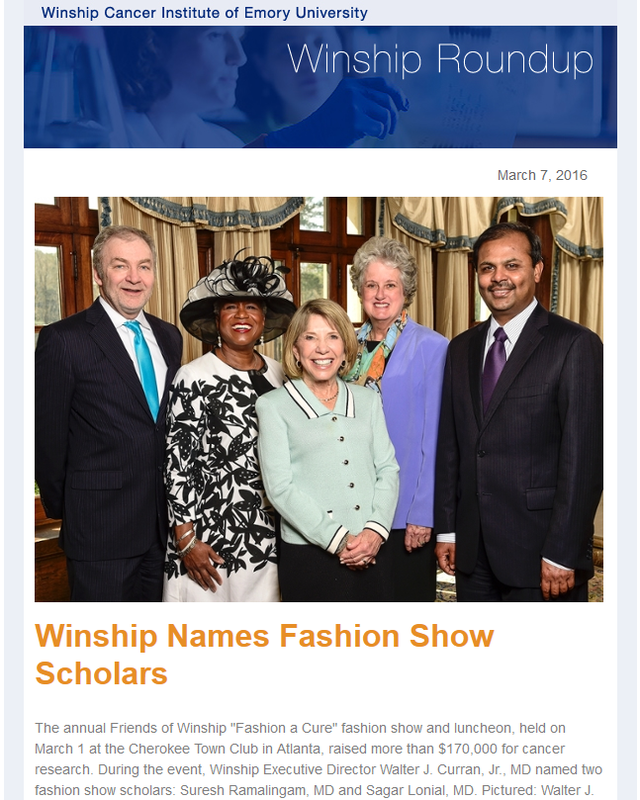 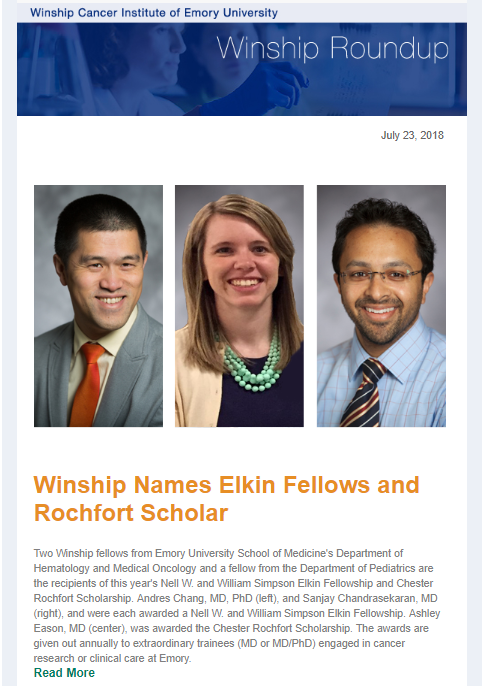 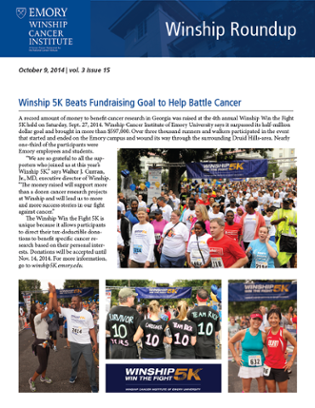 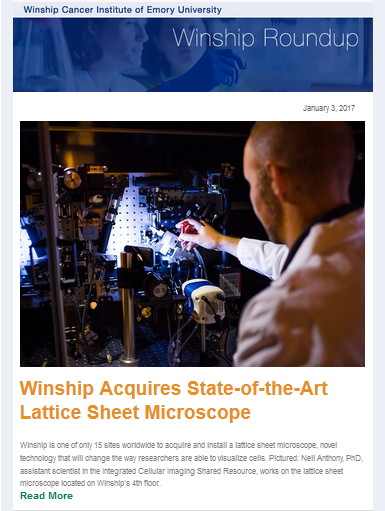 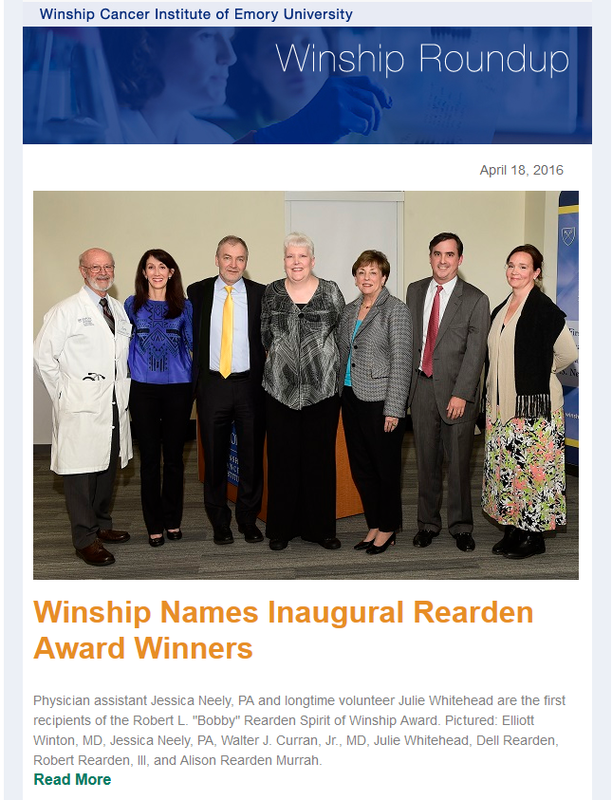 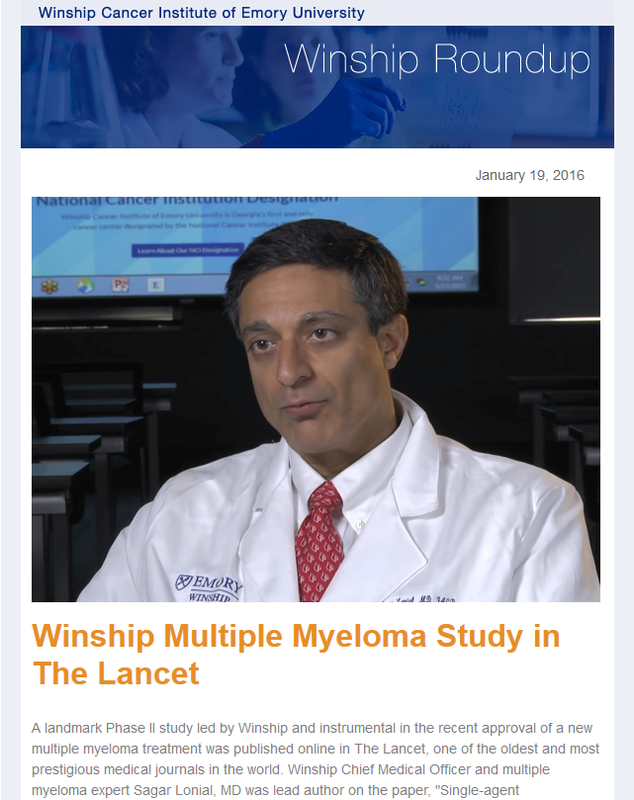 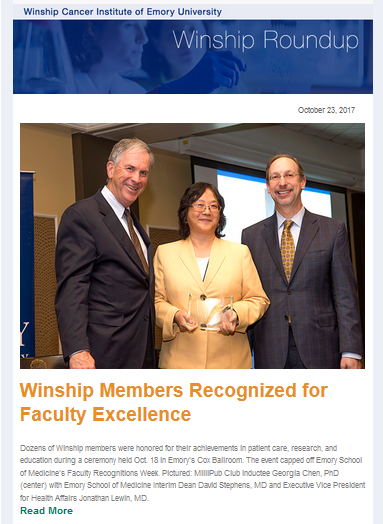 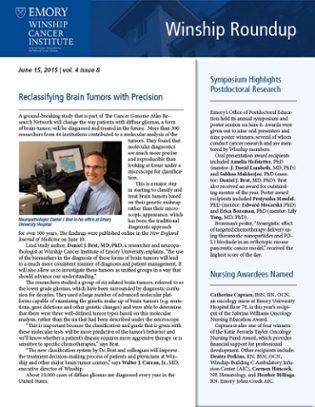 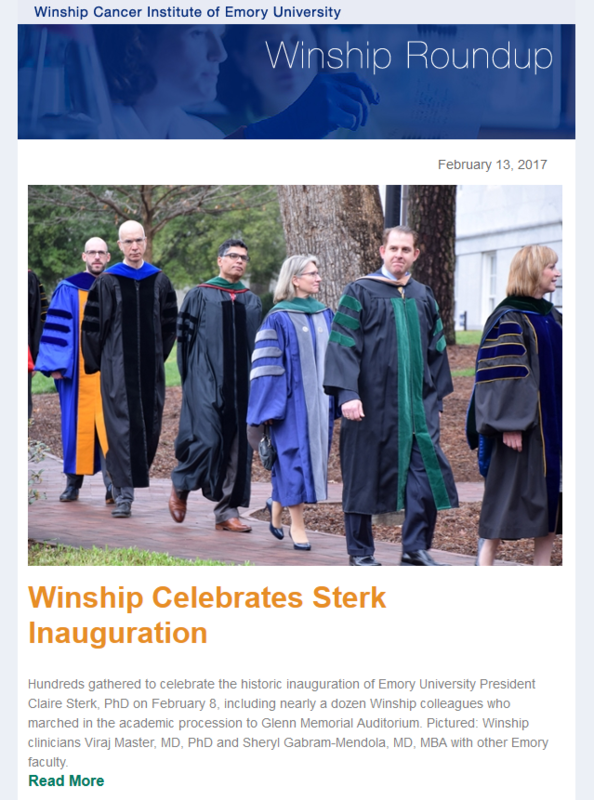 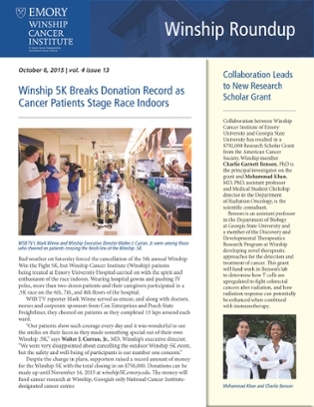 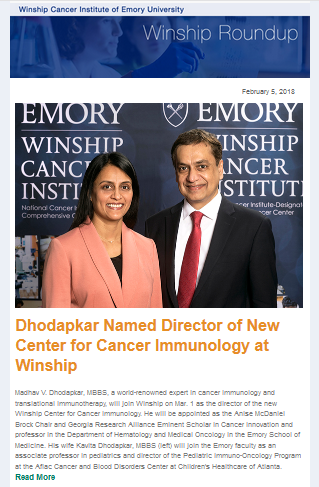 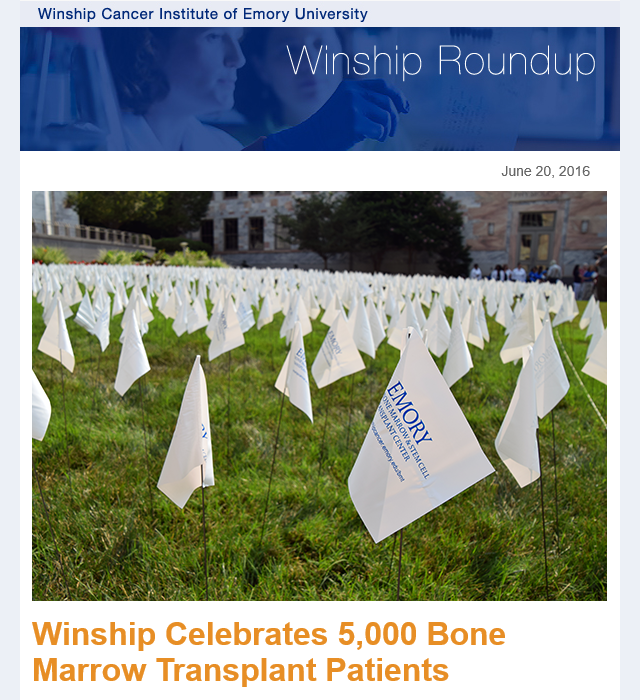 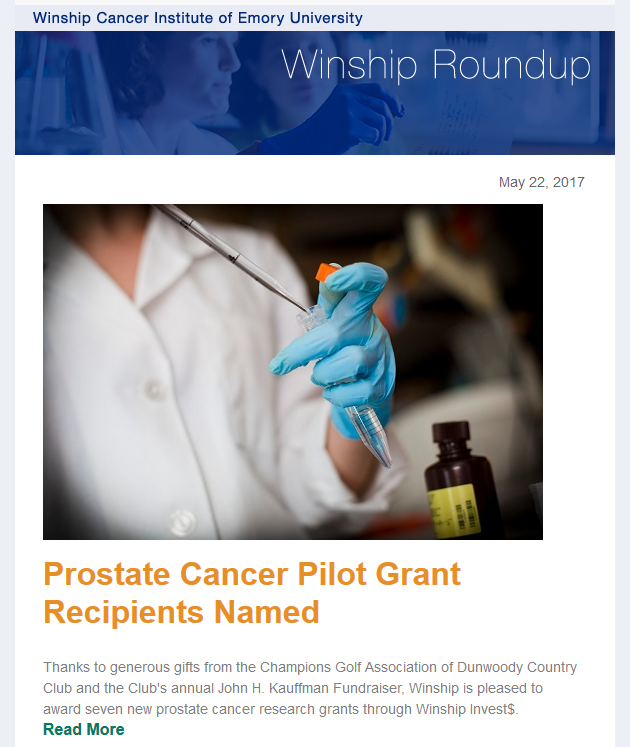 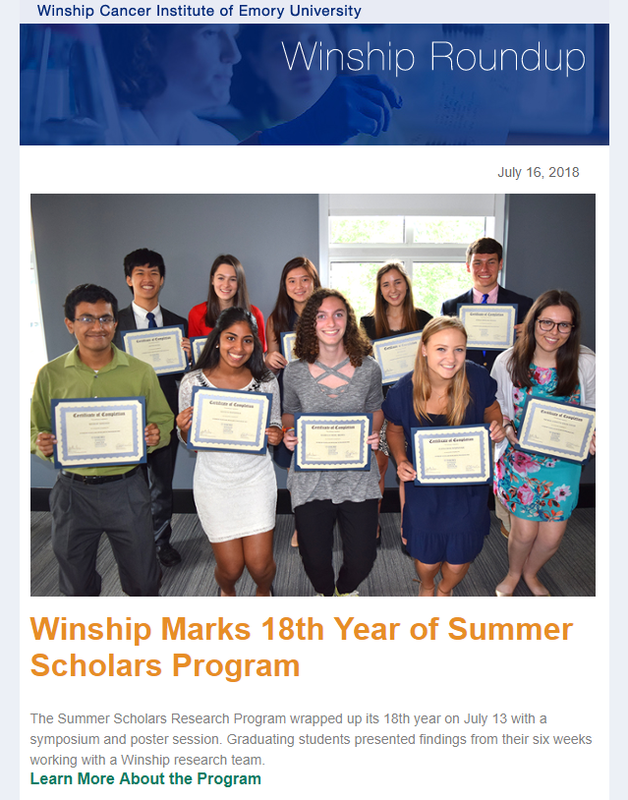 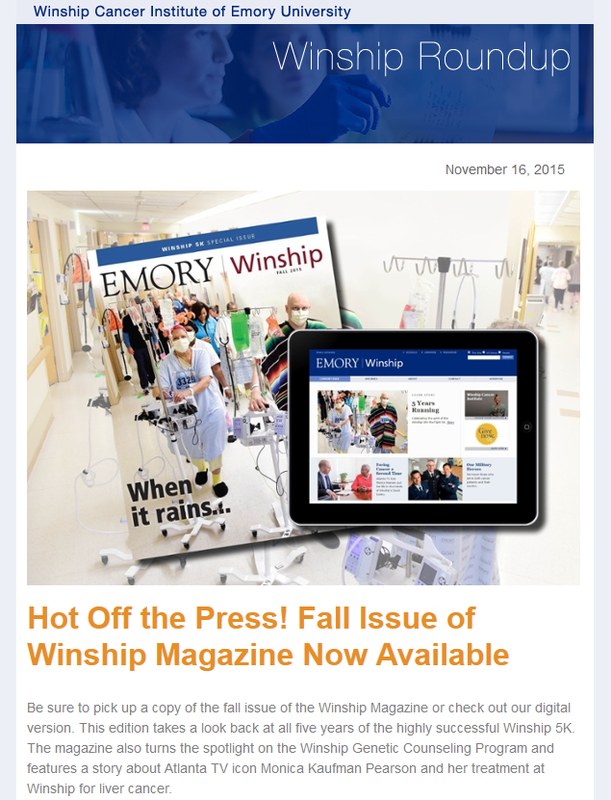 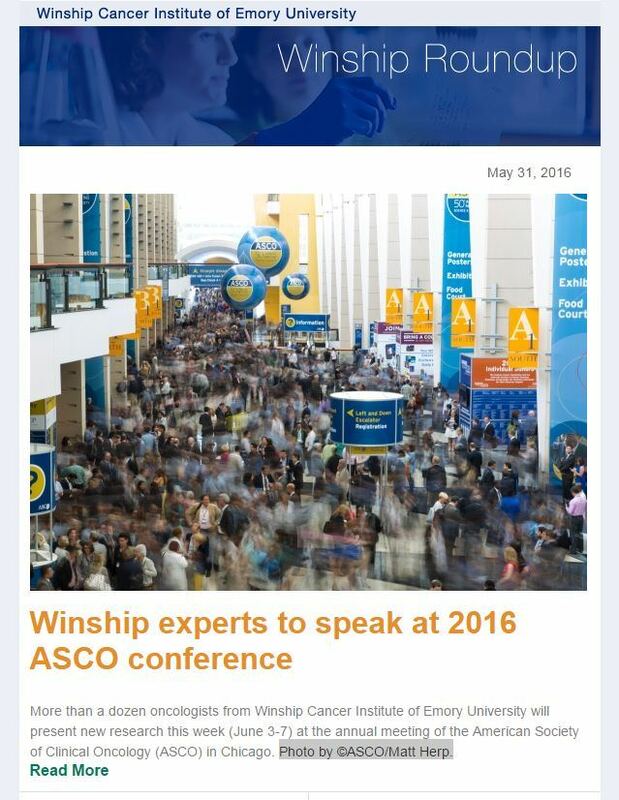 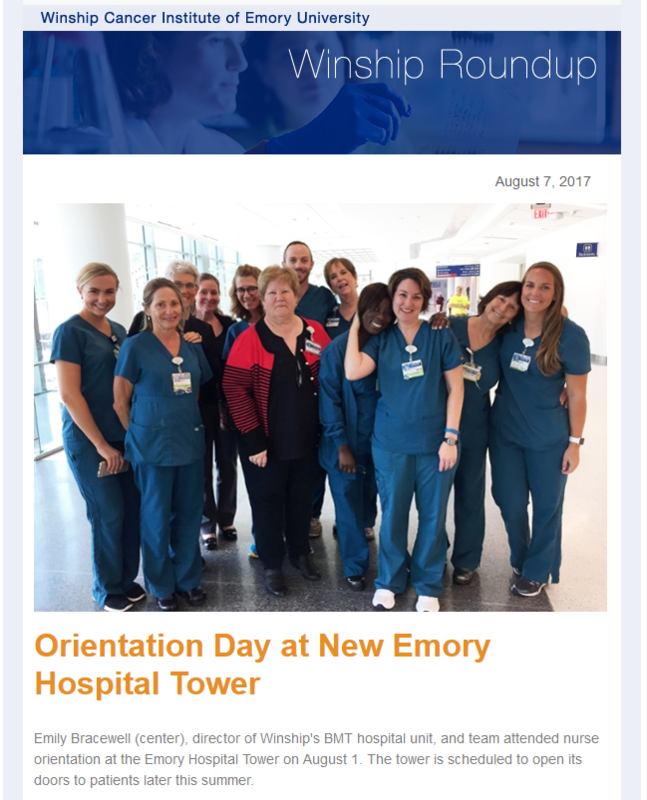 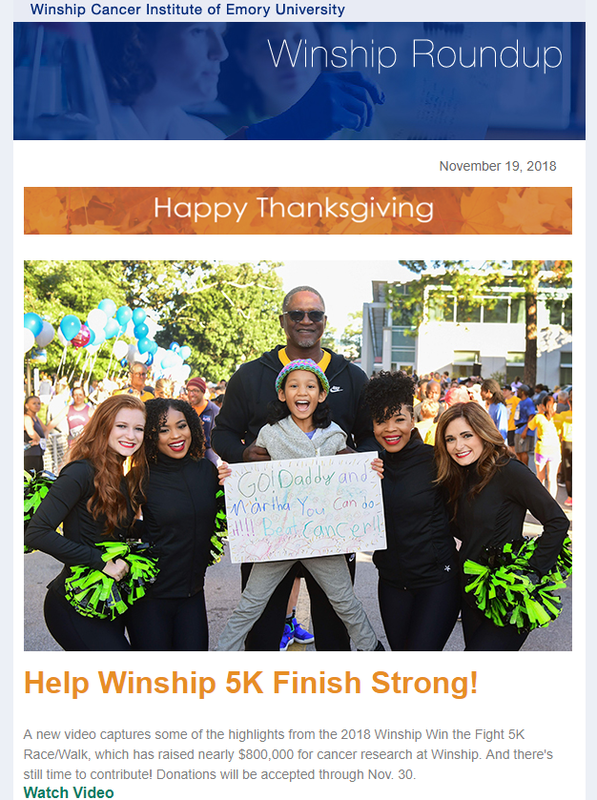 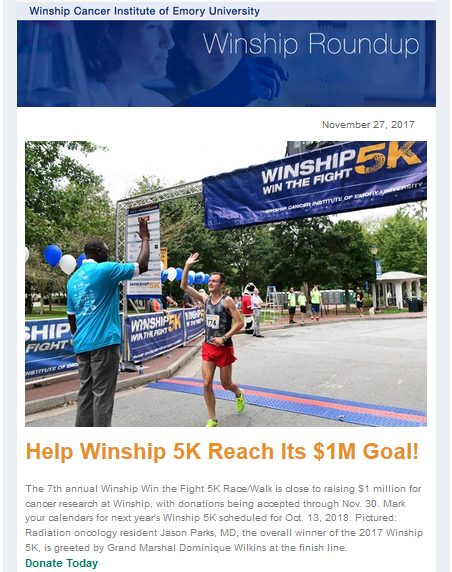 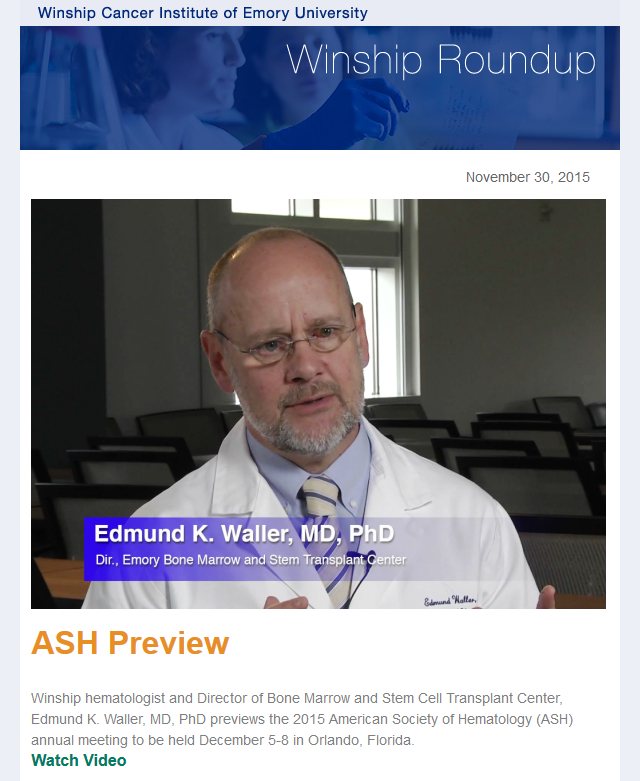 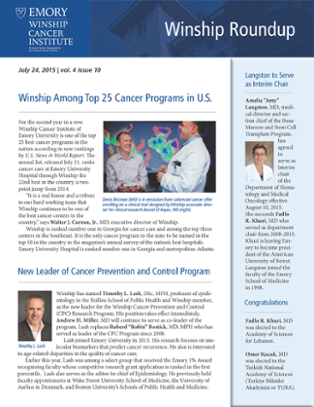 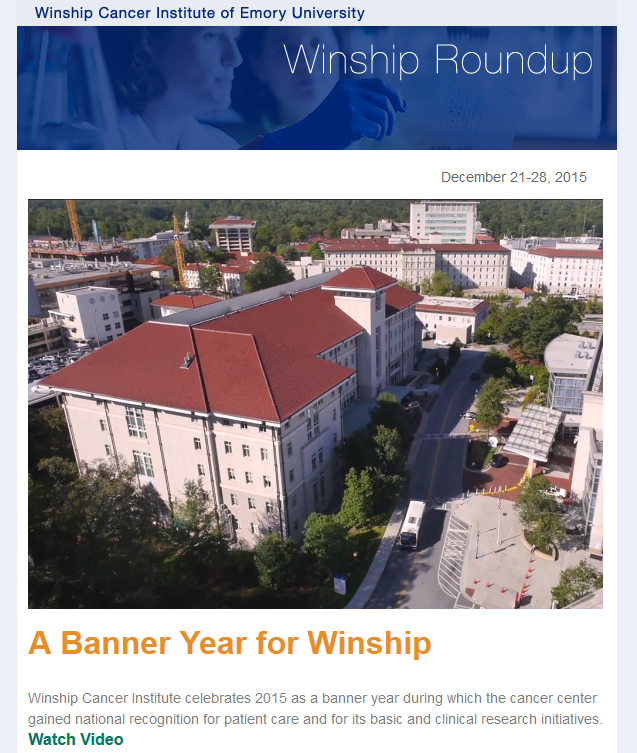 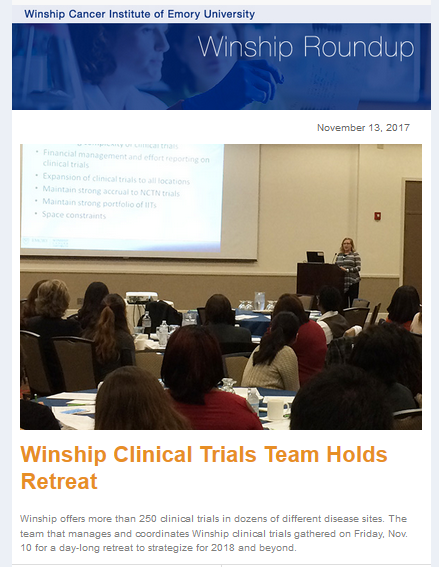 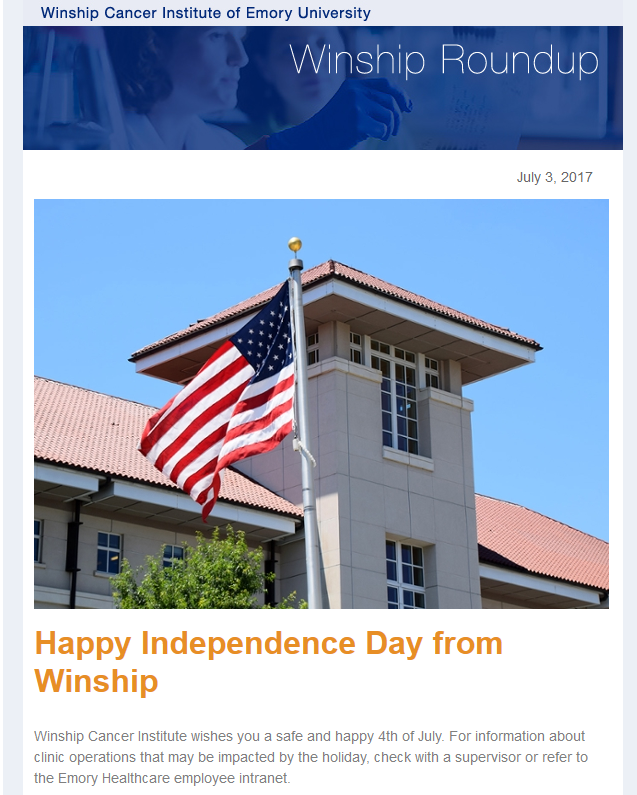 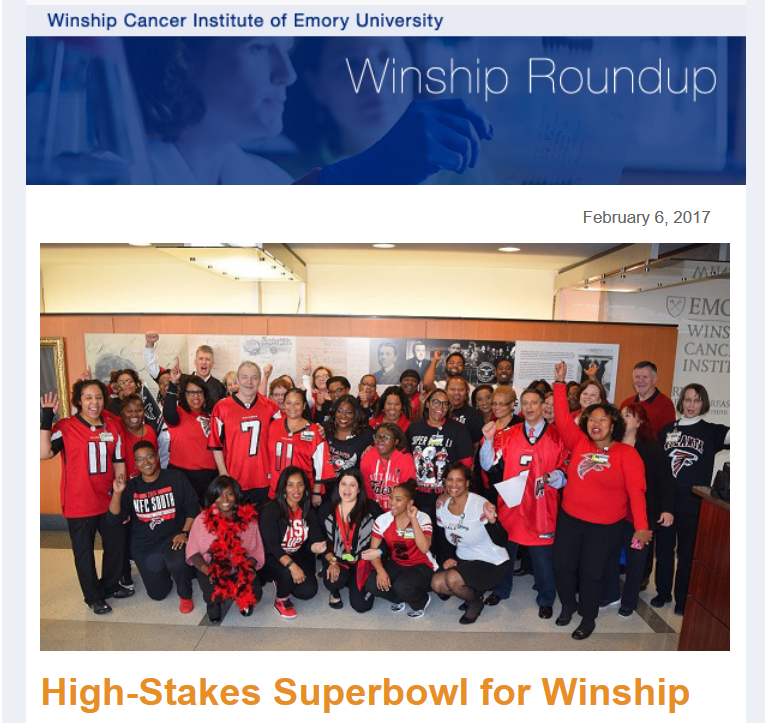 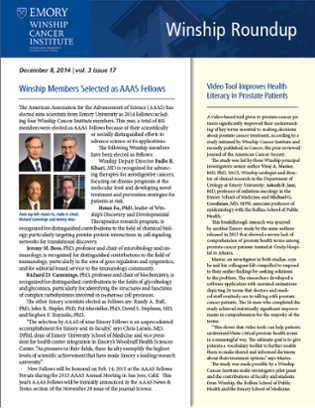 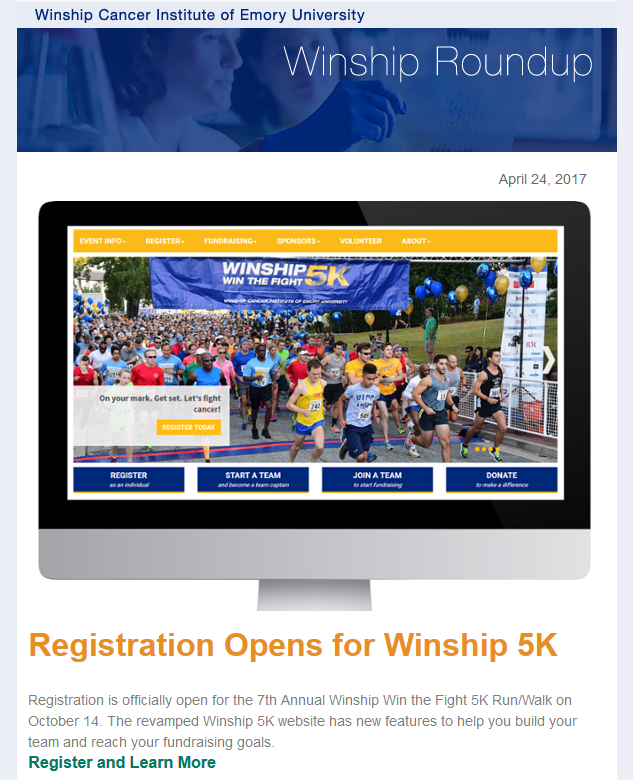 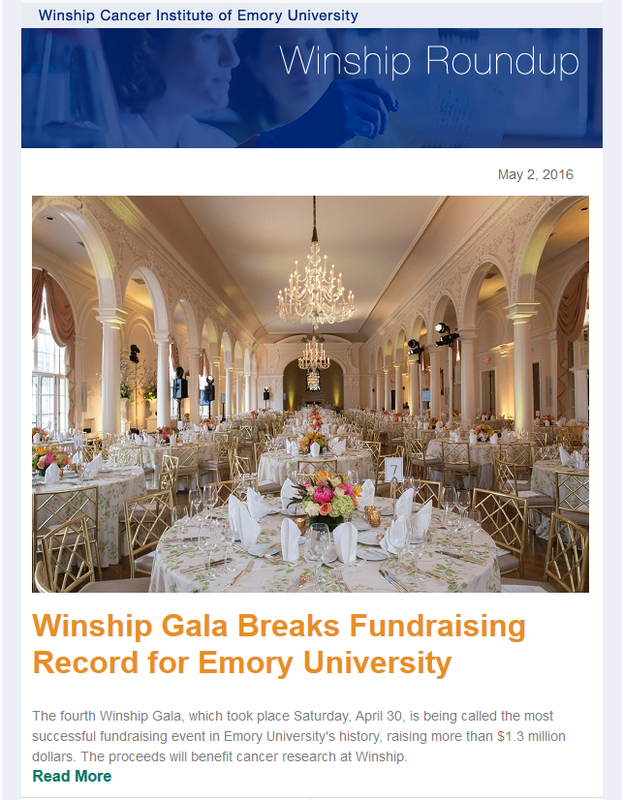 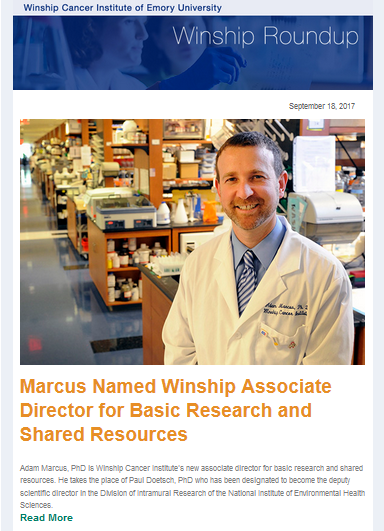 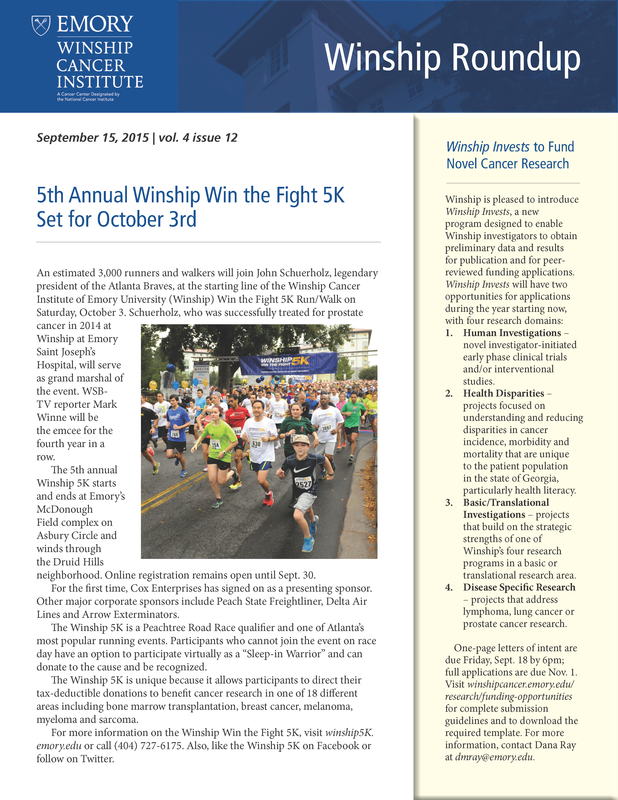 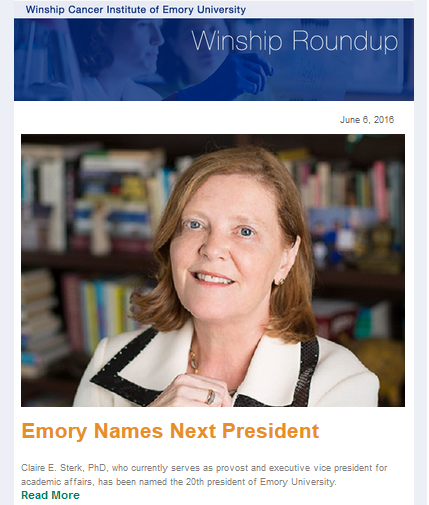 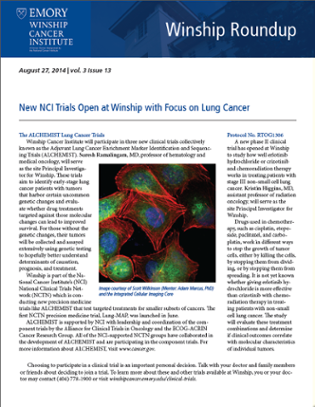 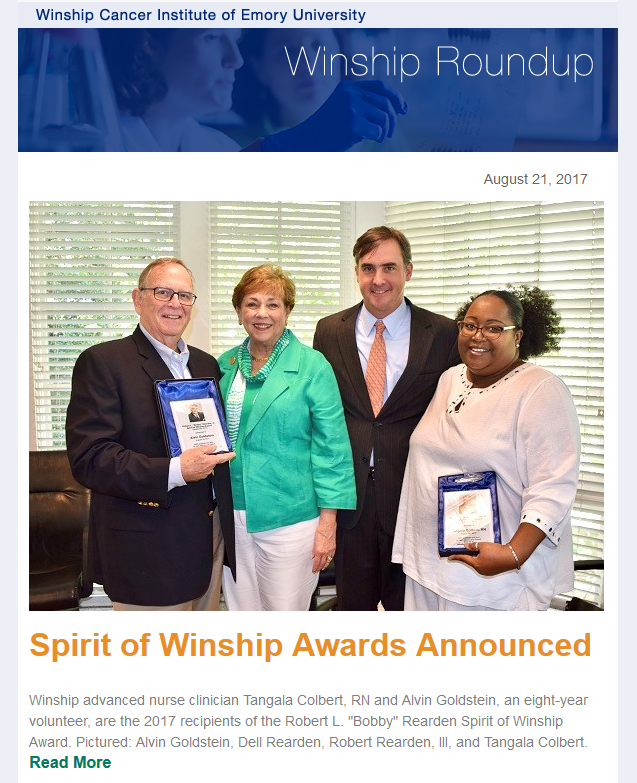 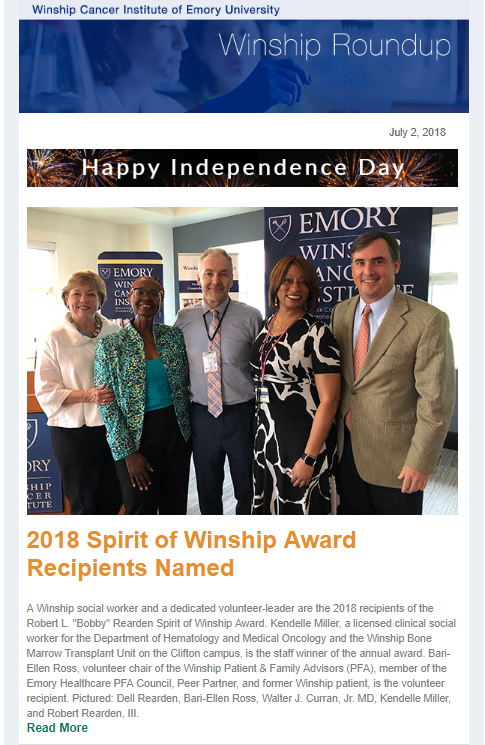 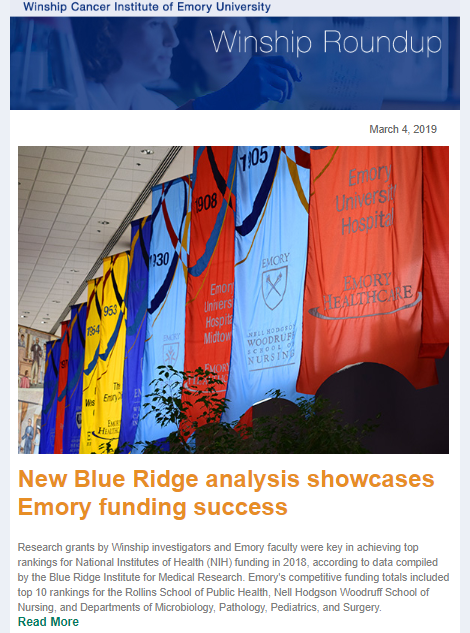 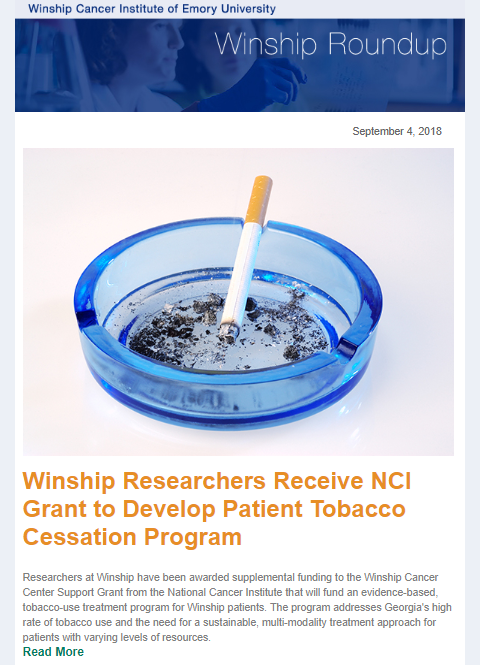 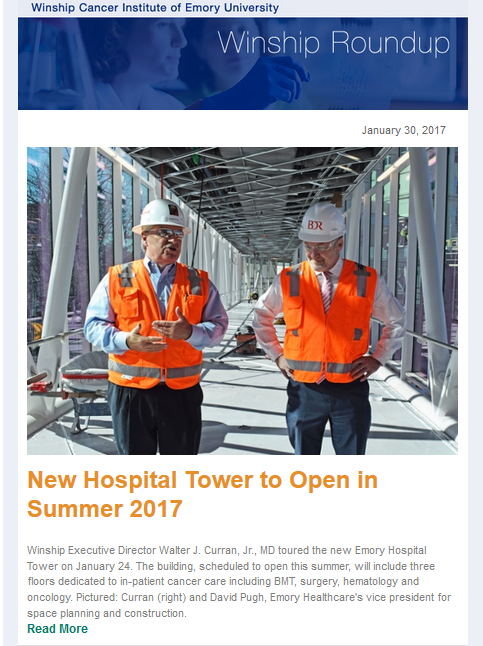 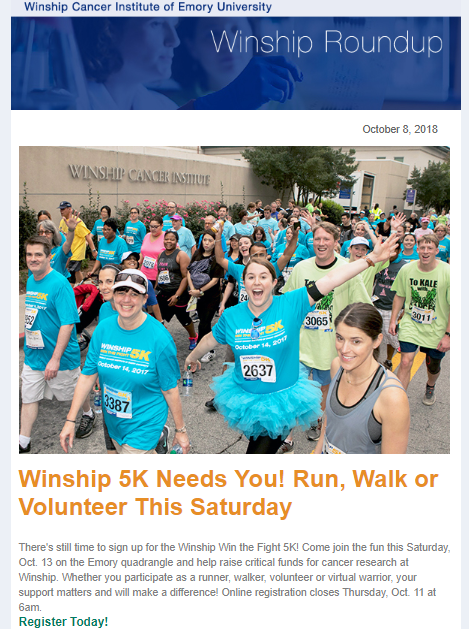 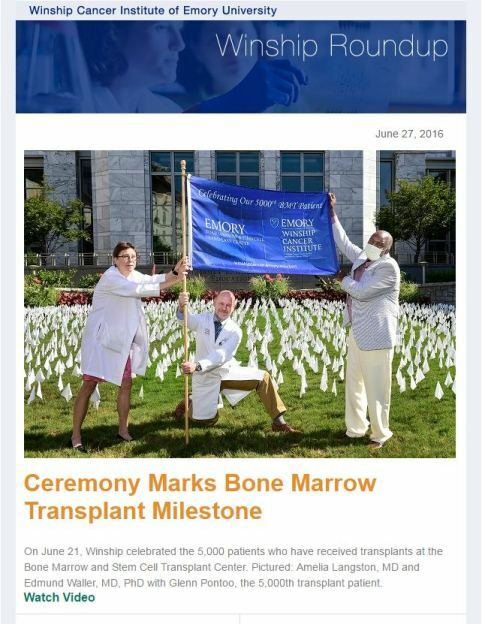 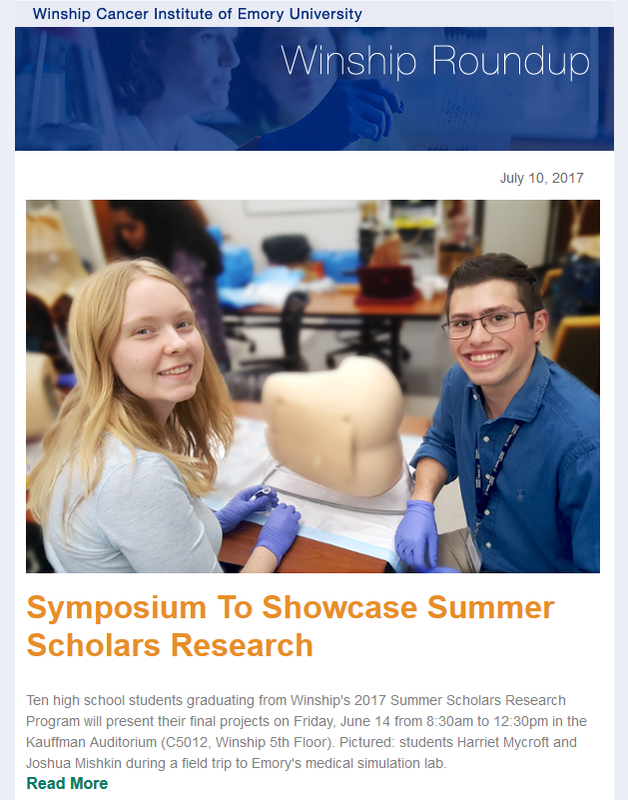 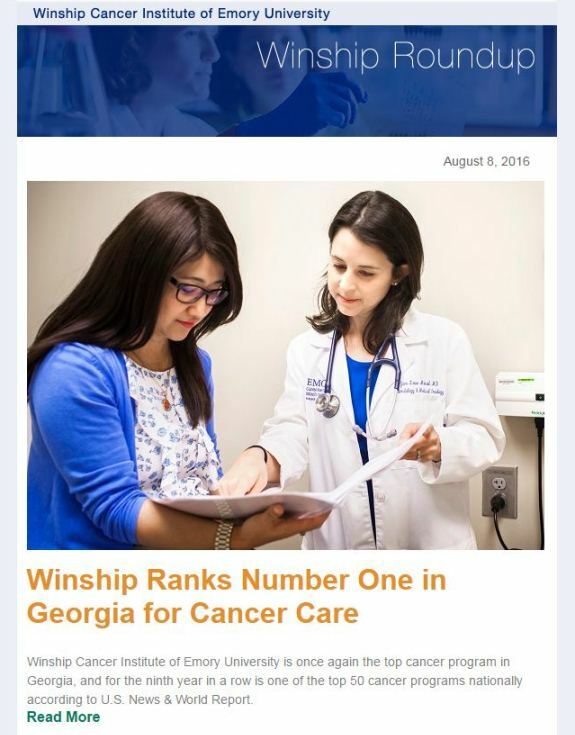 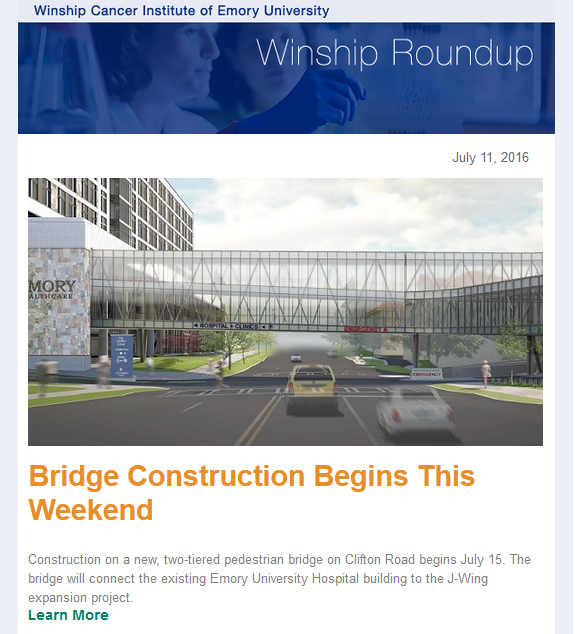 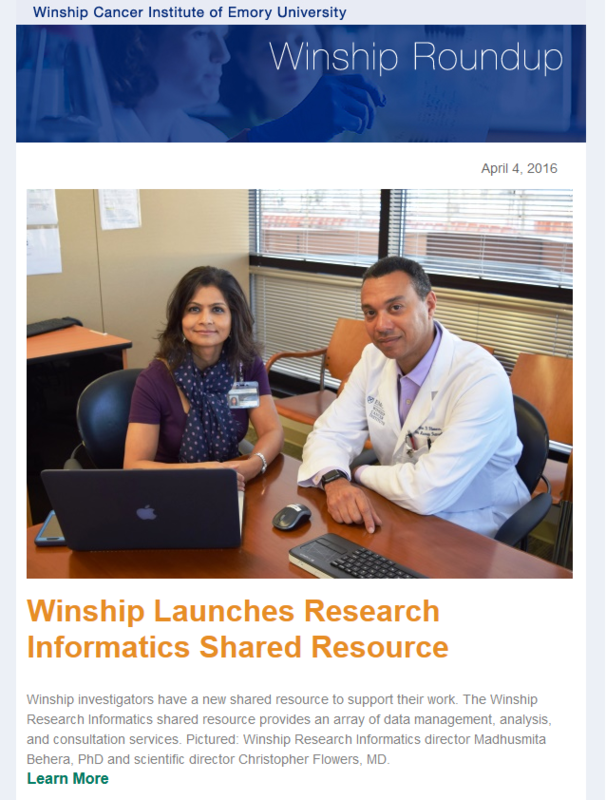 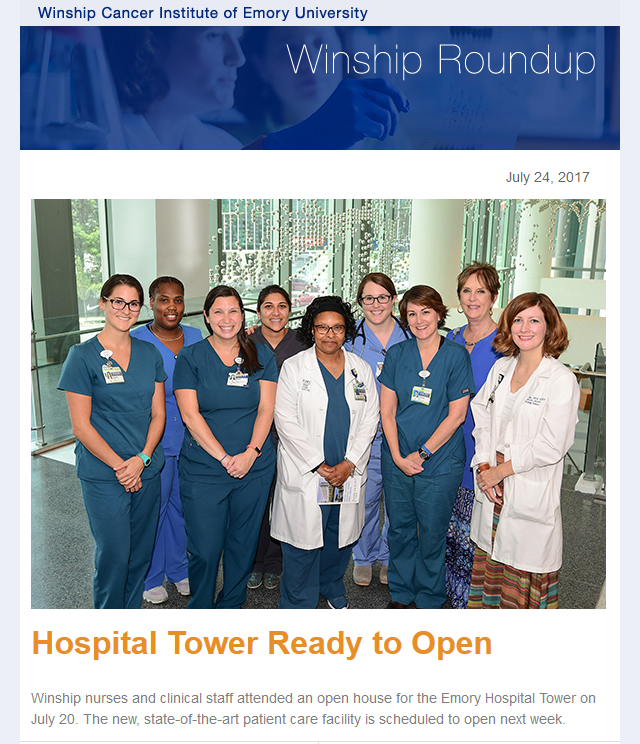 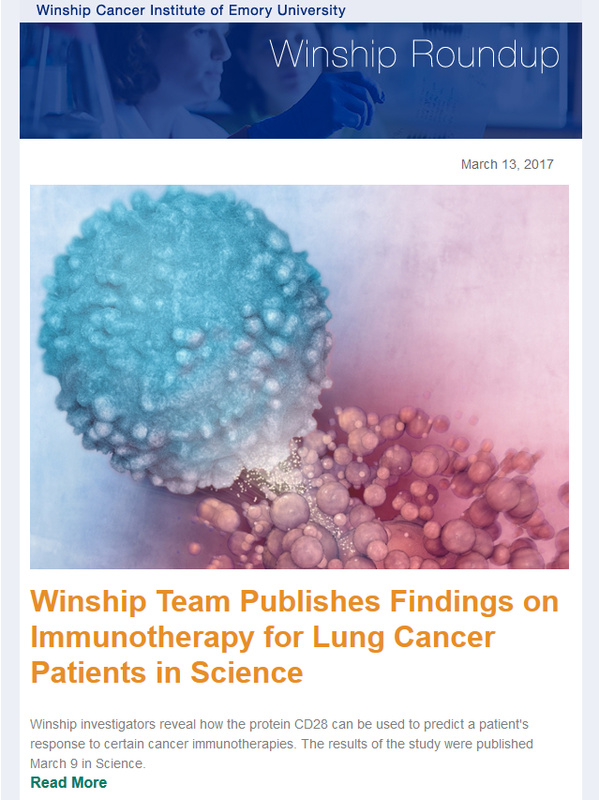 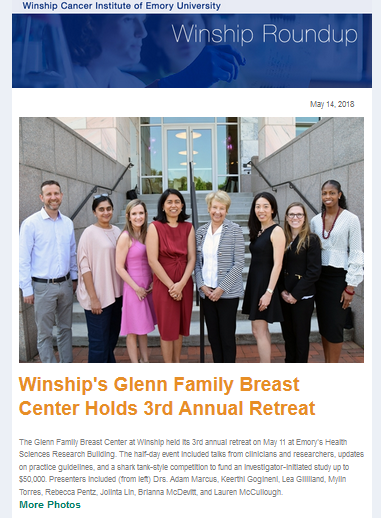 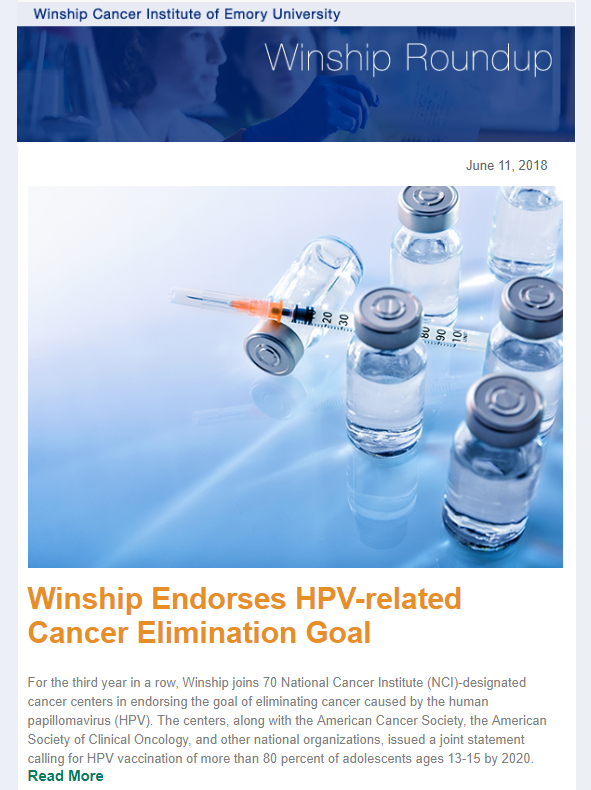 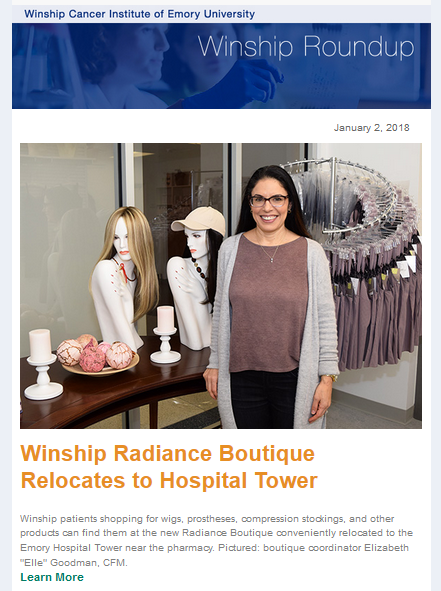 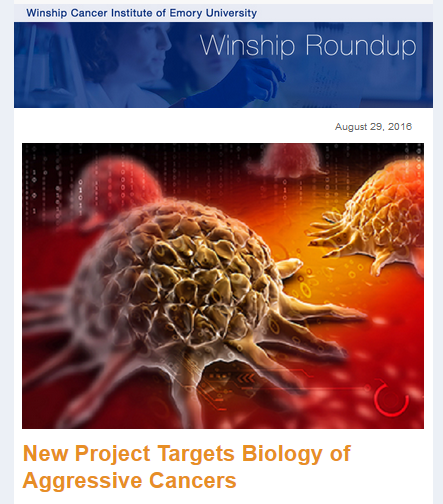 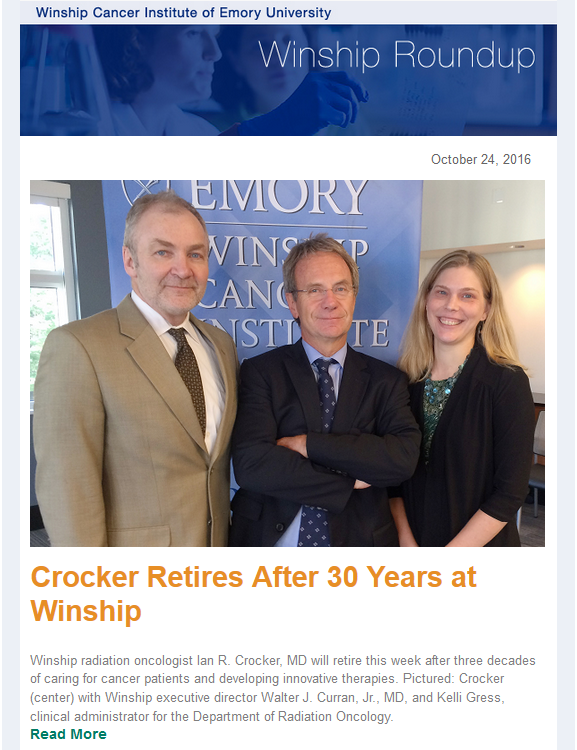 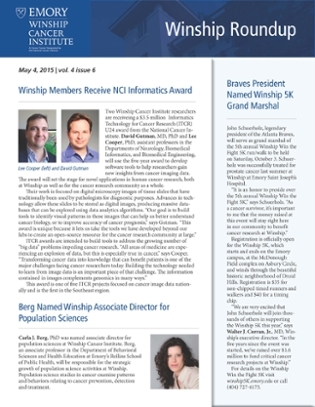 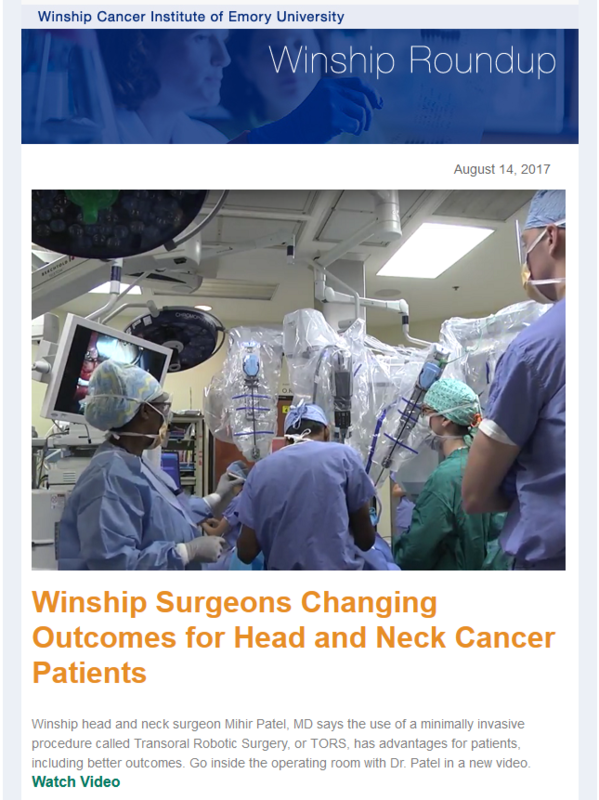 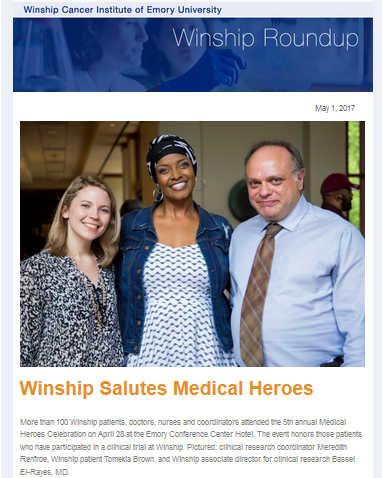 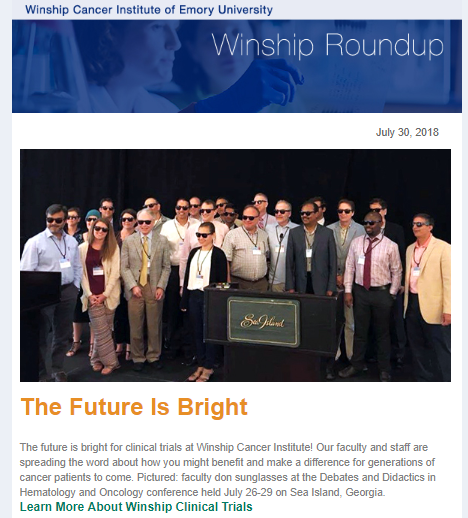 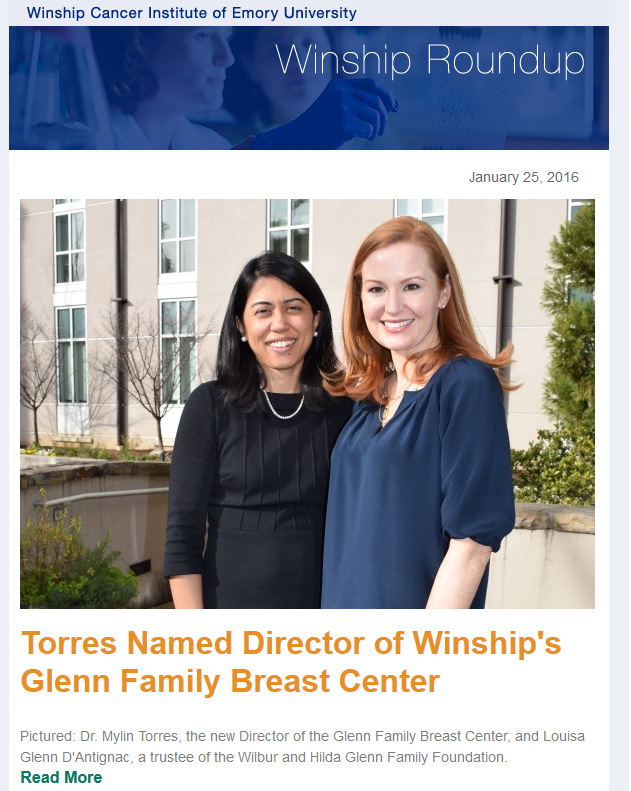 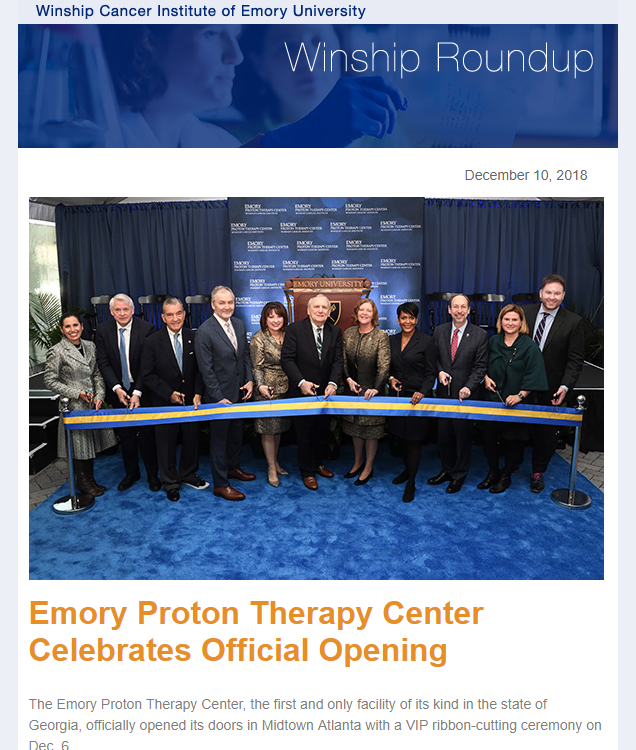 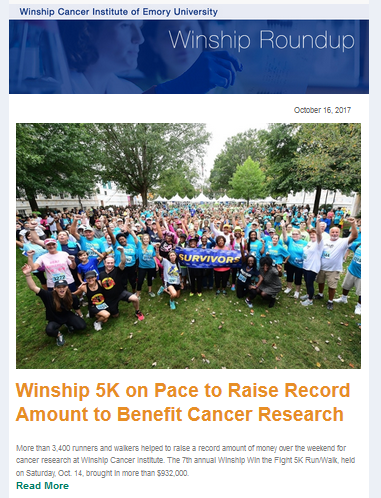 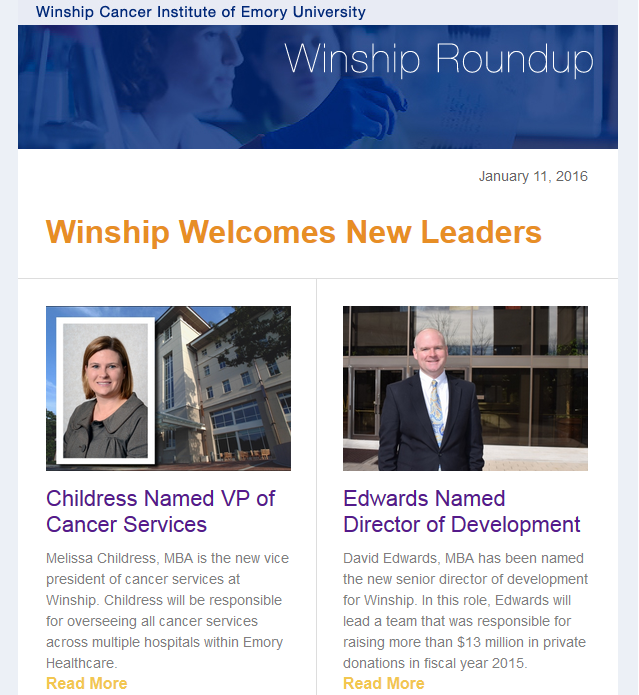 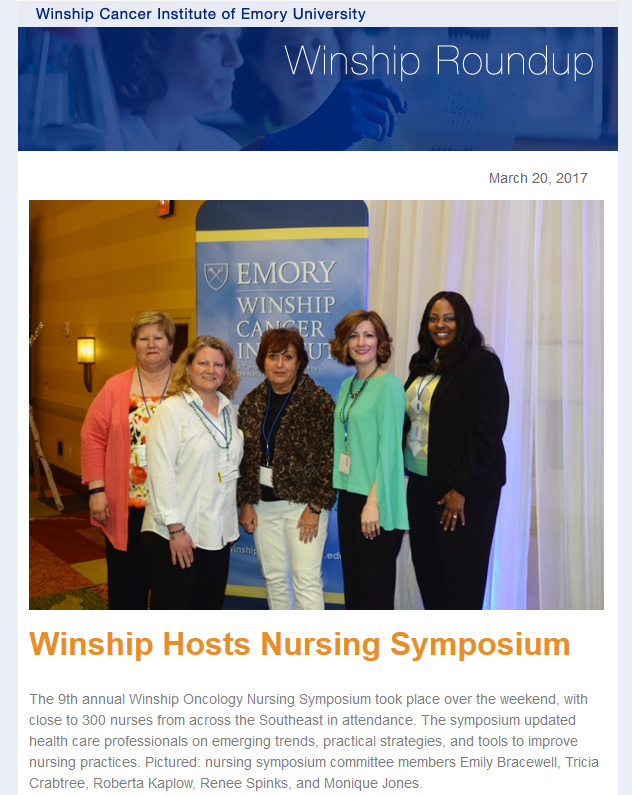 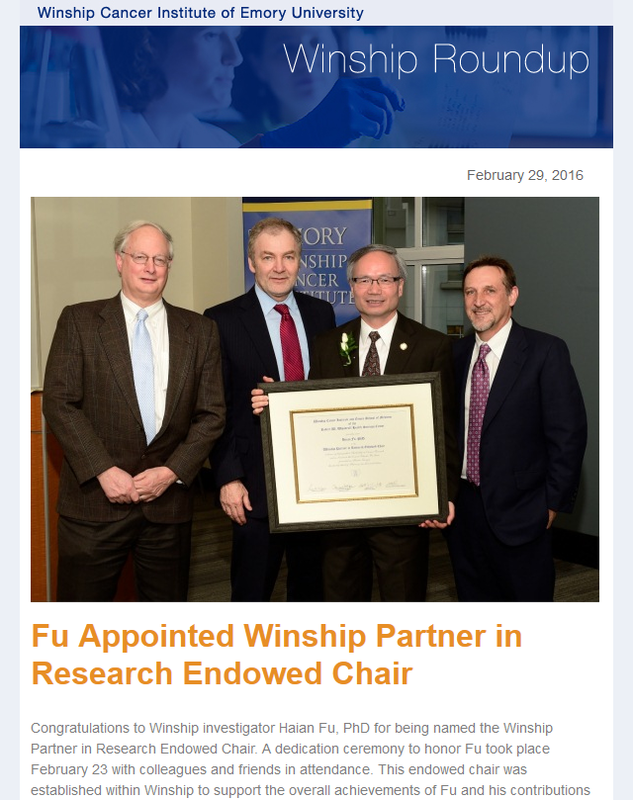 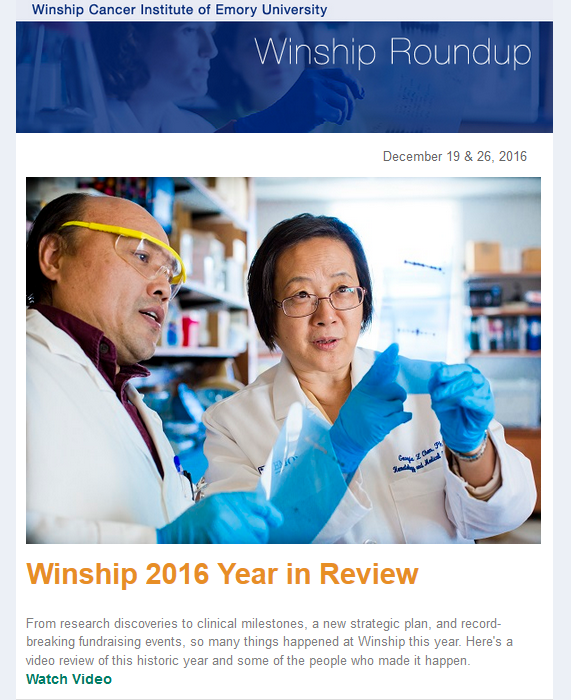 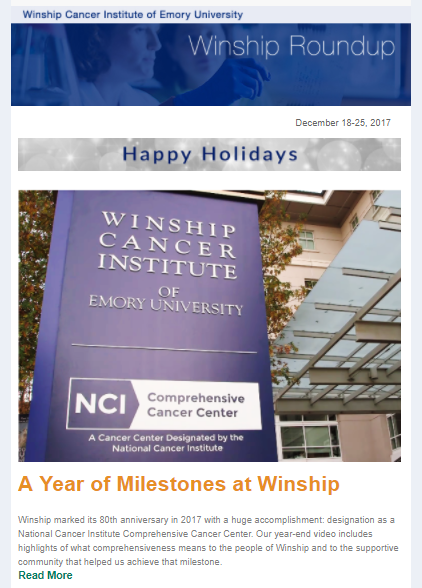 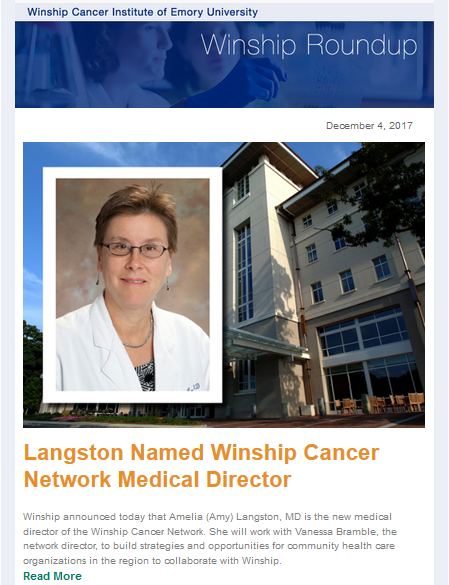 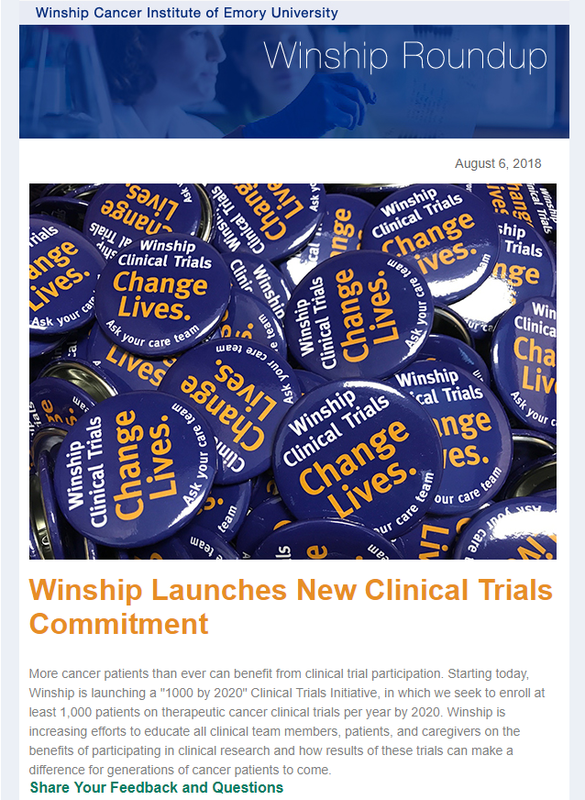 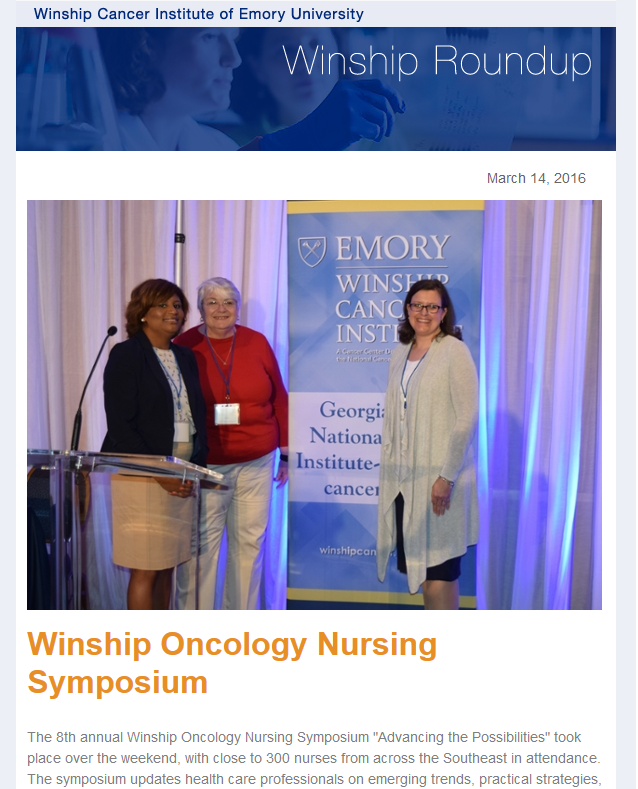 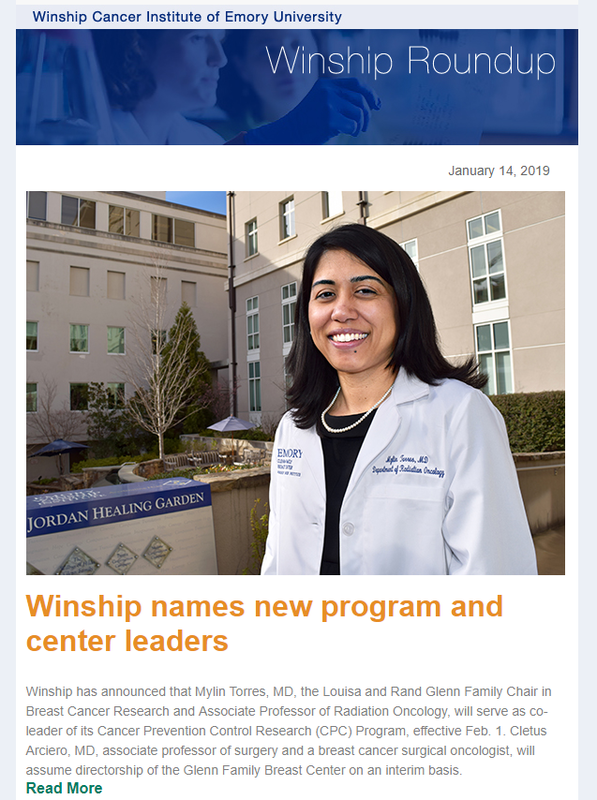 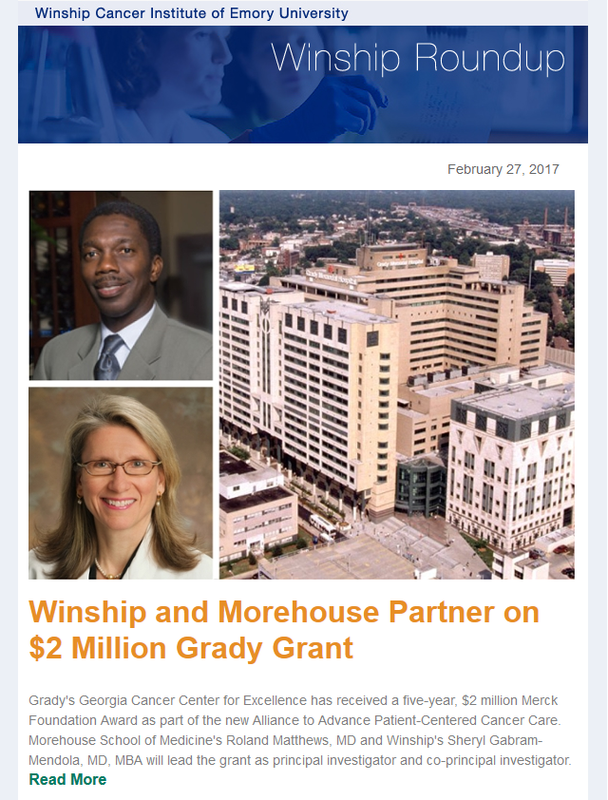 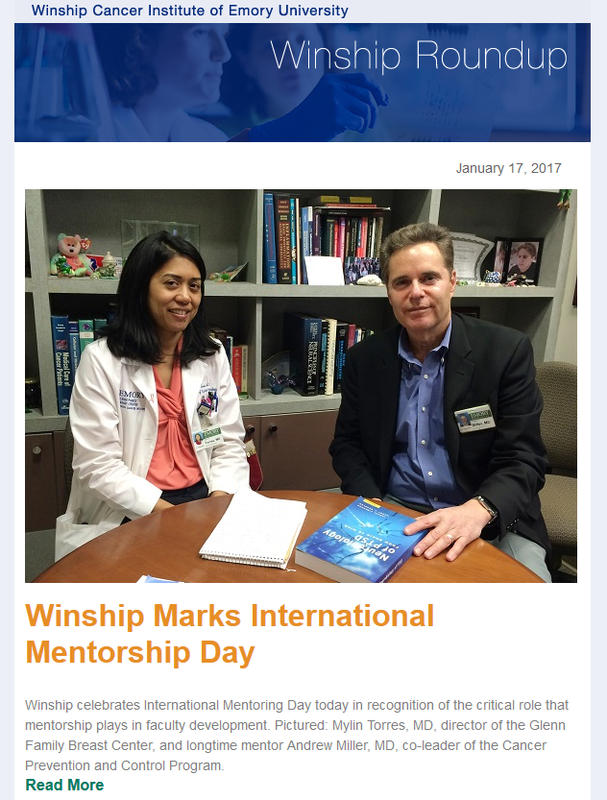 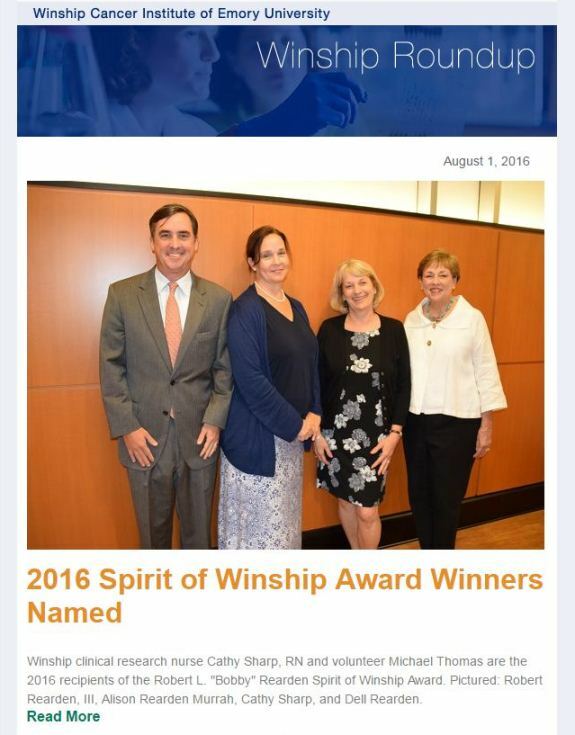 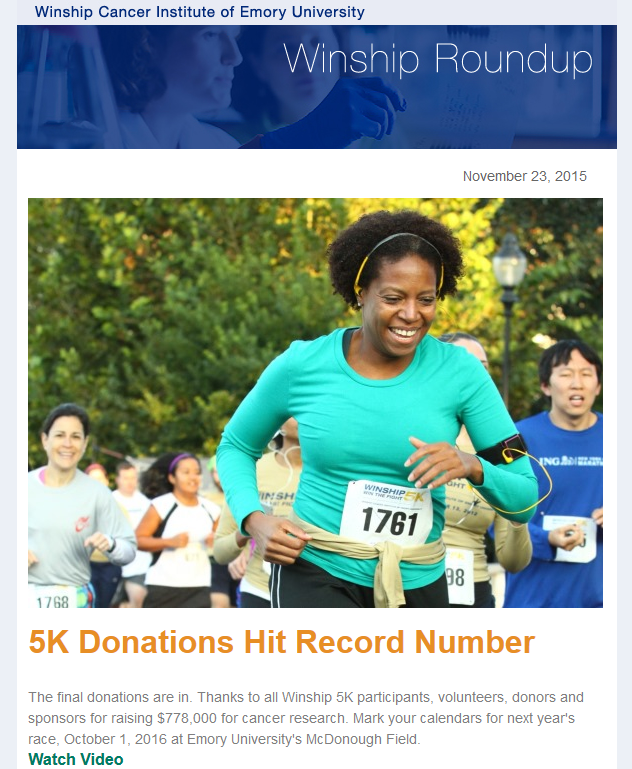 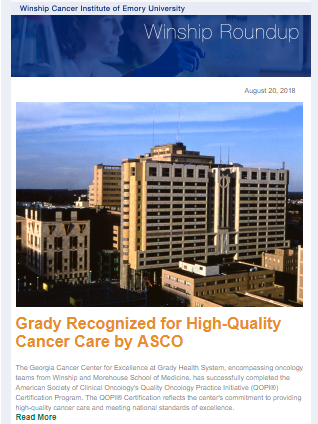 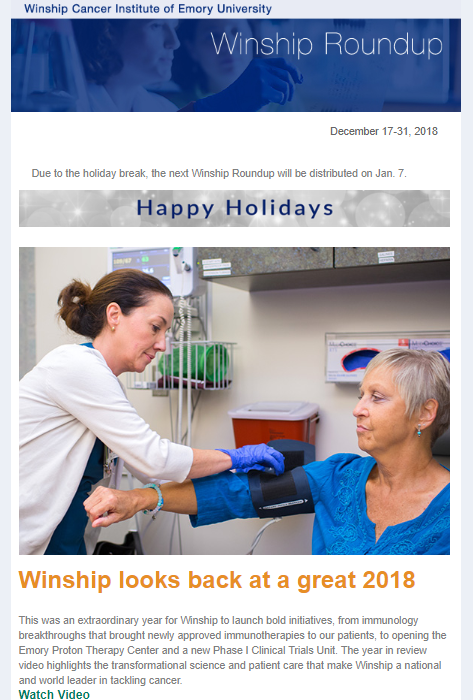 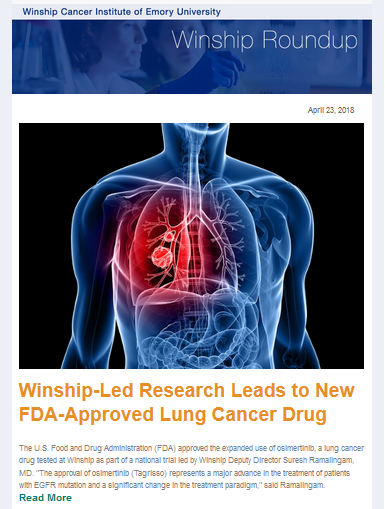 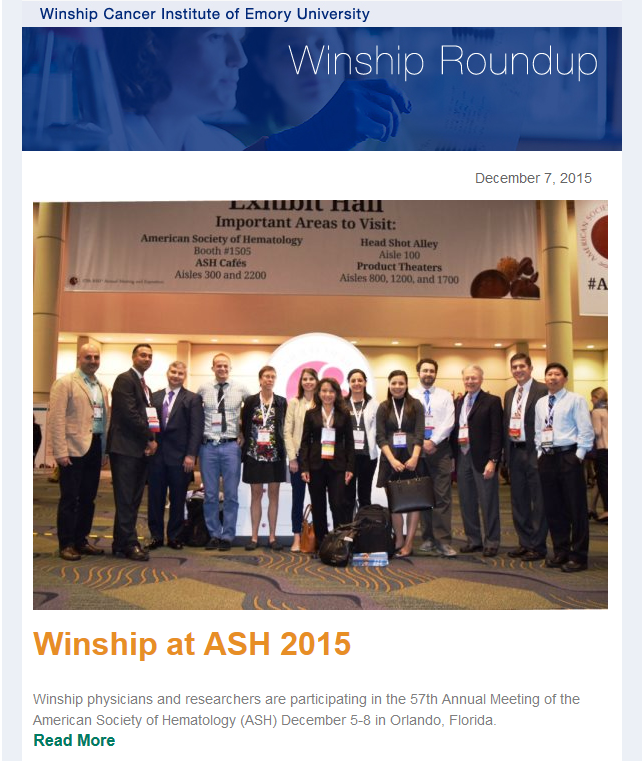 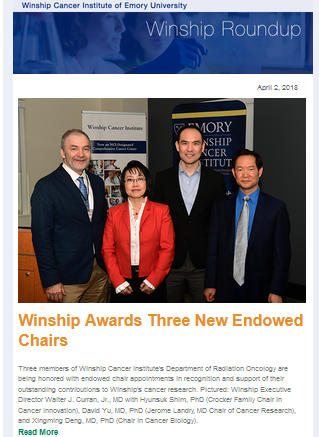 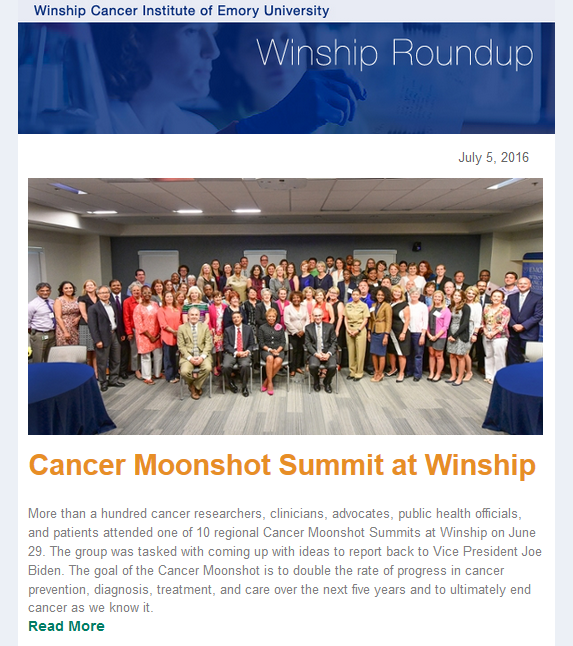 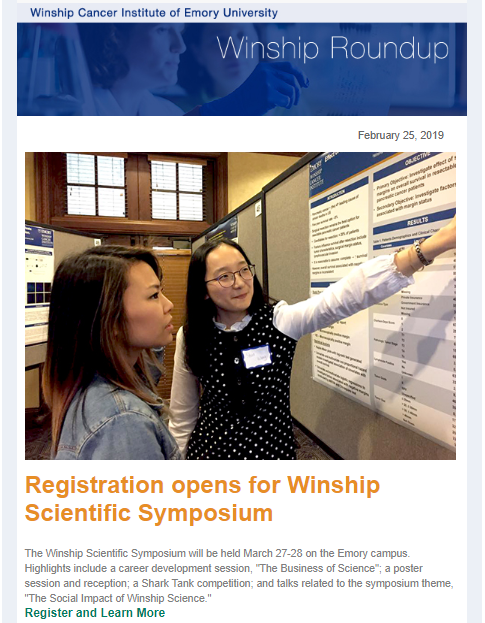 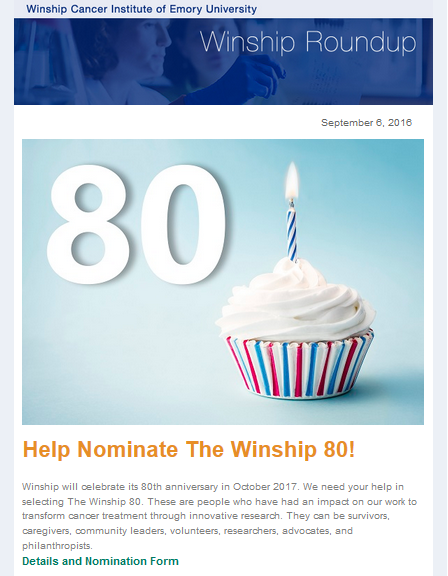 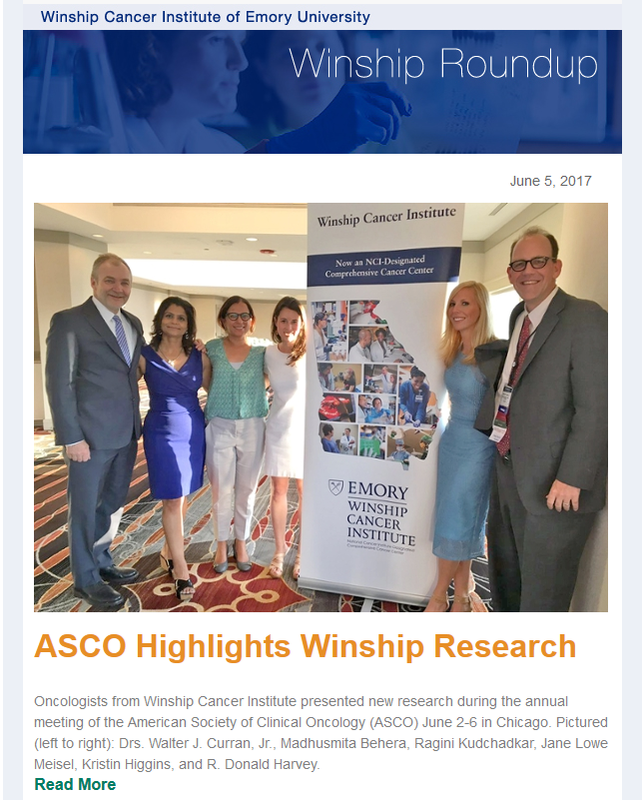 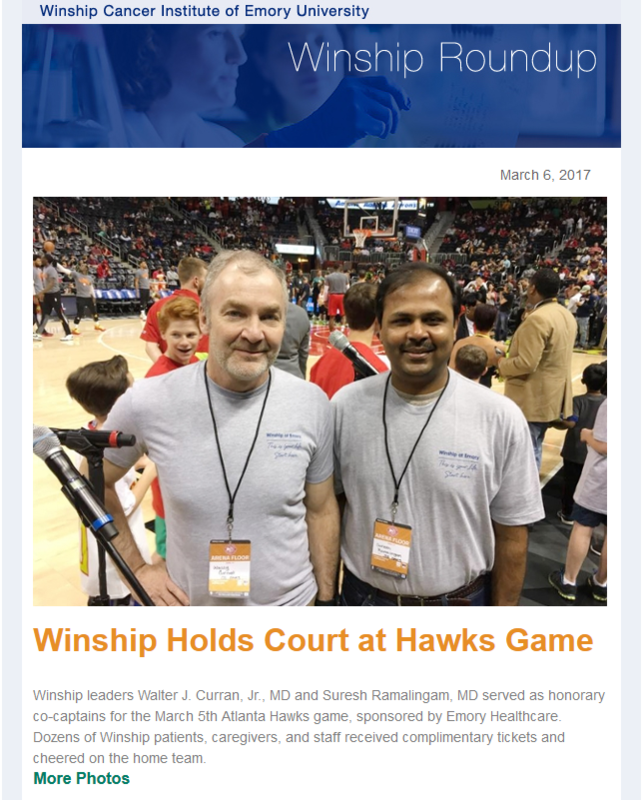 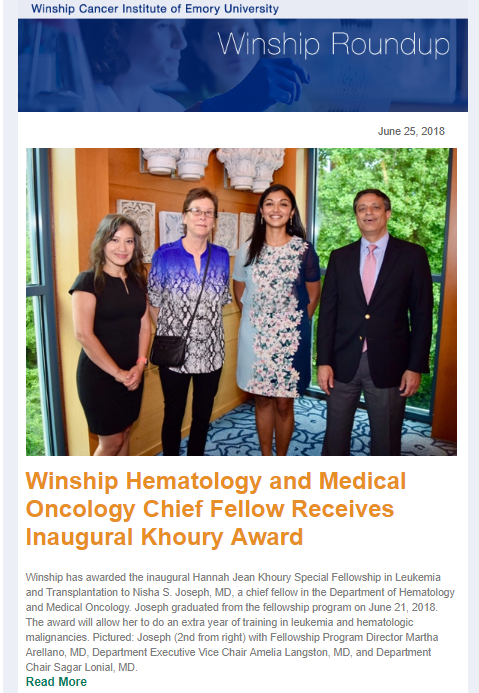 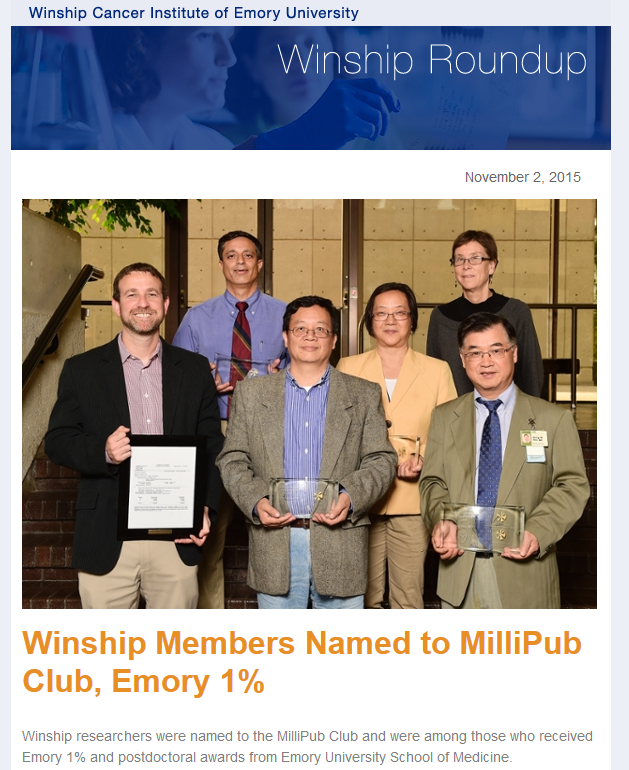 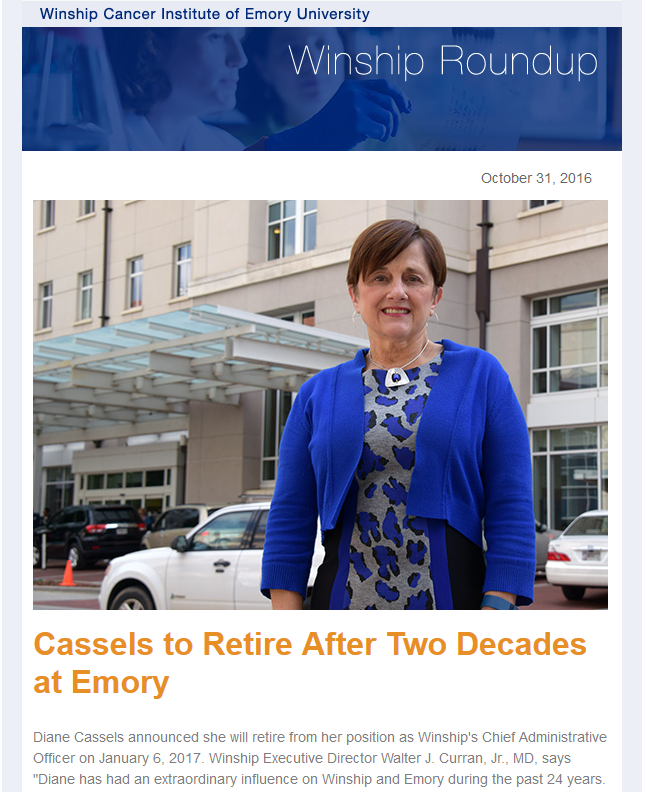 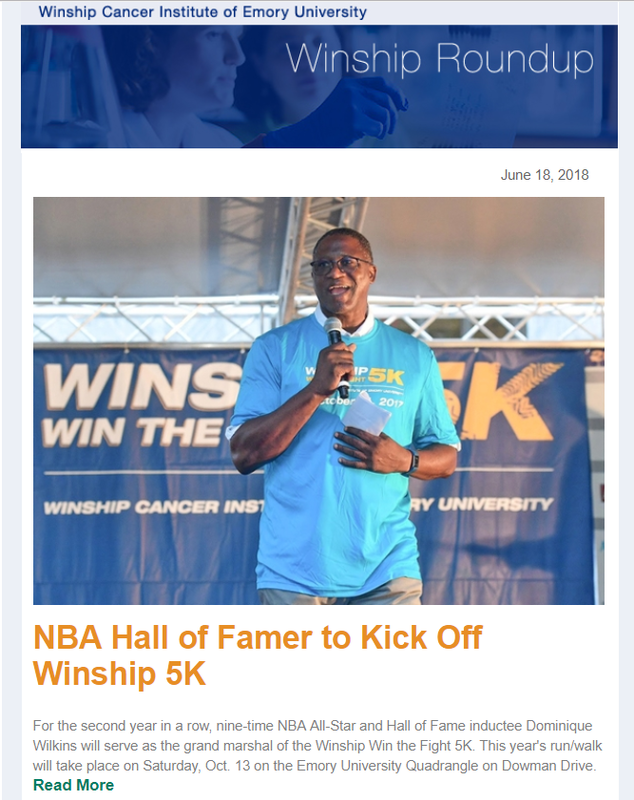 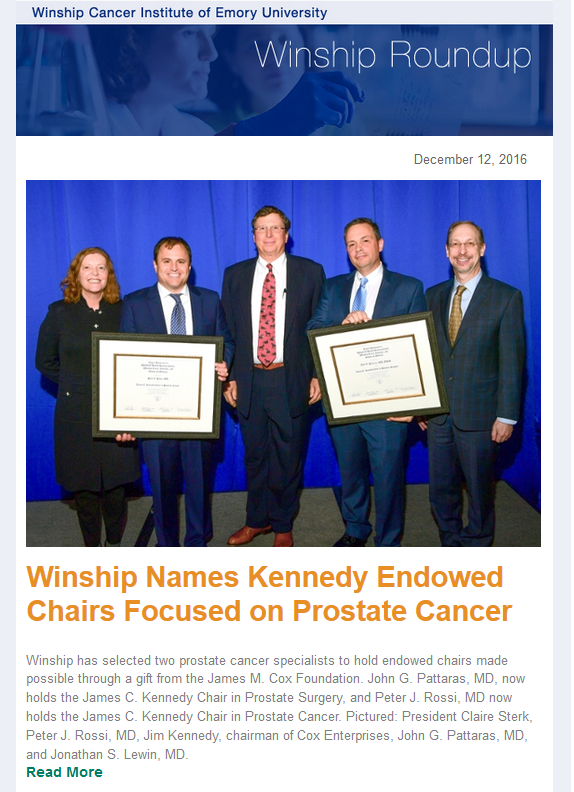 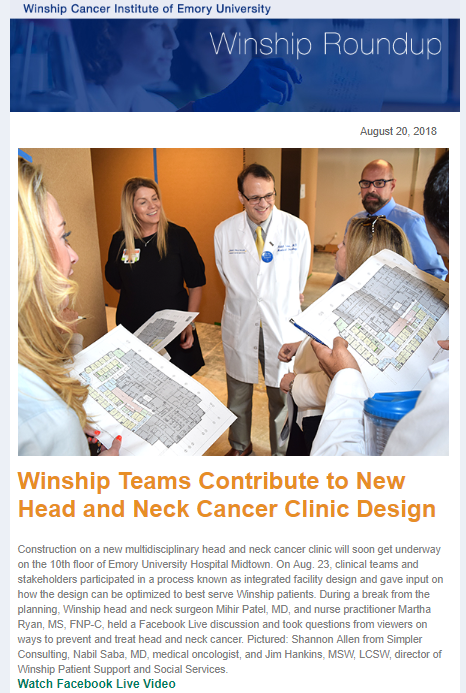 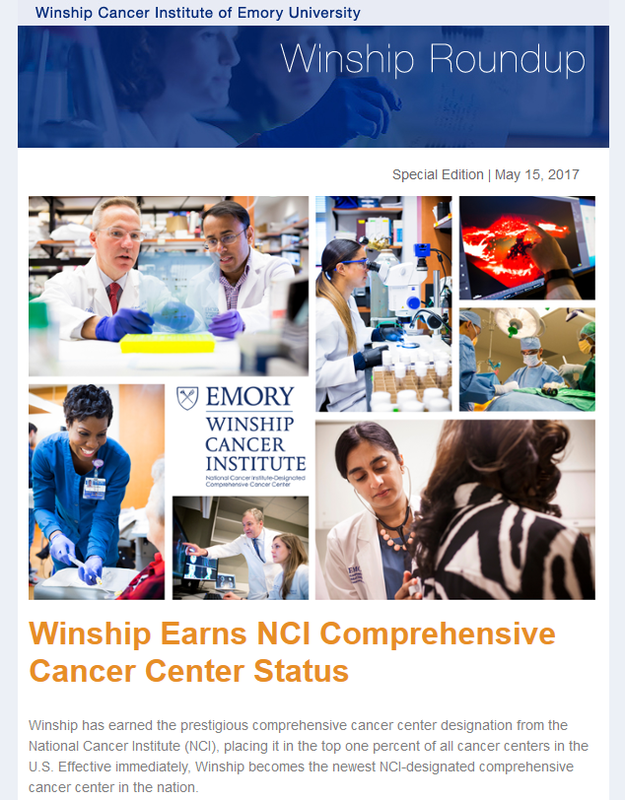 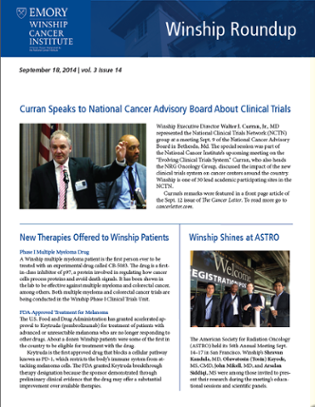 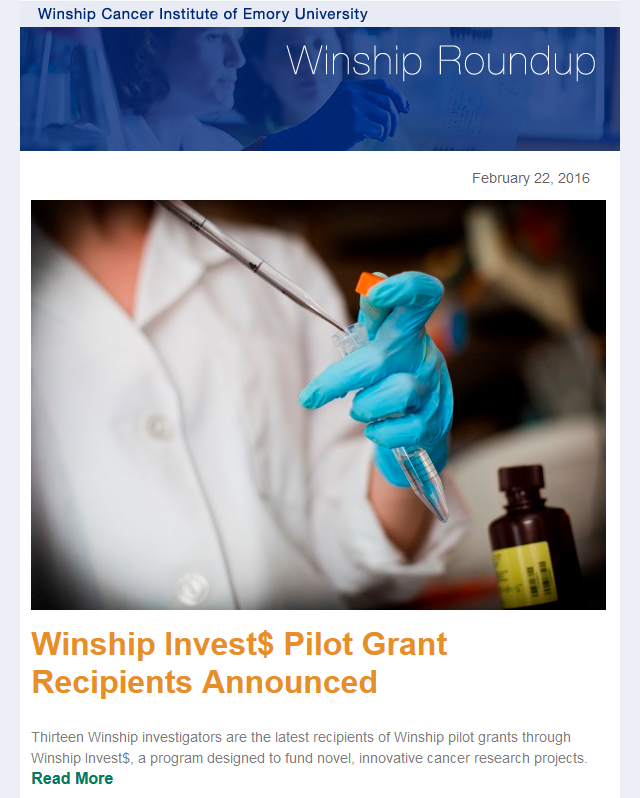 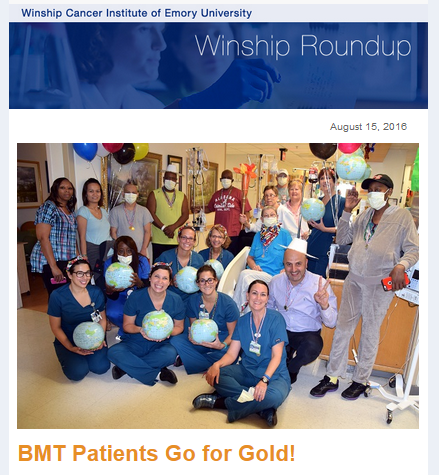 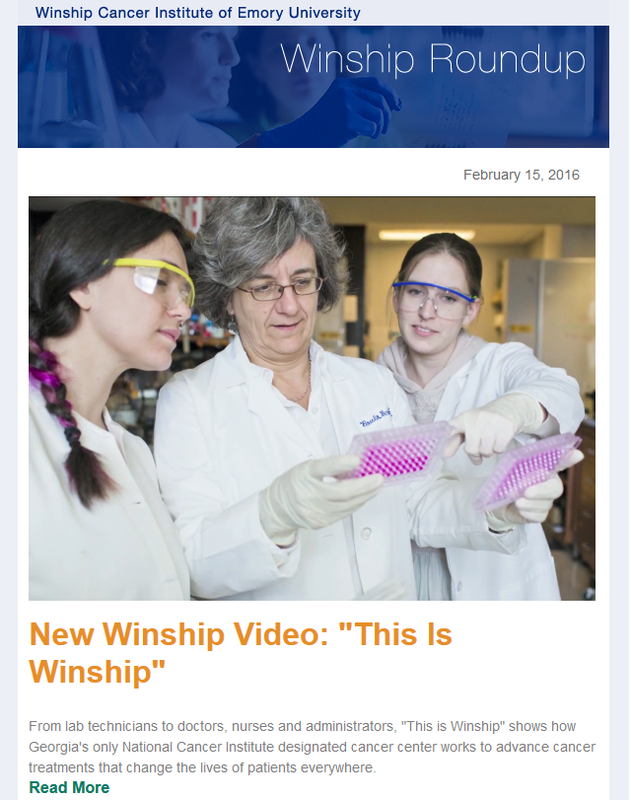 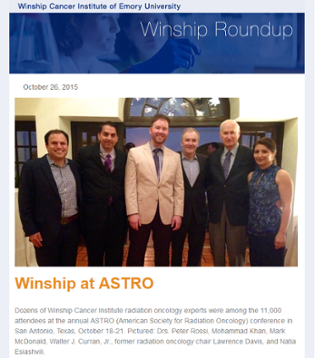 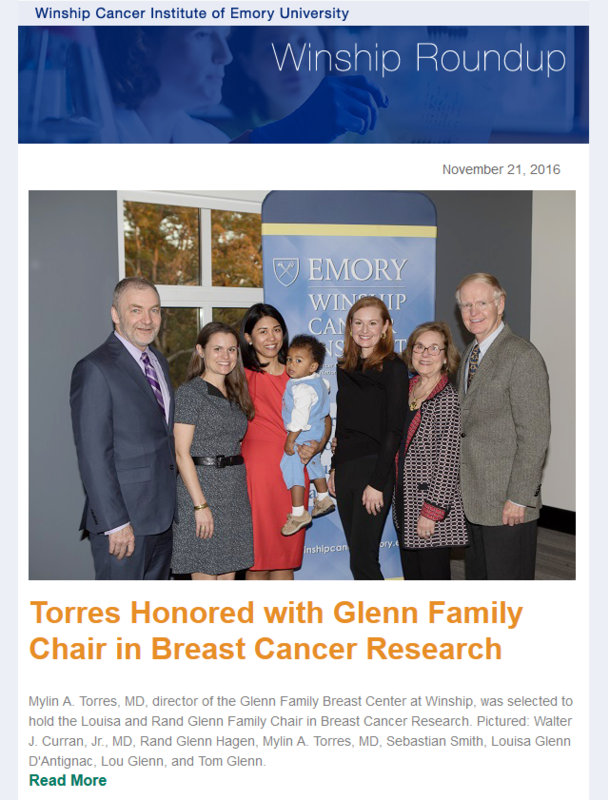 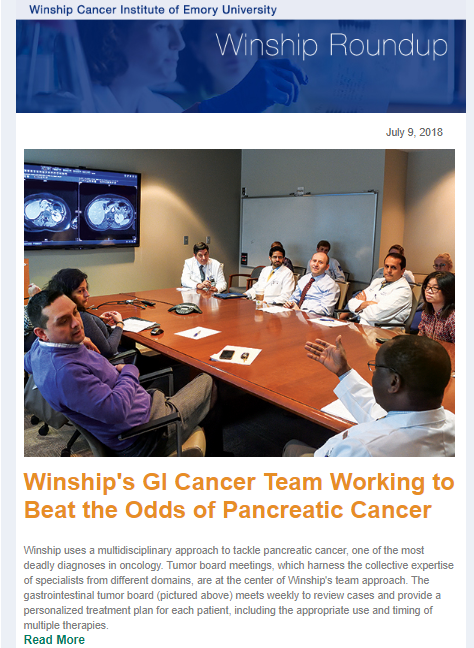 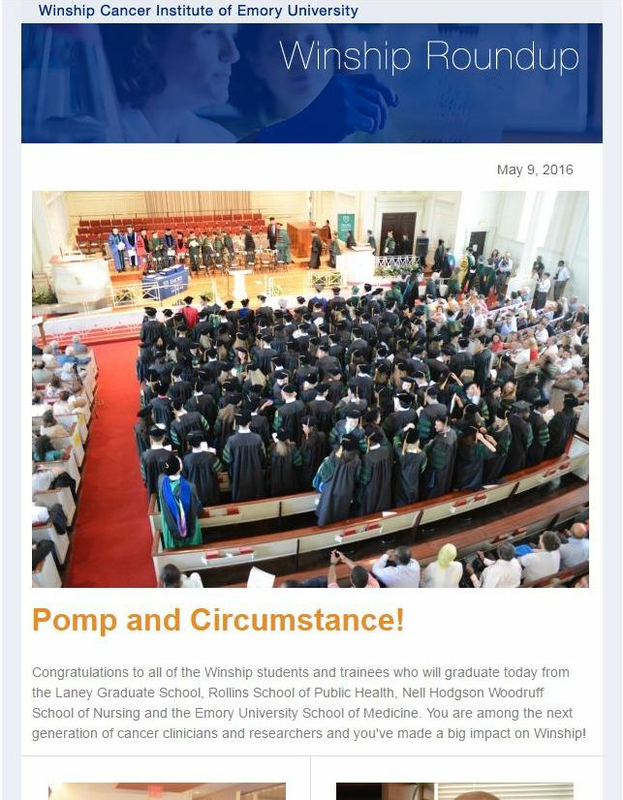 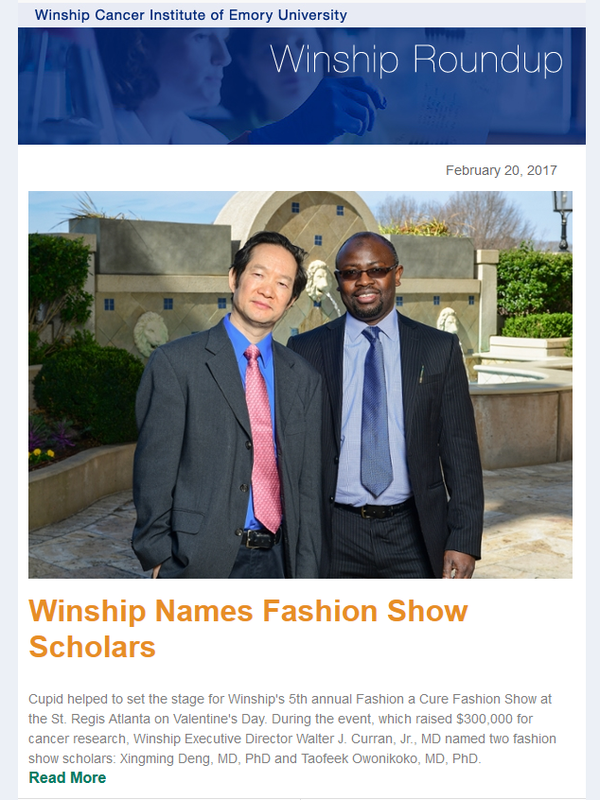 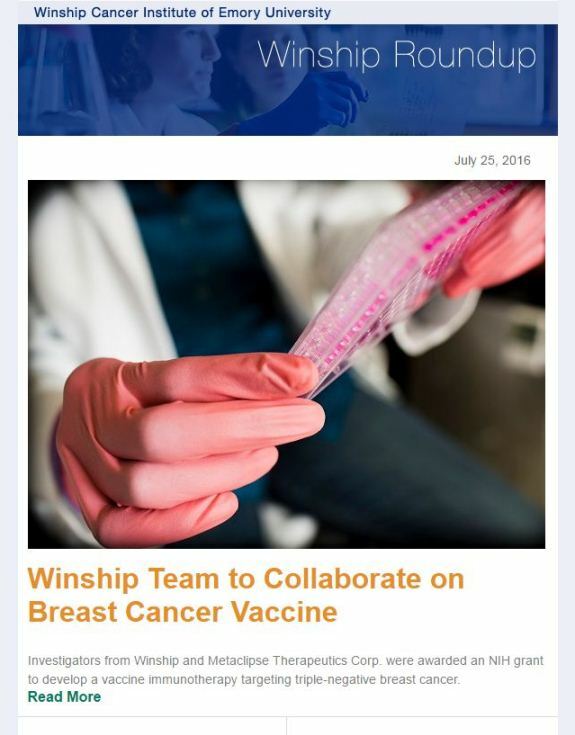 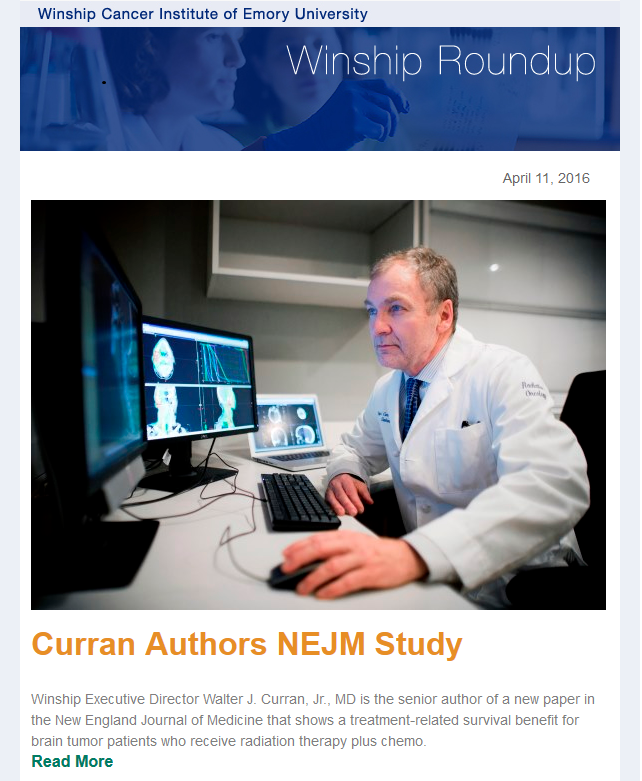 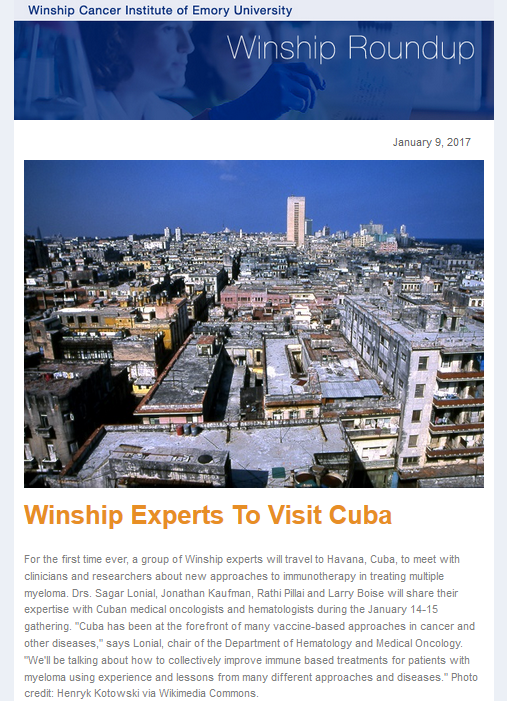 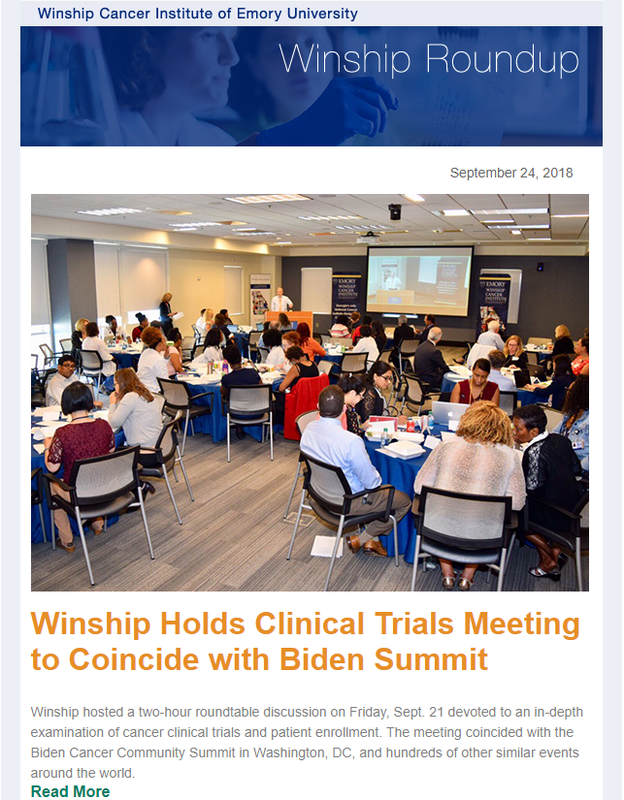 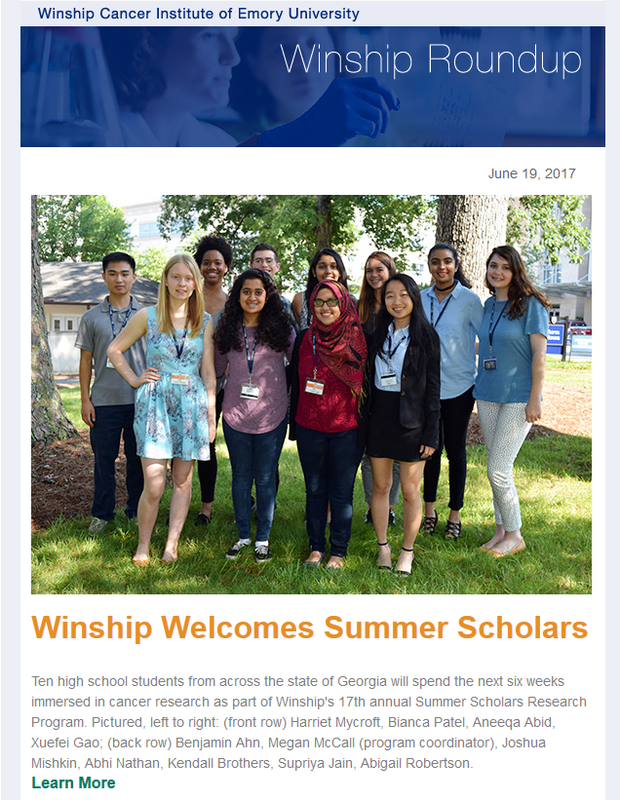 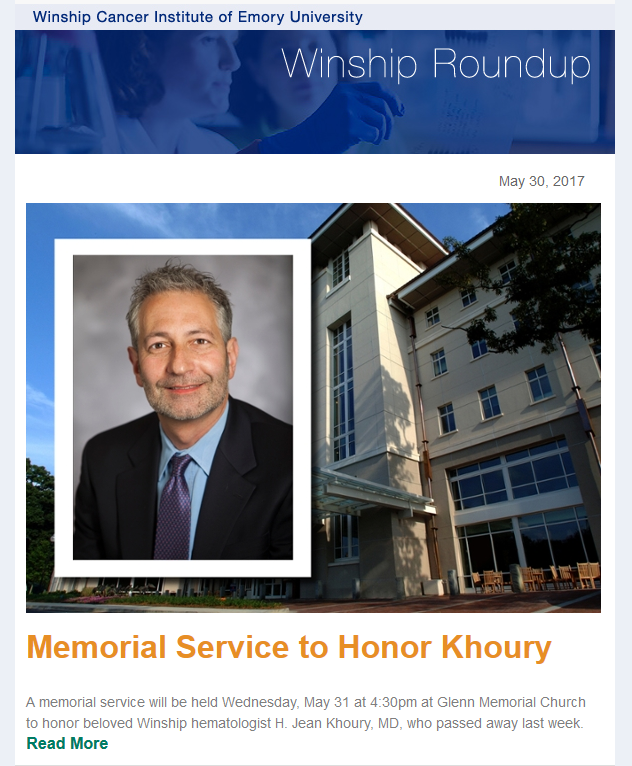 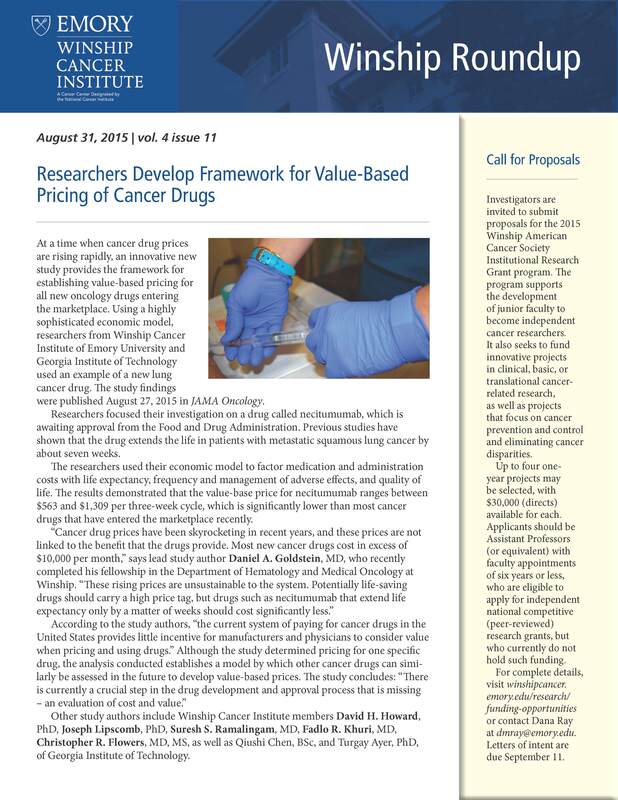 A collection of Winship Roundup newsletters from Winship Cancer Institute of Emory University. 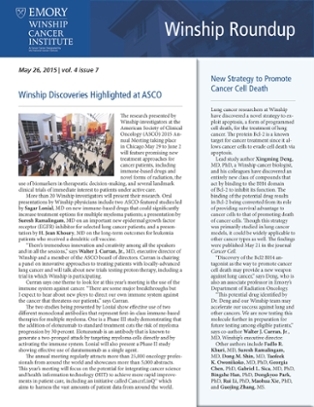 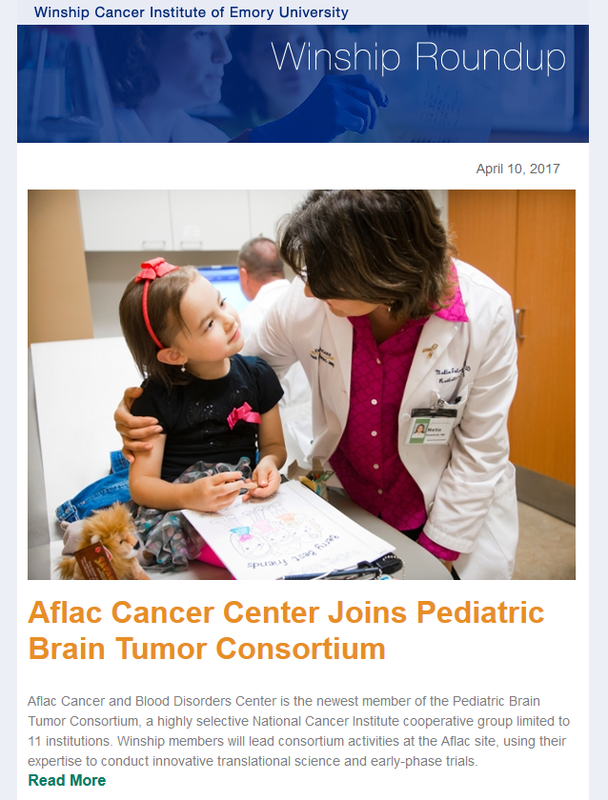 In this issue: ASCO Annual Meeting preview | Dr. Xingming Deng and team discover new strategy to promote cancer cell death | Tips from Dr. Suephy Chen to reduce your risk of melanoma | Congratulations Drs. 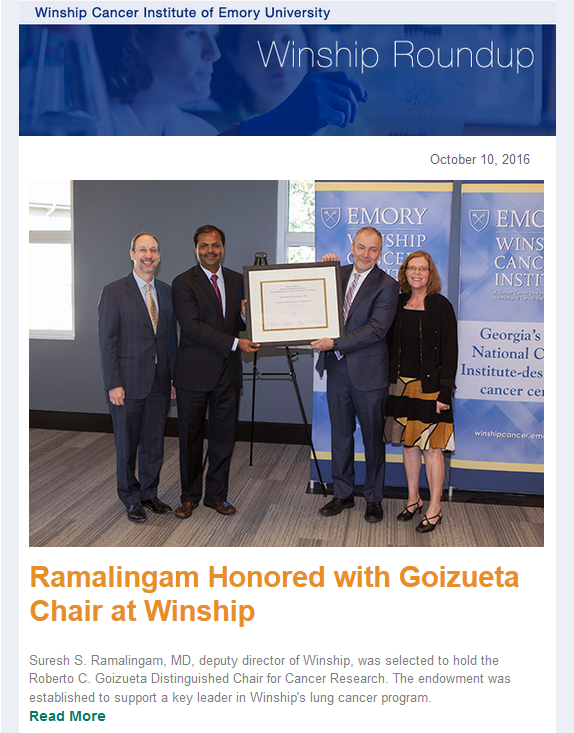 Anita Corbett, Amita Manatunga, and Adeboye Osunkoya | Welcome Dr. Gayathri Srinivasan, and more. 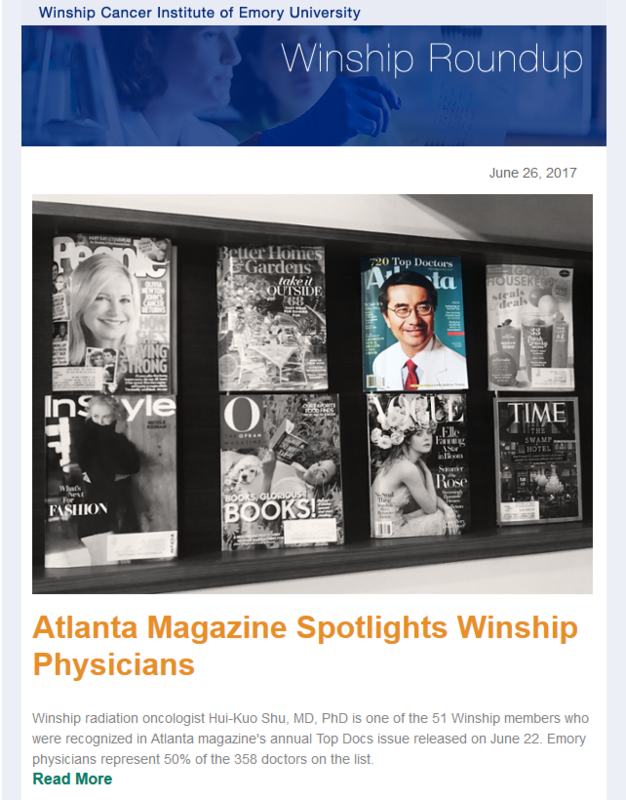 In this issue: Drs. 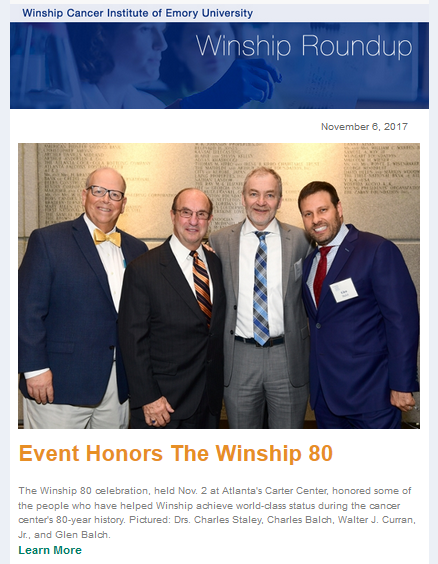 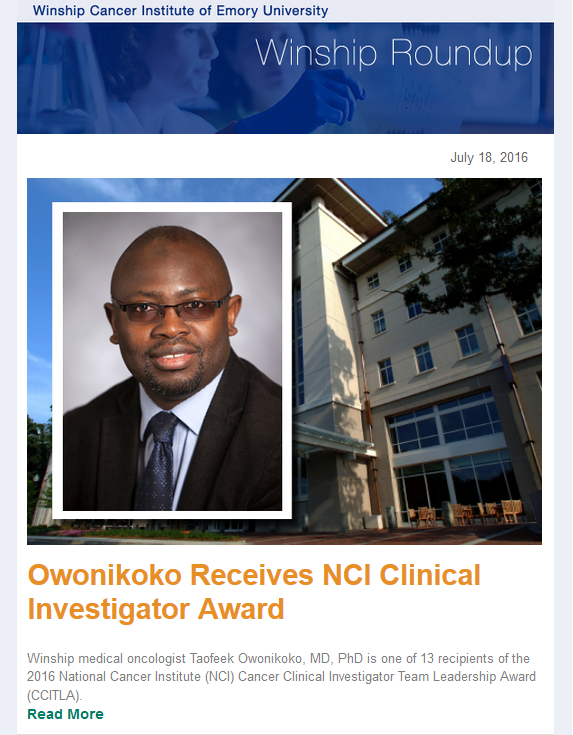 David Gutman and Lee Cooper receive NCI informatics award | Braves president John Schuerholz named grand marshal of Winship 5K | Dr. Carla Berg named new associate director for population sciences | Recurrent prostate study now enrolling patients | Winship's Tan Colbert honored at AJC Nursing Excellence Awards | Infusion center "cruise week," and more. 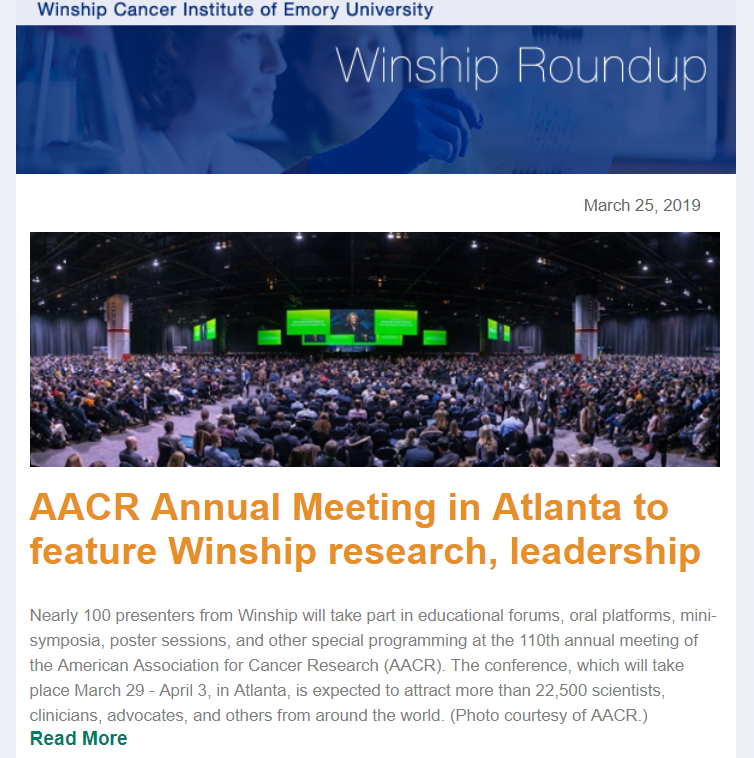 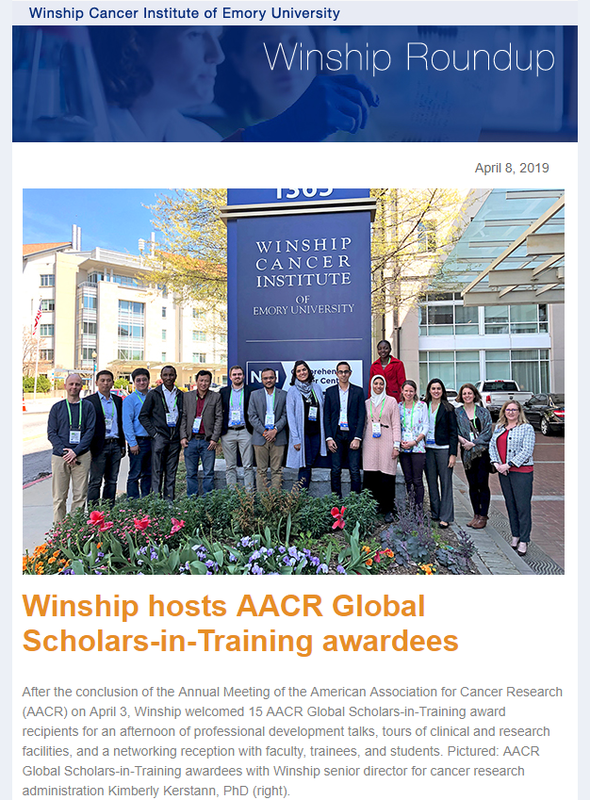 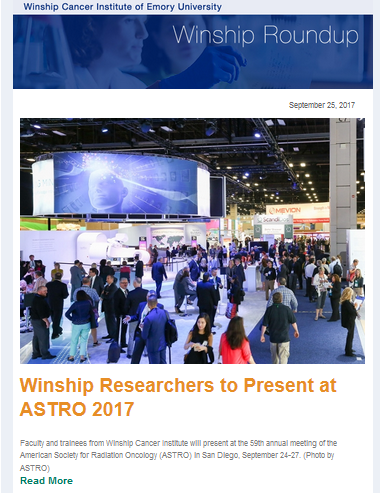 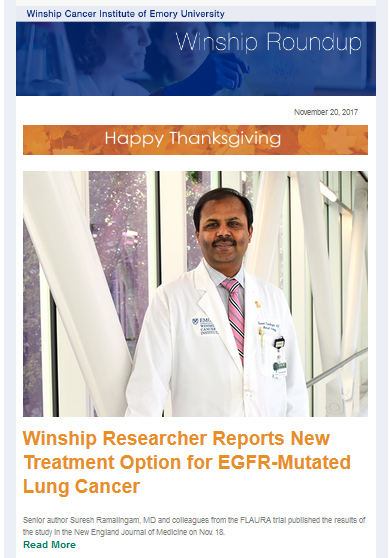 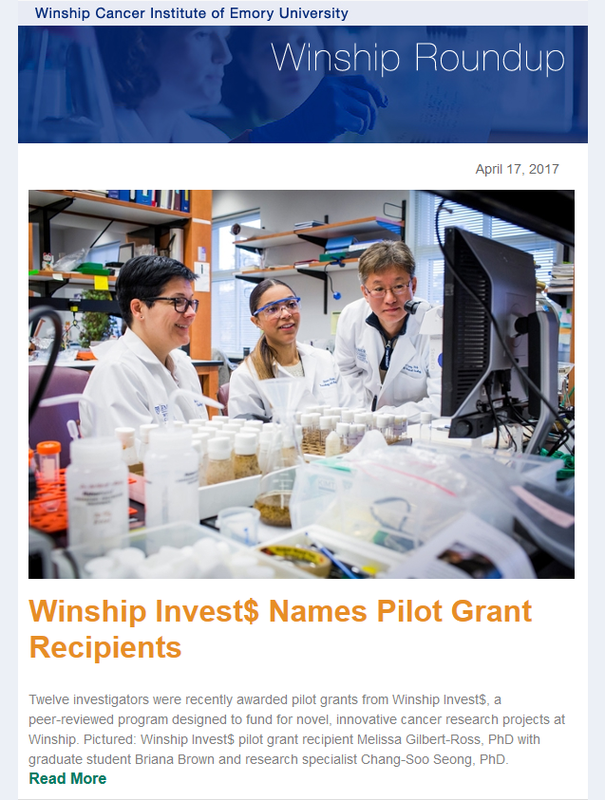 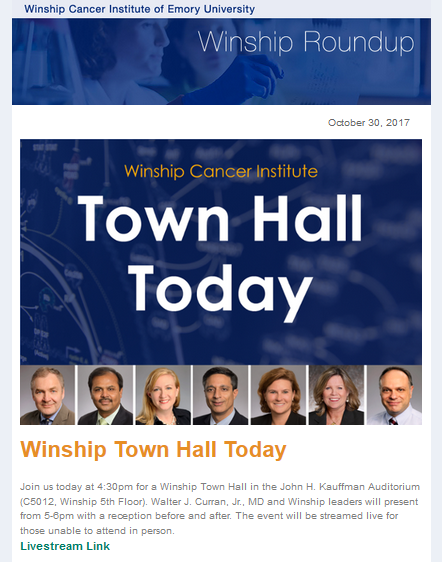 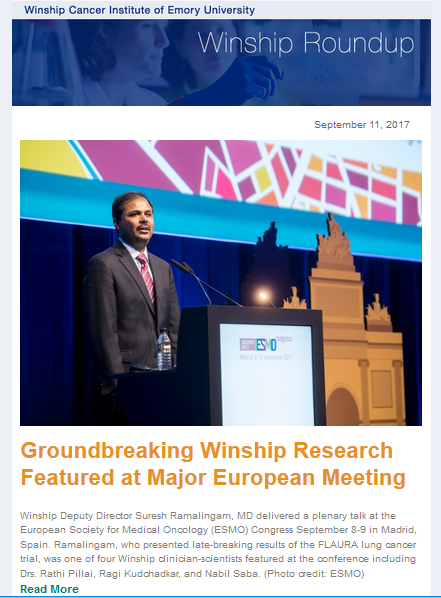 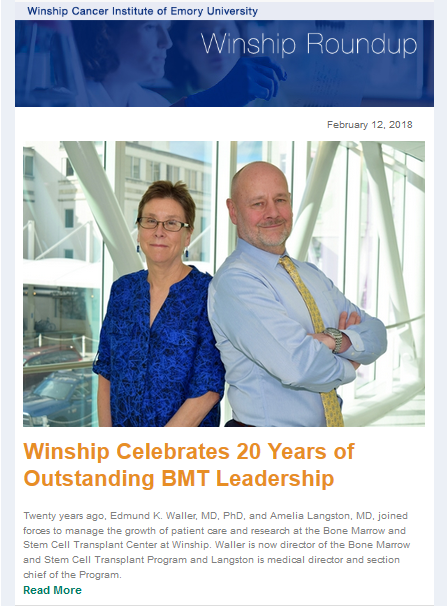 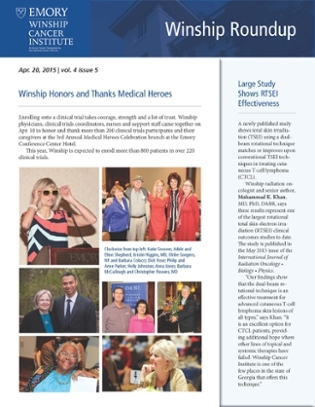 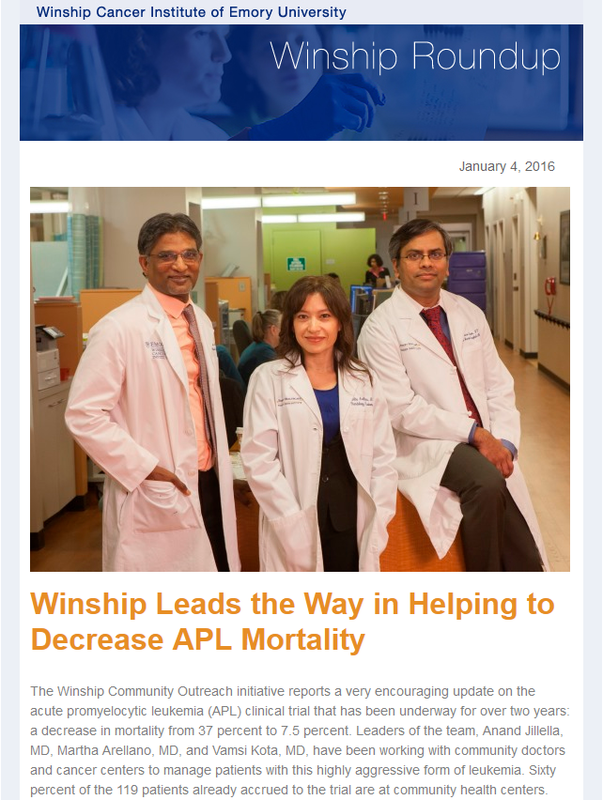 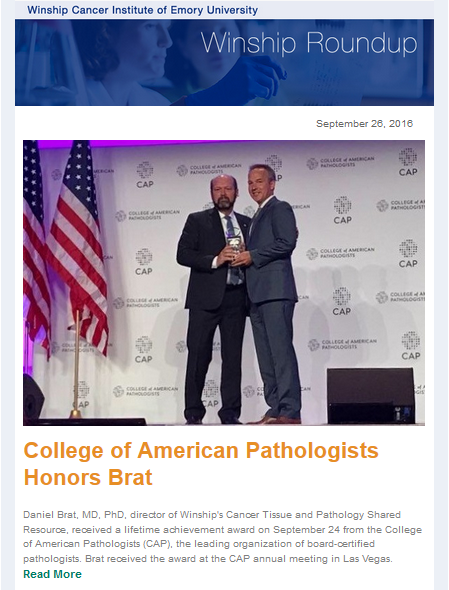 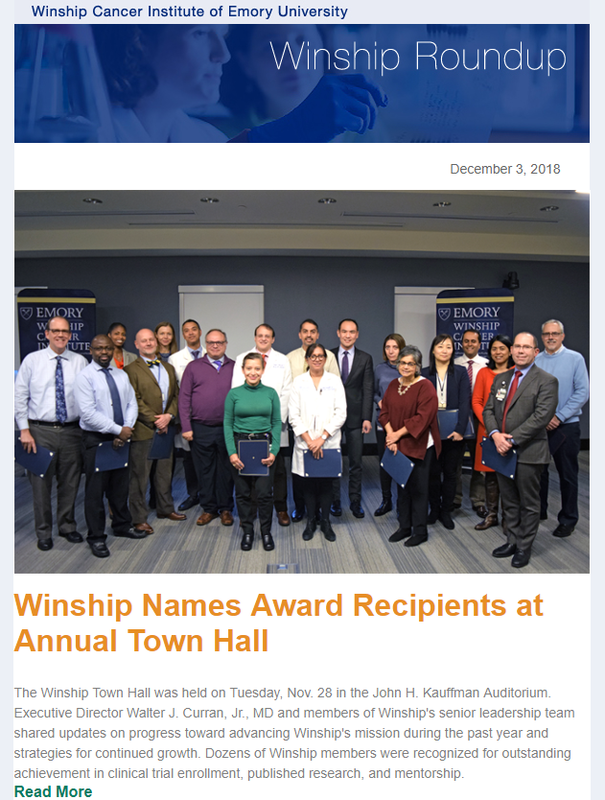 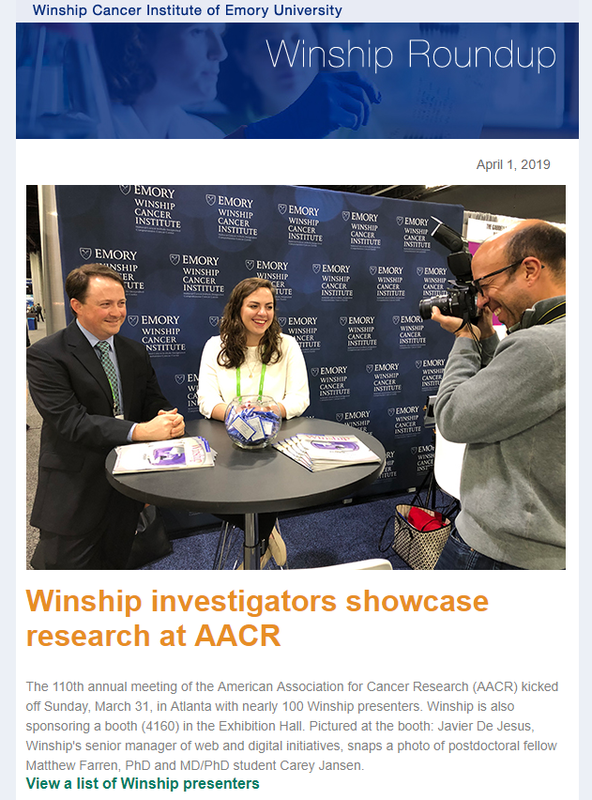 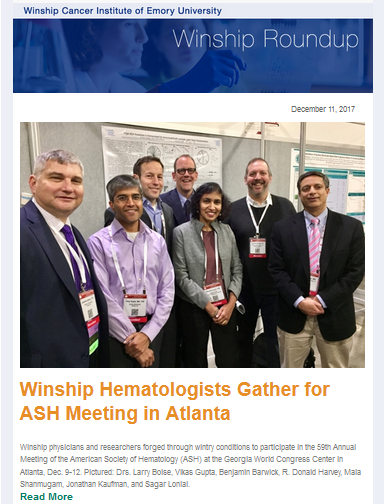 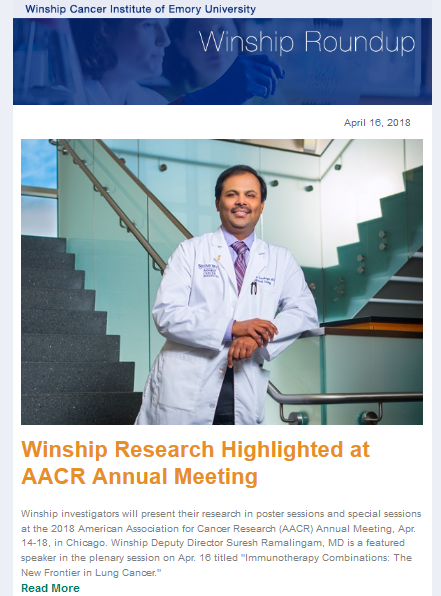 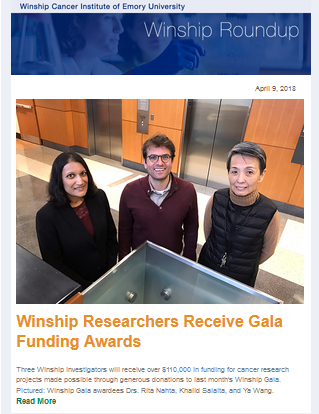 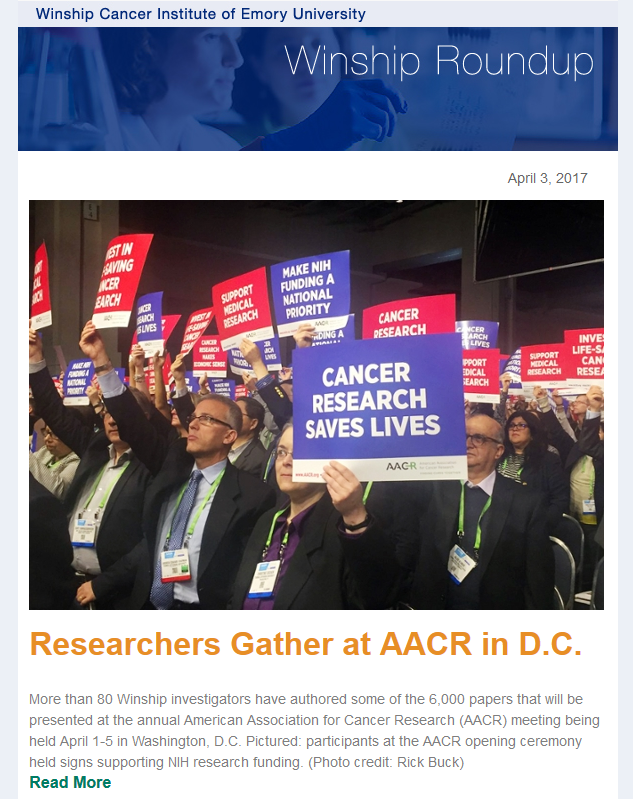 In this issue: Winship honors and thanks its medical heroes | Dr. Mohammad Khan shows RTSEI effectiveness in large study | Highlights from Winship Town Hall | AACR Annual Meeting preview, and more. 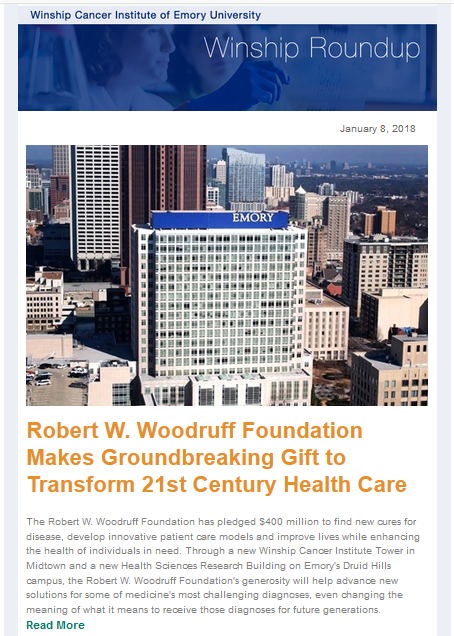 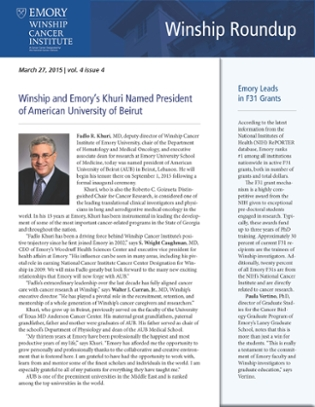 In this issue: Fadlo R. Khuri, MD named president of American University of Beirut | Emory leads nation in F31 grants | Winship pilot grant recipients announced | Radiation Oncology launches new website | Colorectal cancer educational program for employees, and more. 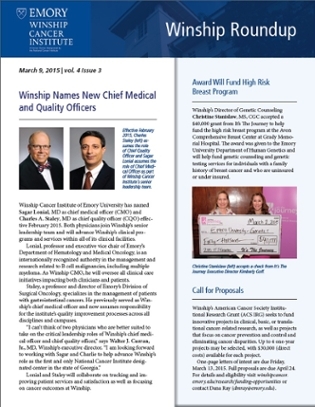 In this issue: Dr. Sagar Lonial named new chief medical officer | Dr. Charles Staley named new chief quality officer | Christine Stanislaw receives award to fund high risk breast program | Call for proposals for Winship's American Cancer Society Institutional Research Grant | Leadership changes and appointments | Dr. Subhas Mukherjee designs Stem Cells and Development cover | Jamie King and MaKendra Umstead to present at Minority Research forum, and more. 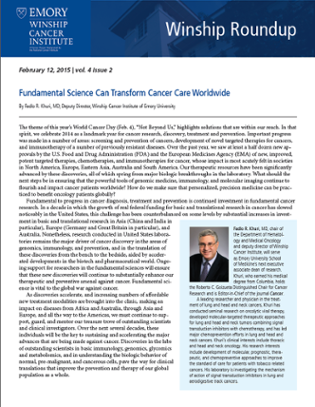 In this issue: Dr. Fadlo R. Khuri reflects on World Cancer Day | Research from Drs. 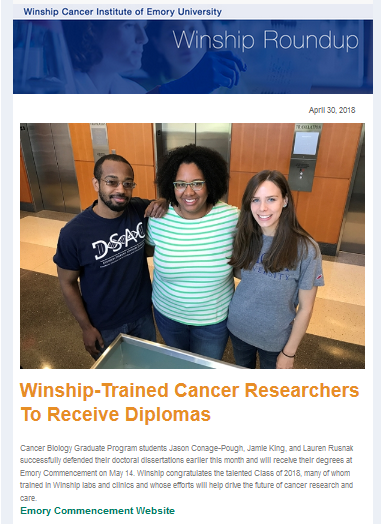 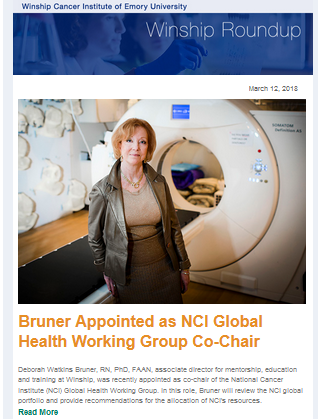 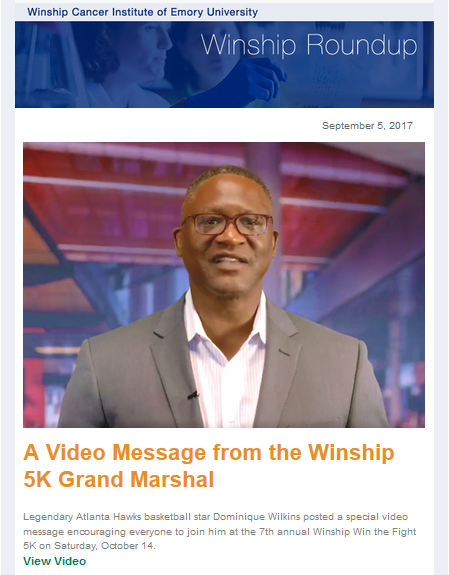 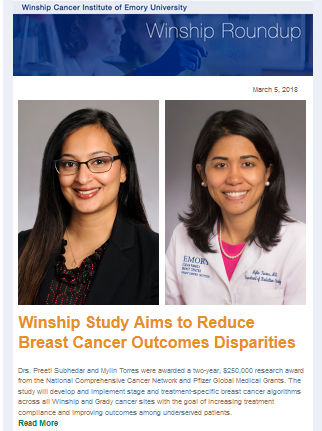 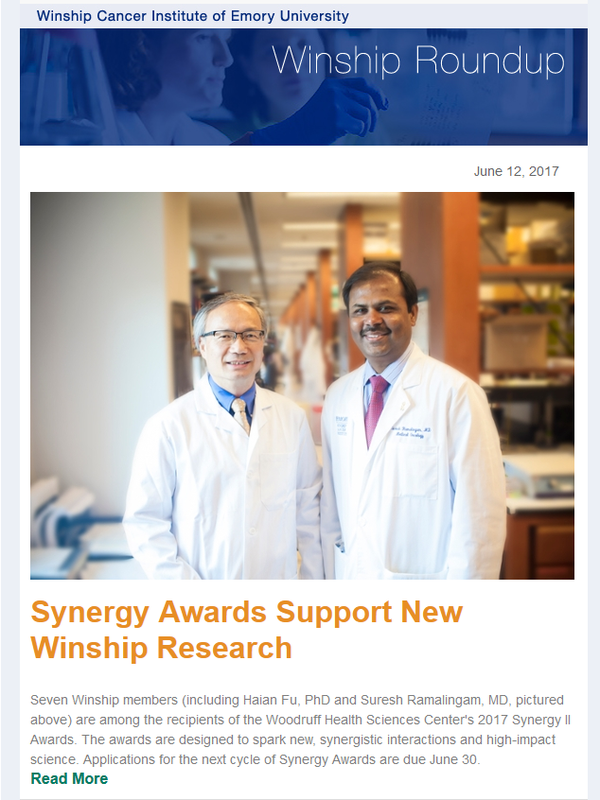 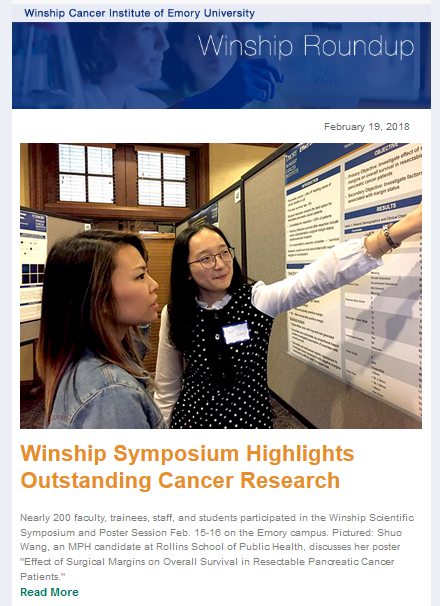 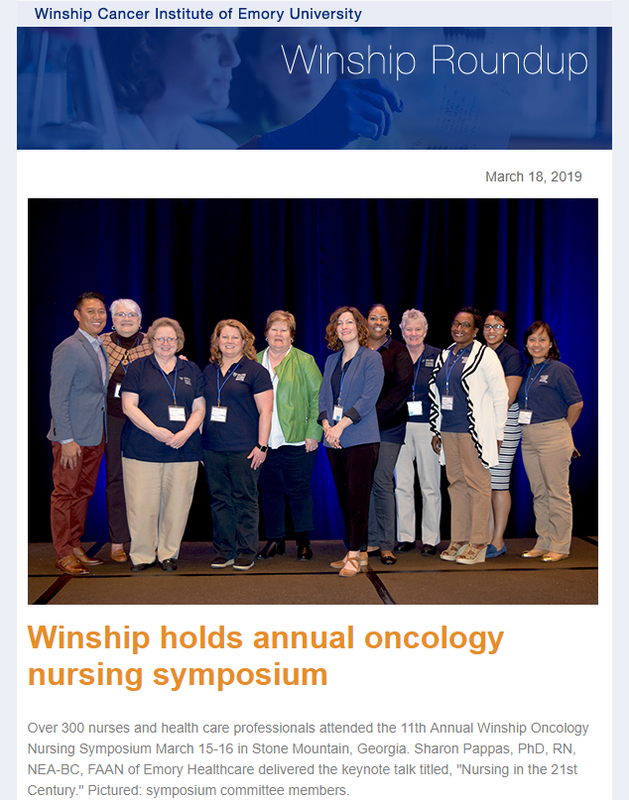 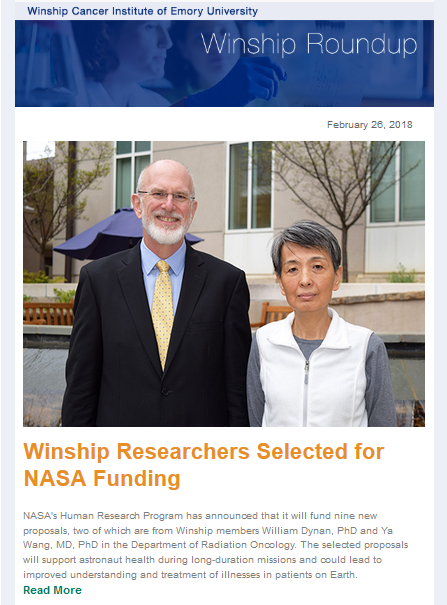 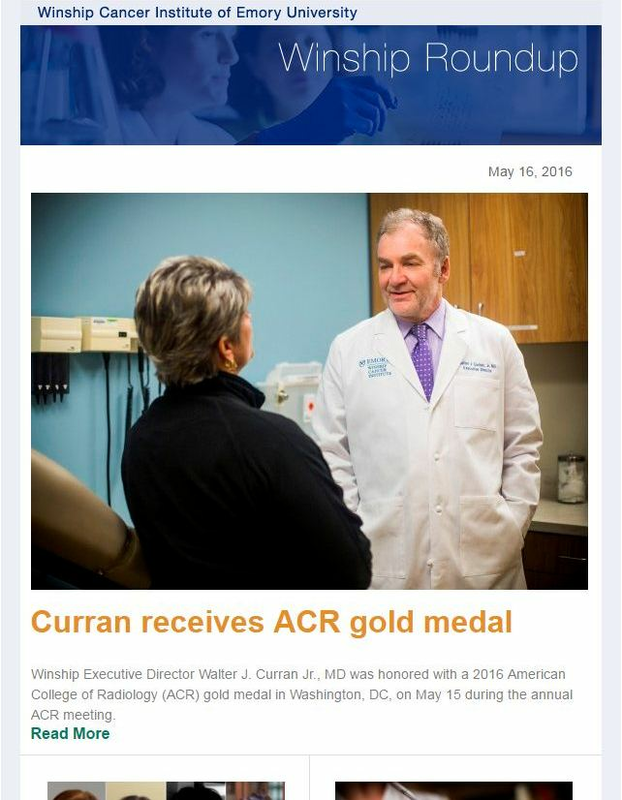 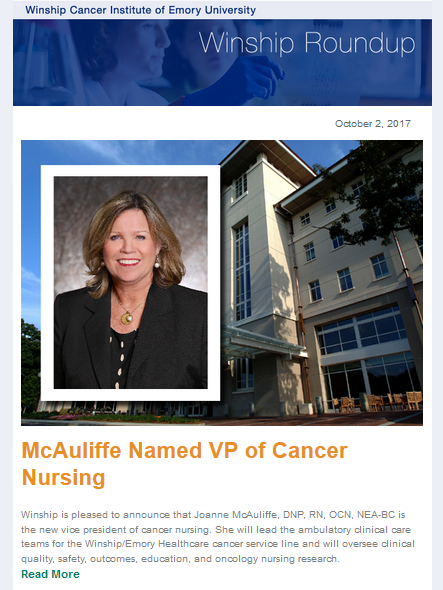 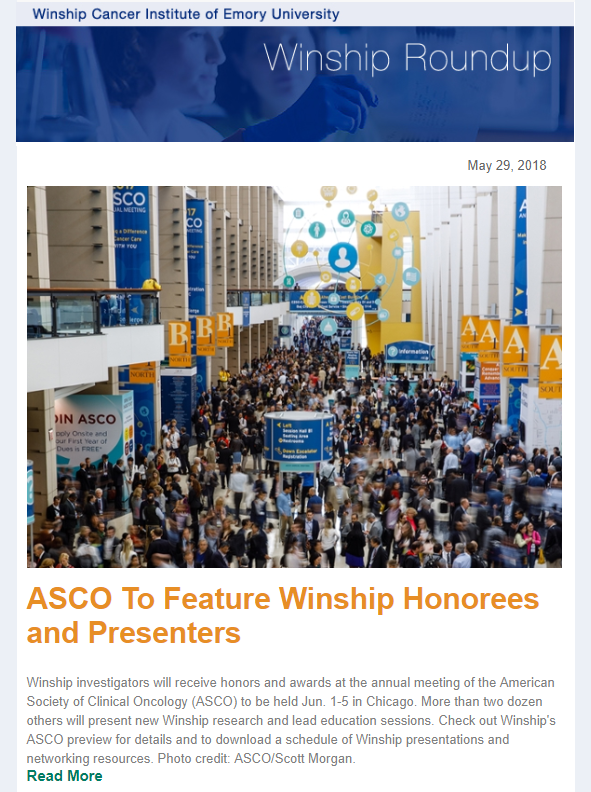 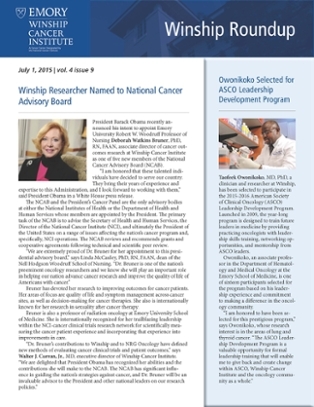 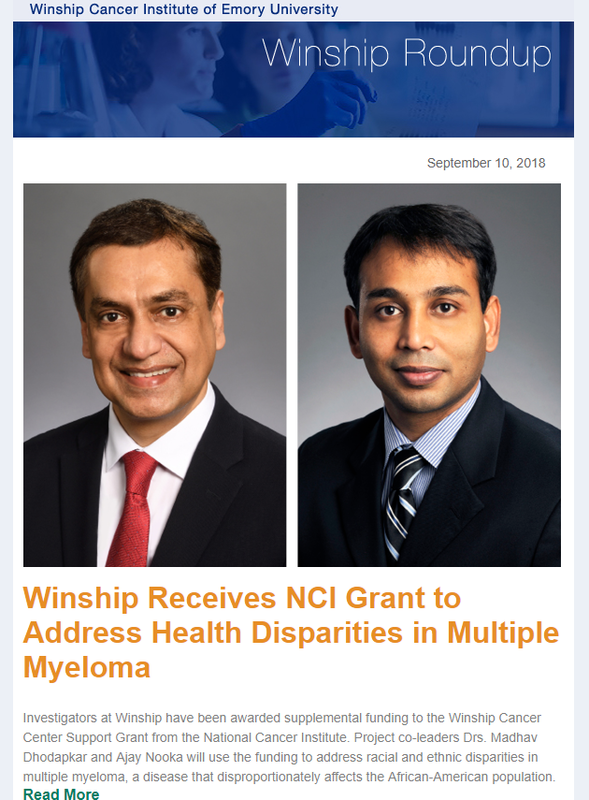 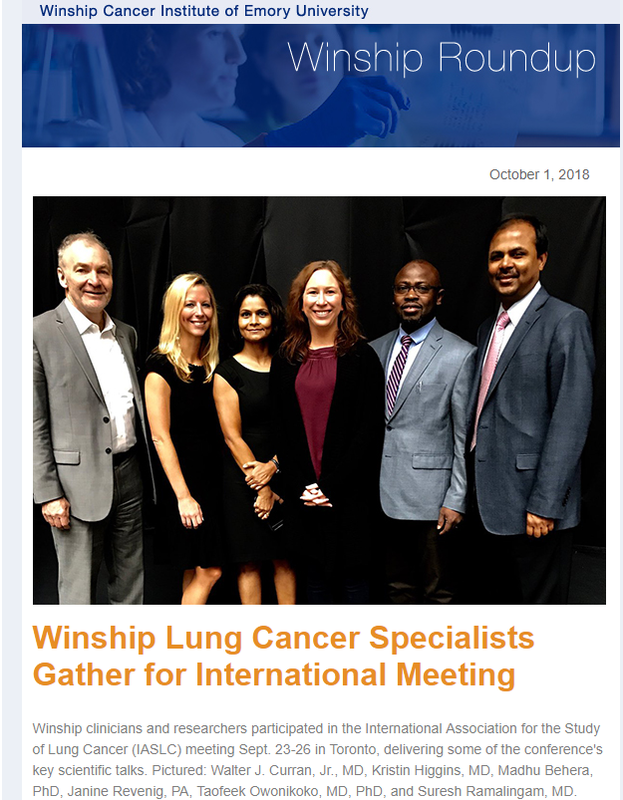 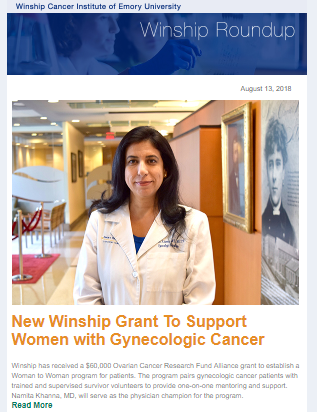 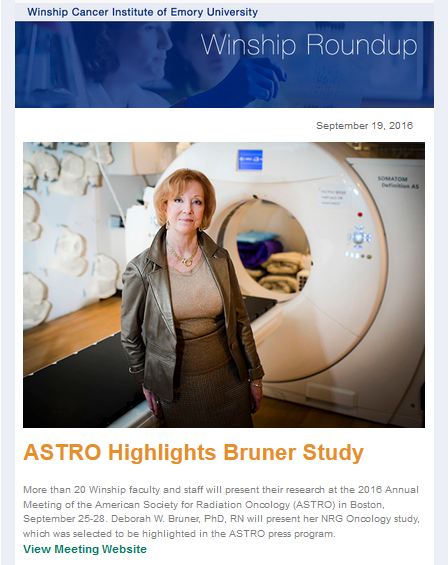 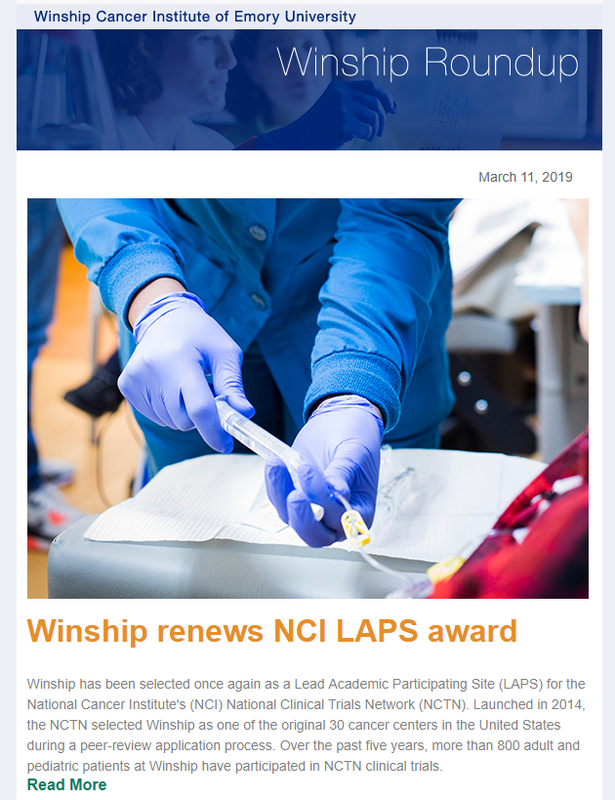 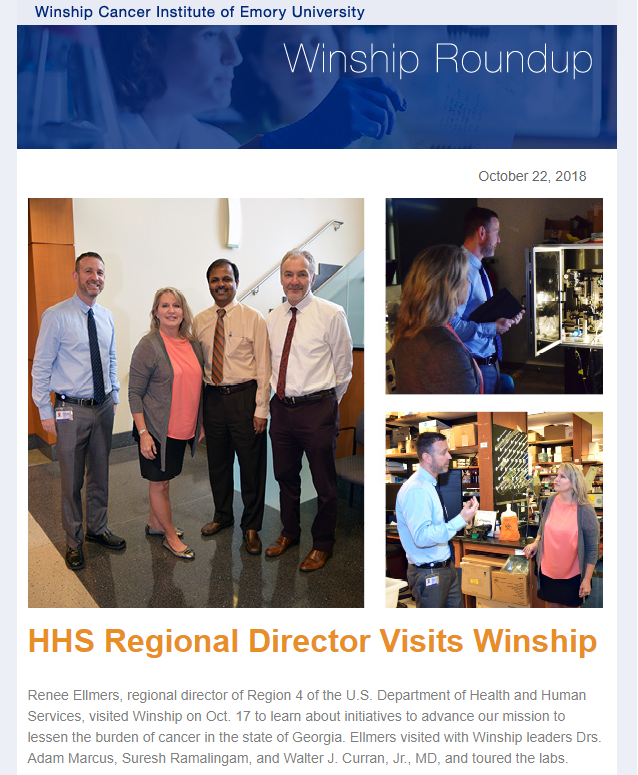 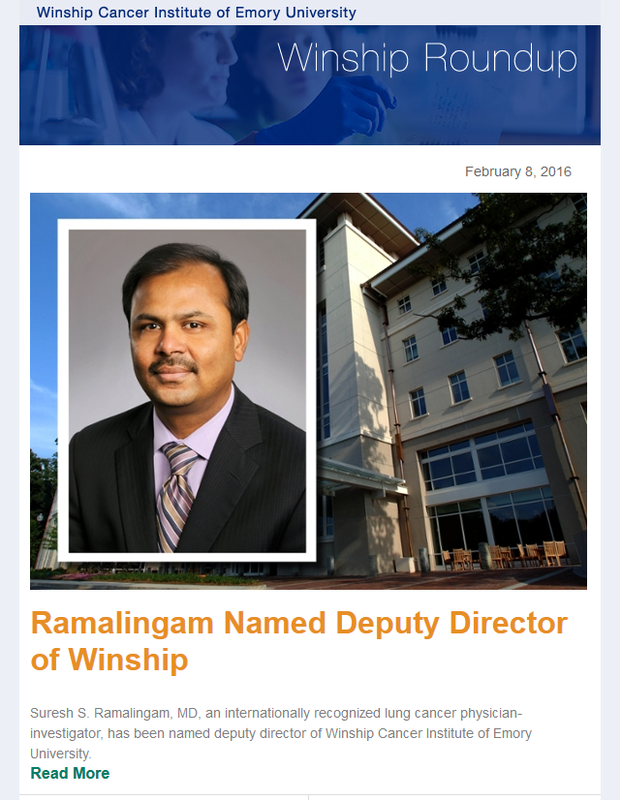 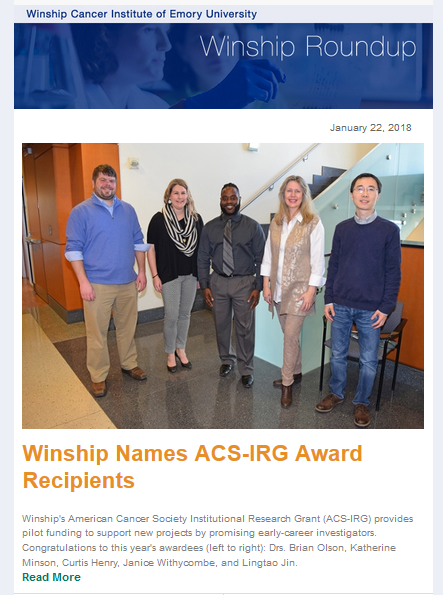 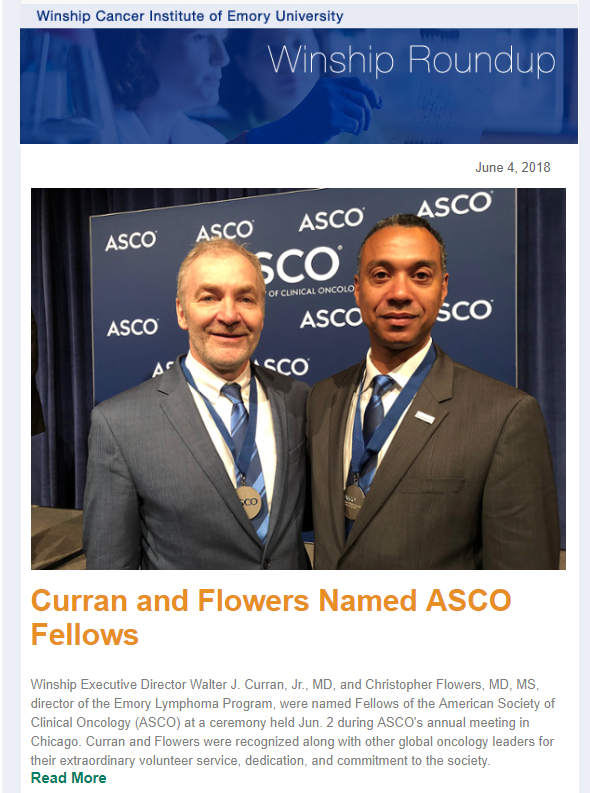 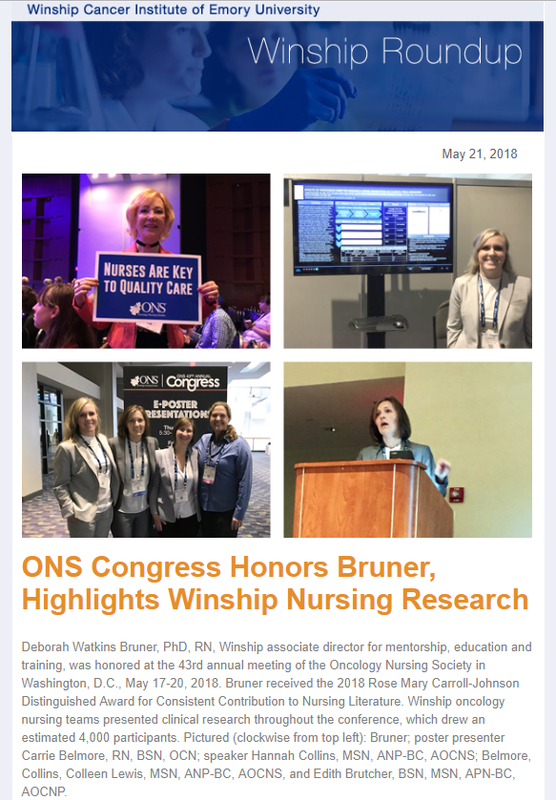 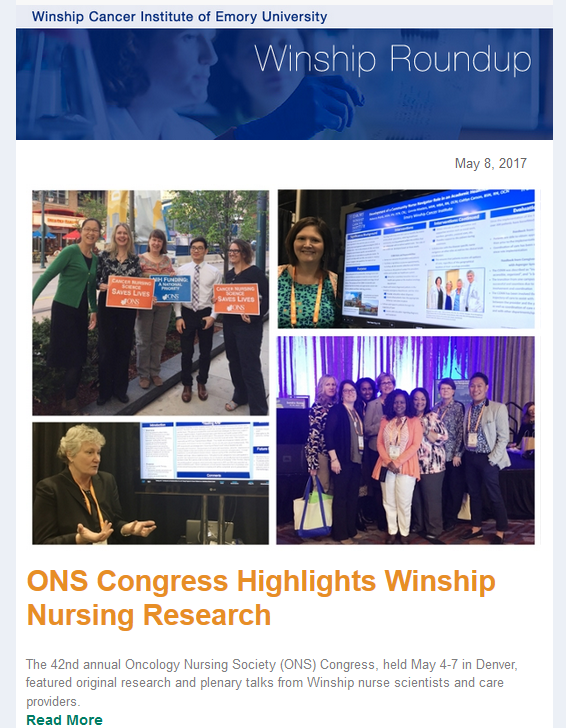 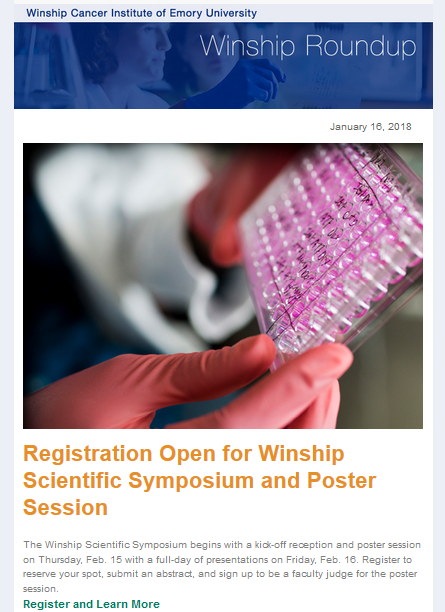 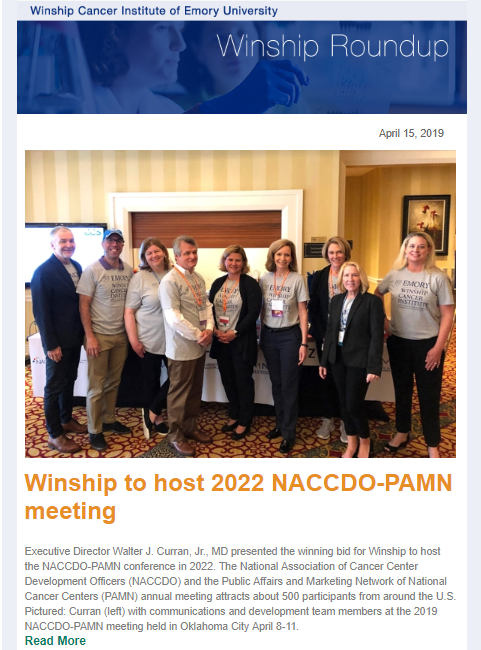 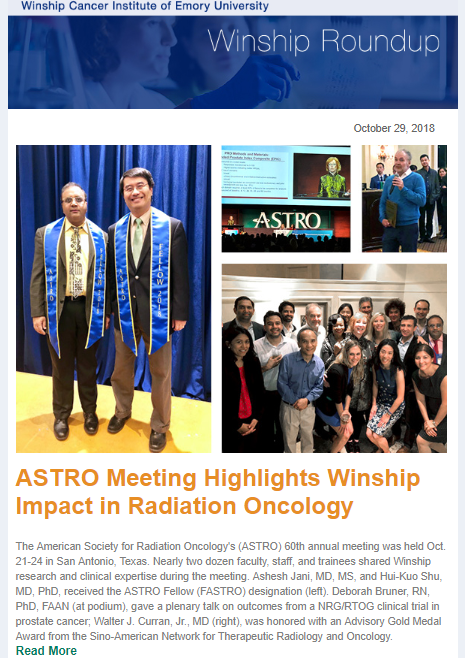 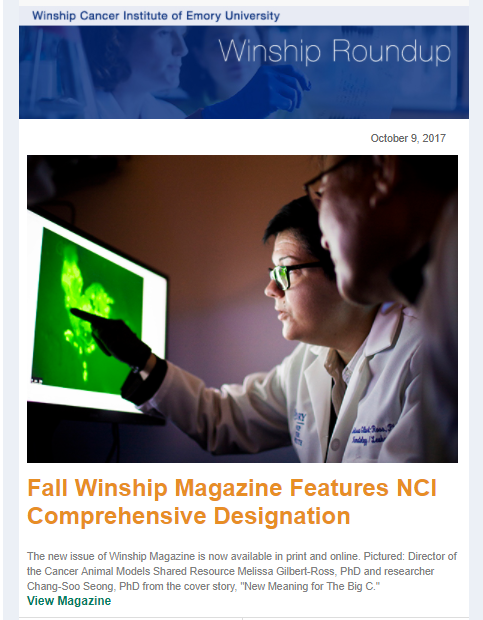 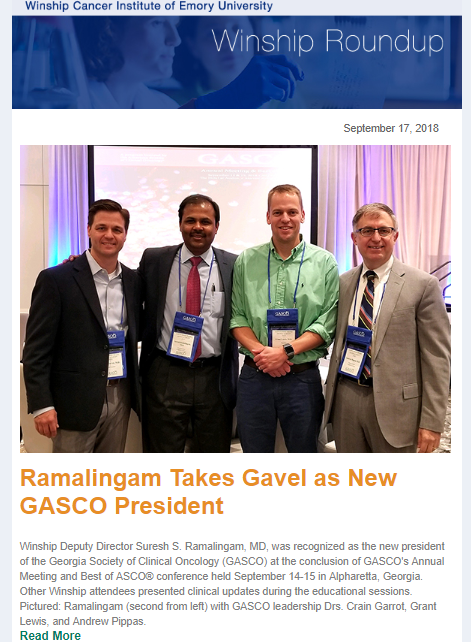 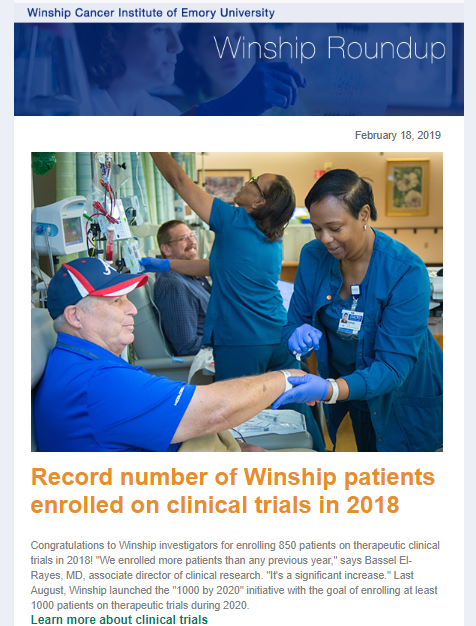 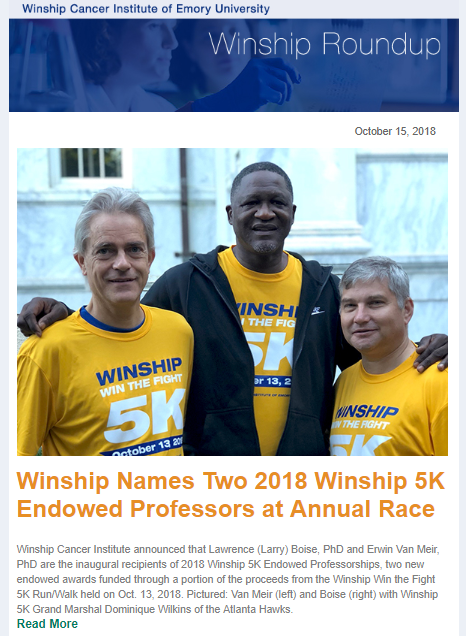 Walter J. Curran, Jr. and Suresh Ramalingam featured in new ASCO Annual Progress Report | Dynan lab receives $1.15 million NASA grant | Charles Harris 10K Run for Leukemia | Welcome new staff | Registration open for Winship Oncology Nursing Symposium, and more. 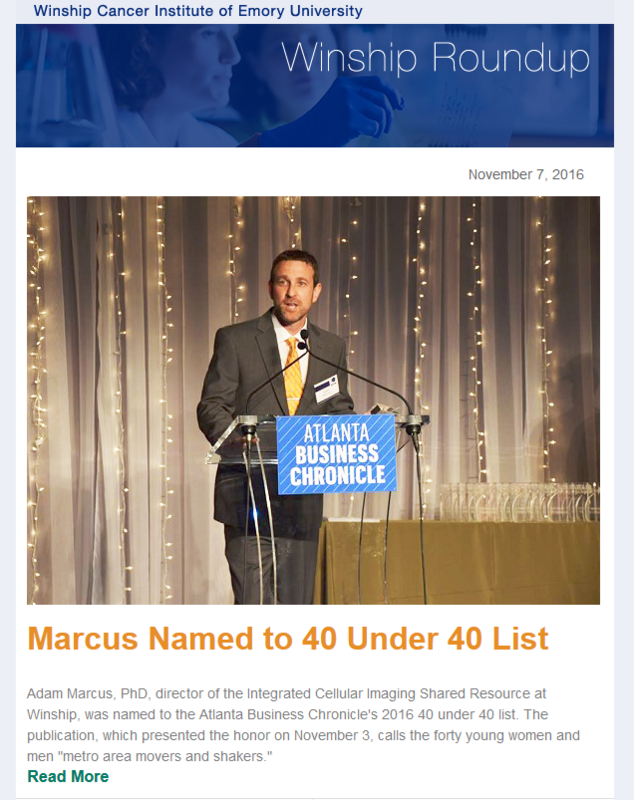 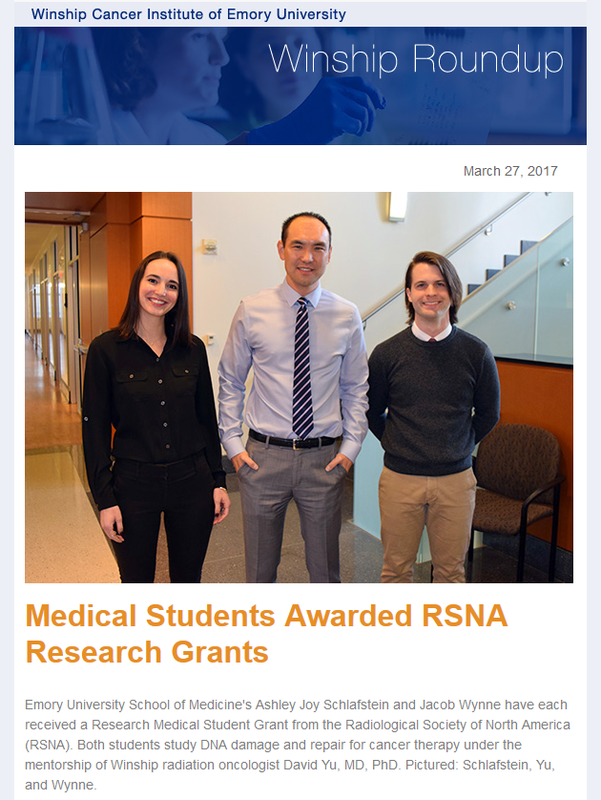 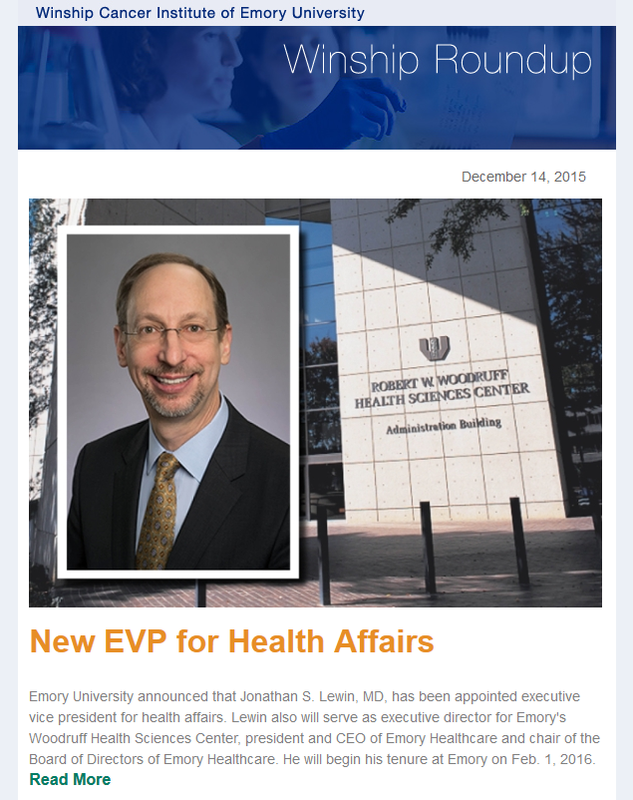 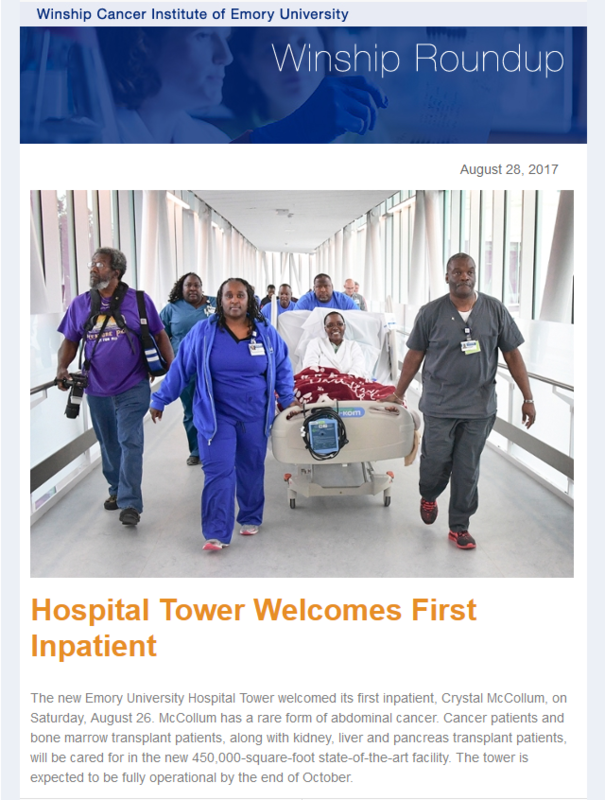 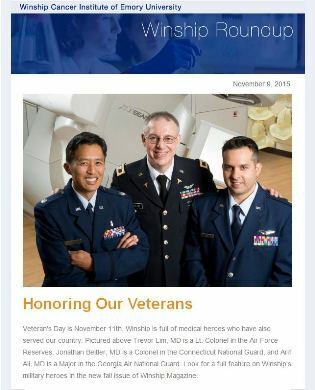 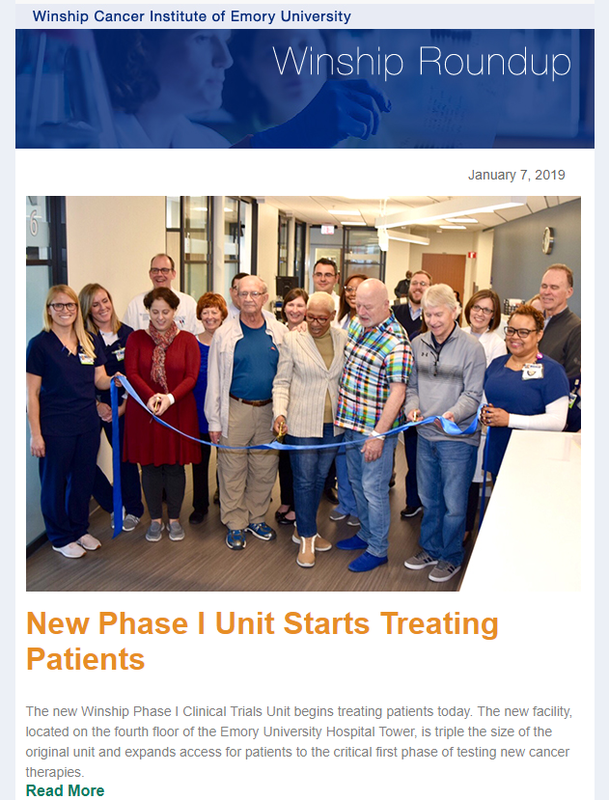 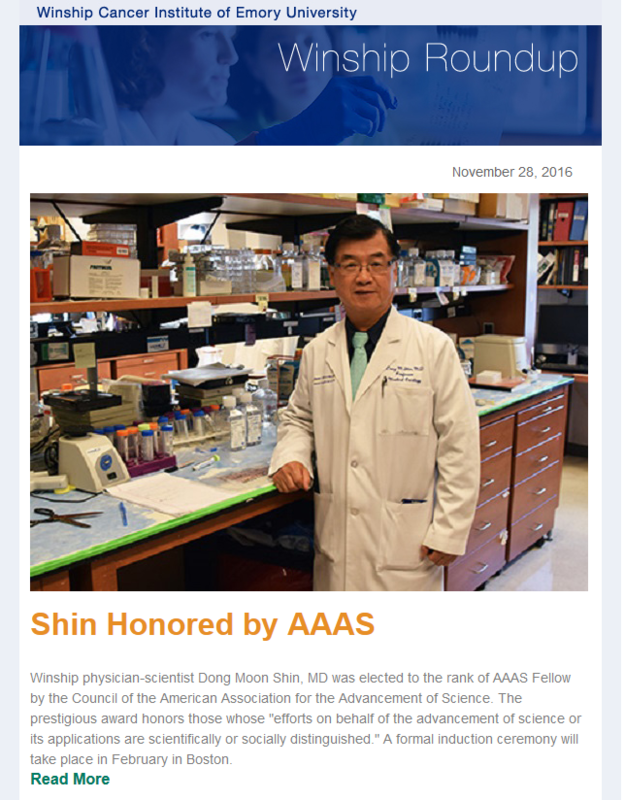 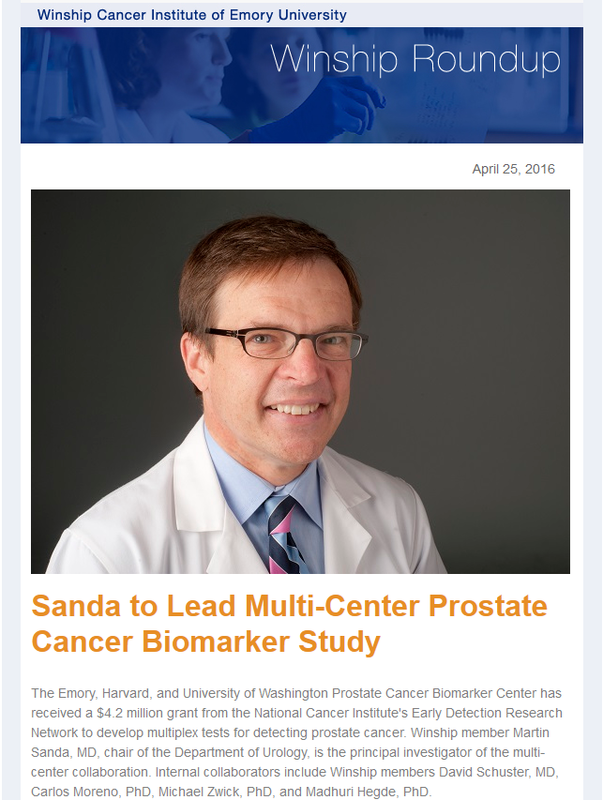 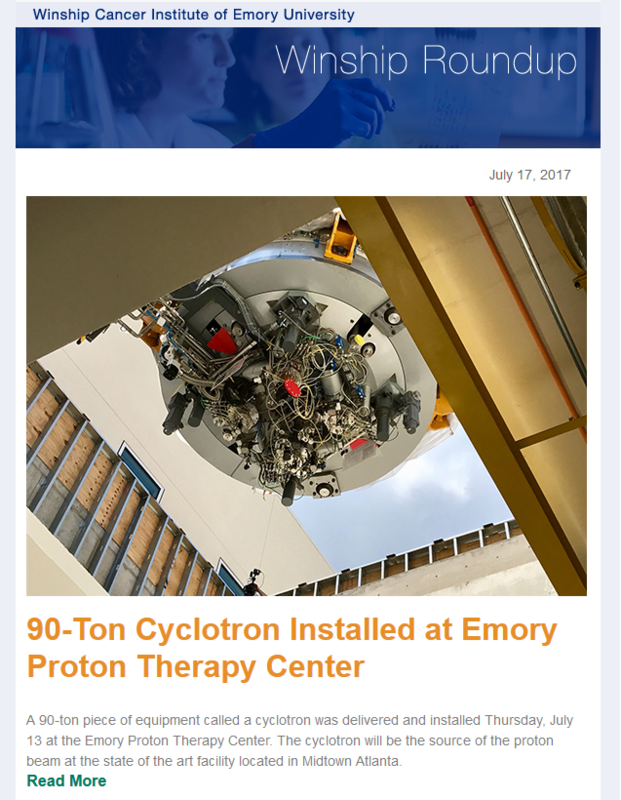 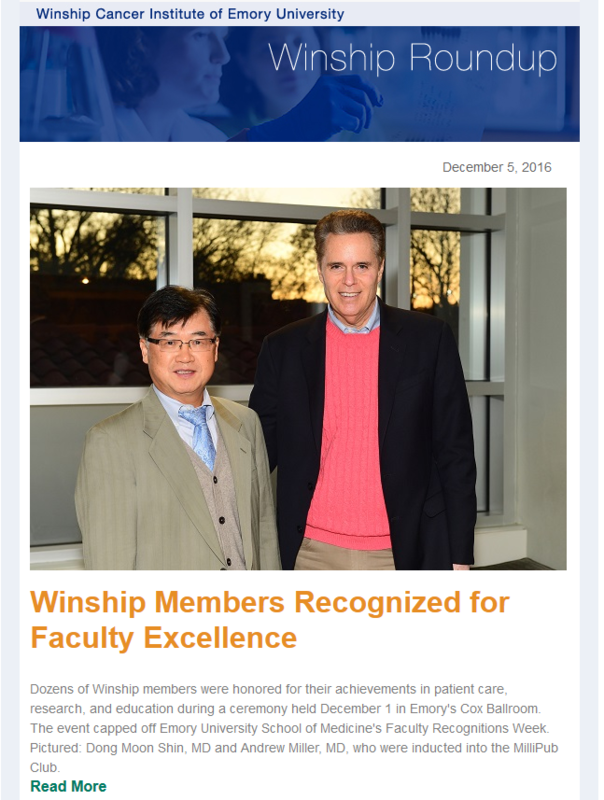 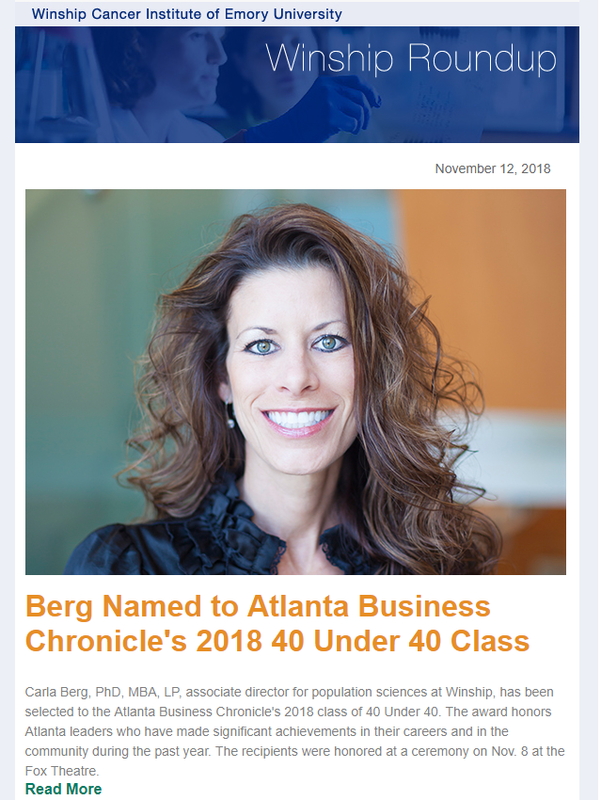 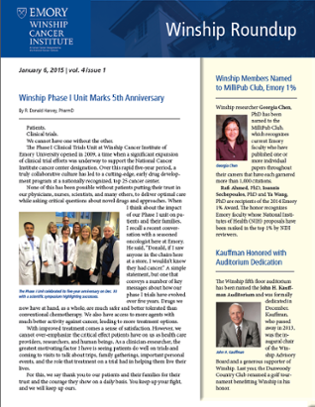 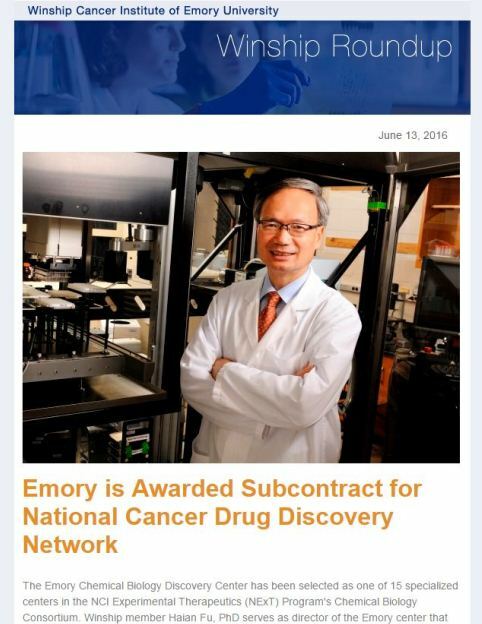 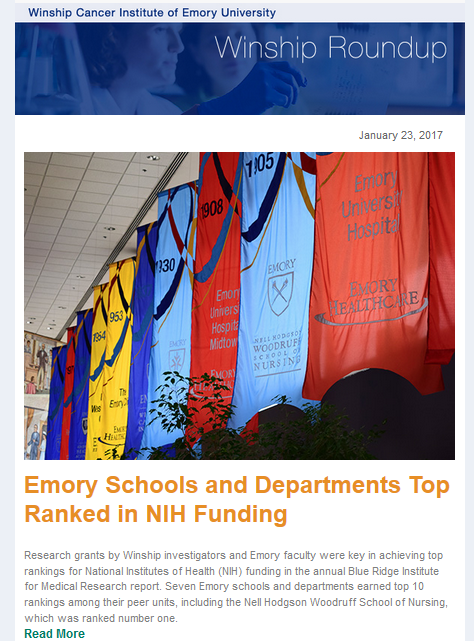 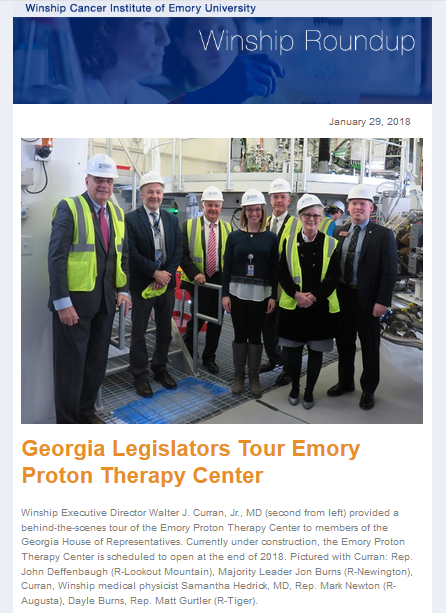 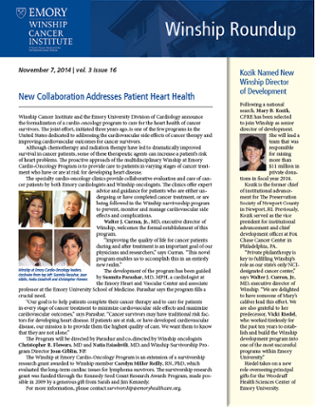 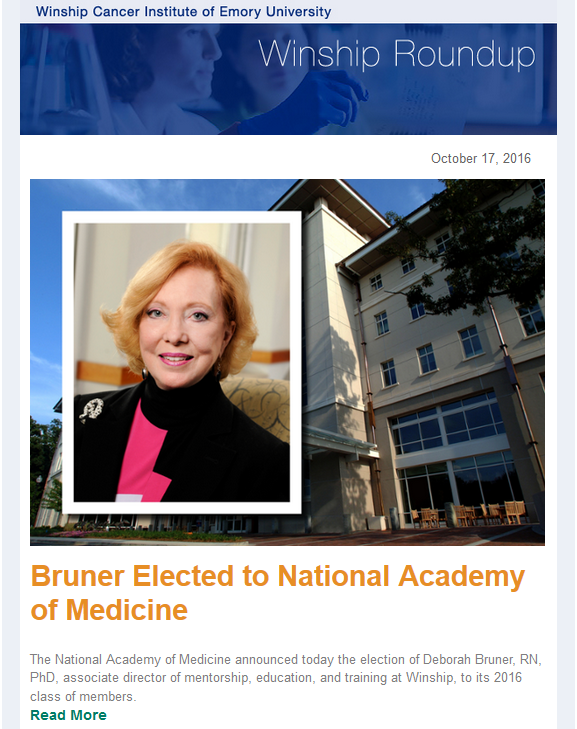 In this issue: Phase I Unit marks 5th anniversary | Dr. Georgia Chen named to Emory MilliPub Club | Drs. 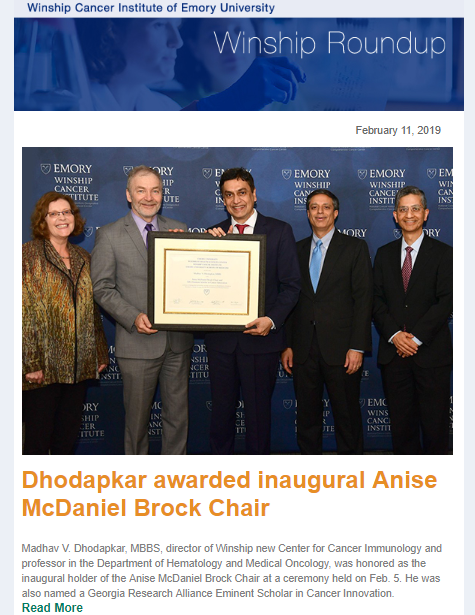 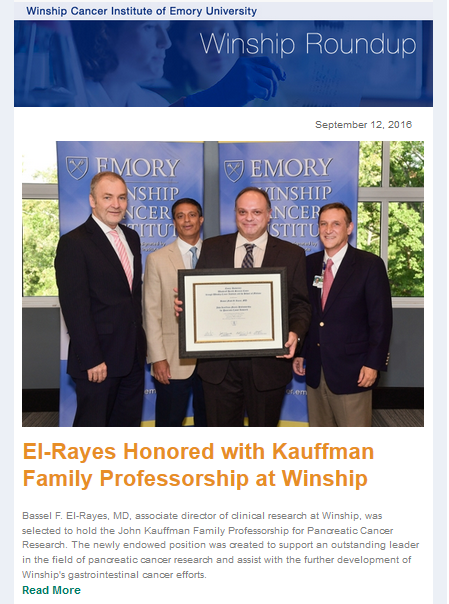 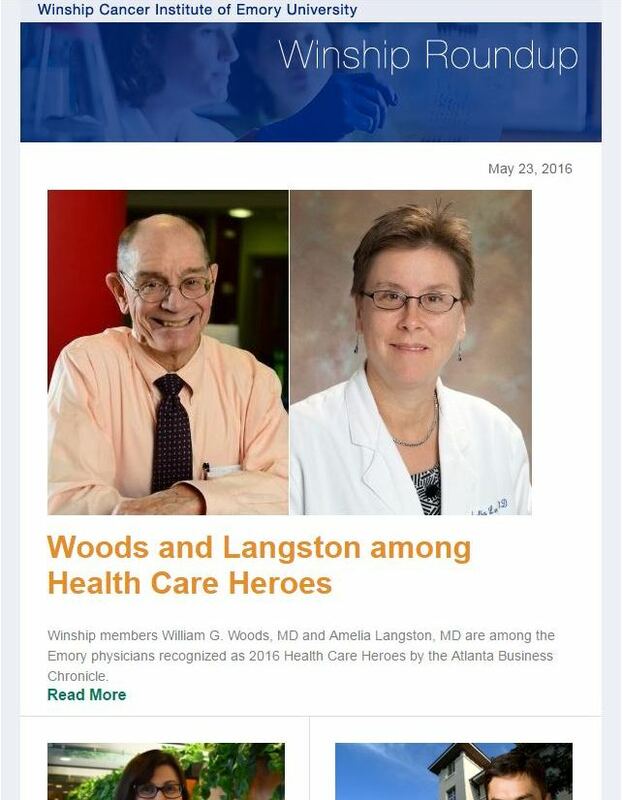 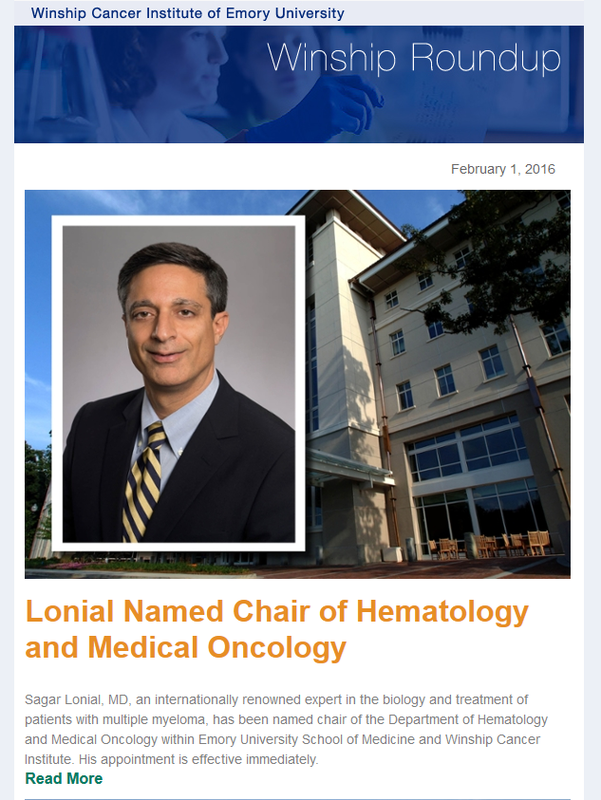 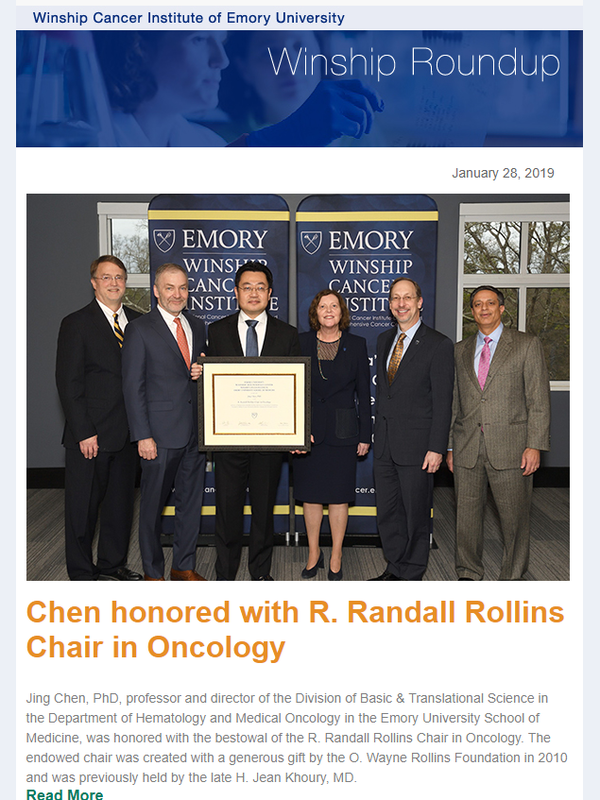 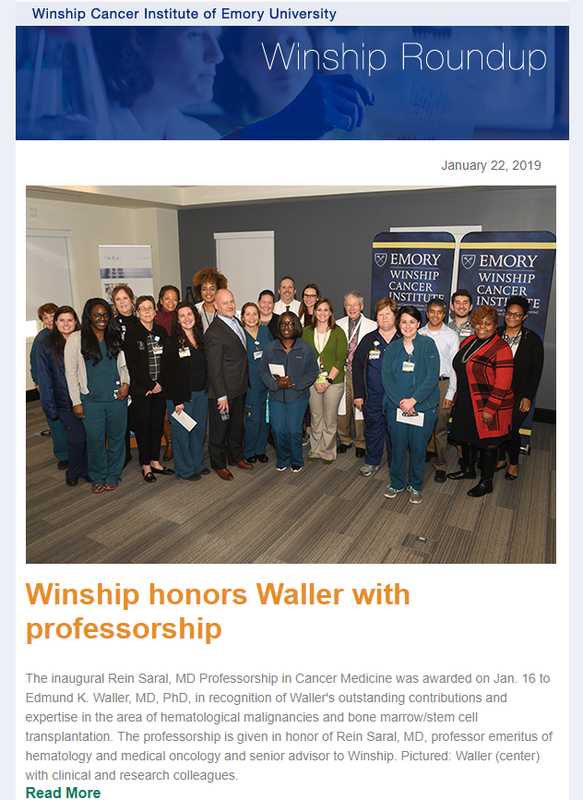 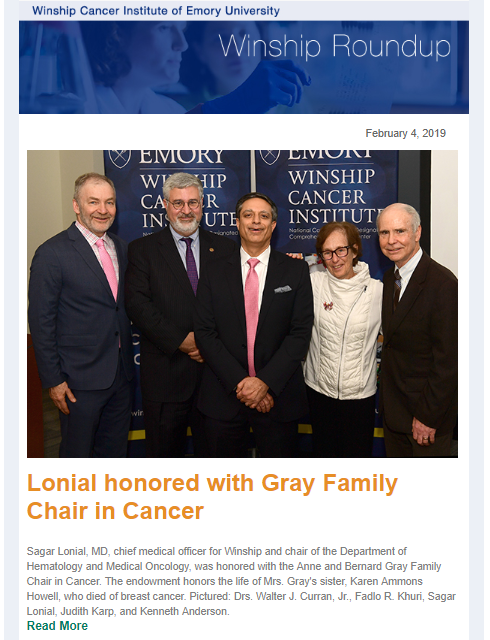 Rafi Ahmed, Ioannis Sechopoulos and Ya Wang receive Emory 1% awards | John H. Kauffman honored with auditorium dedication | Tips on coping after cancer treatment from social worker Joy McCall | Accolades for Drs. 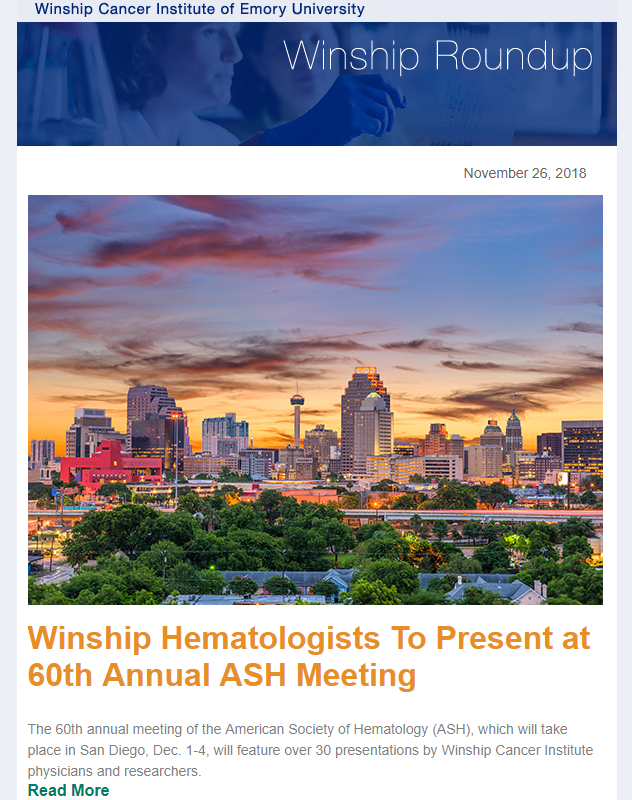 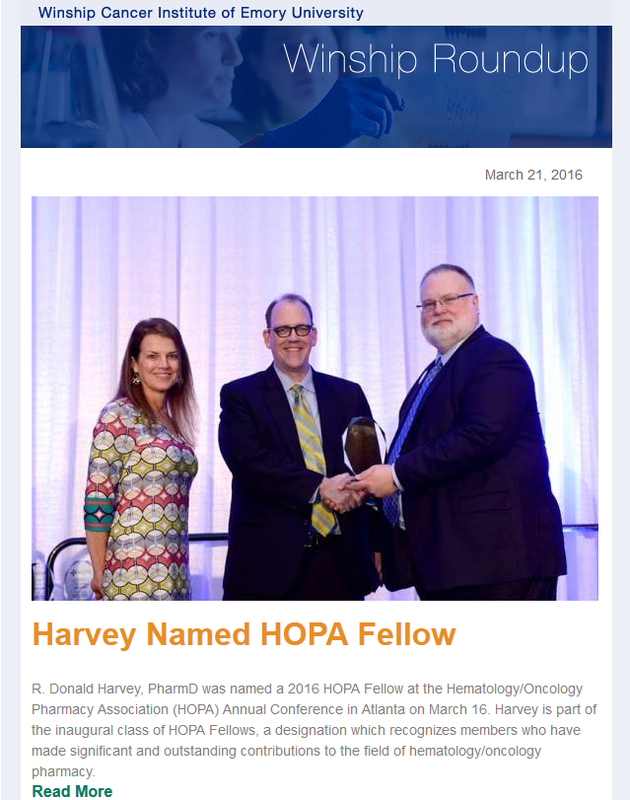 Walter J. Curran, Jr. and Huw Davies | Multiple myeloma team honored at ASH, and more.